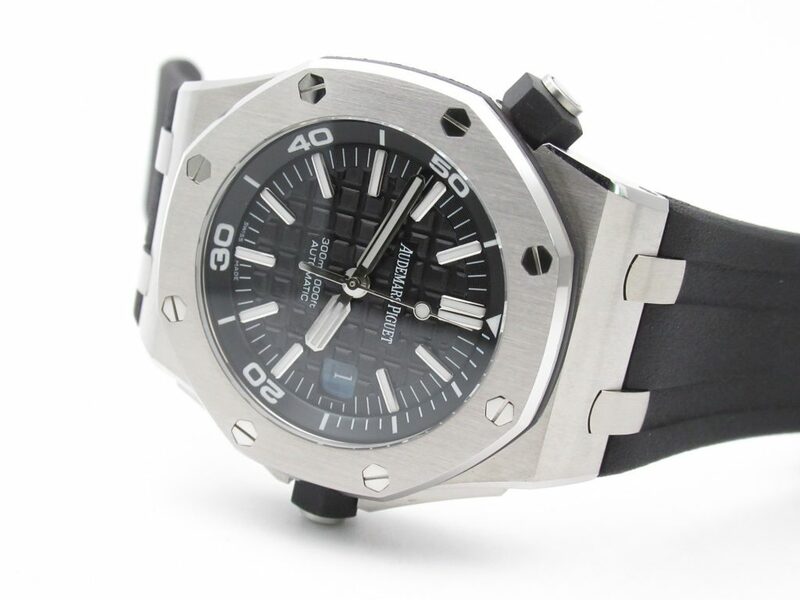 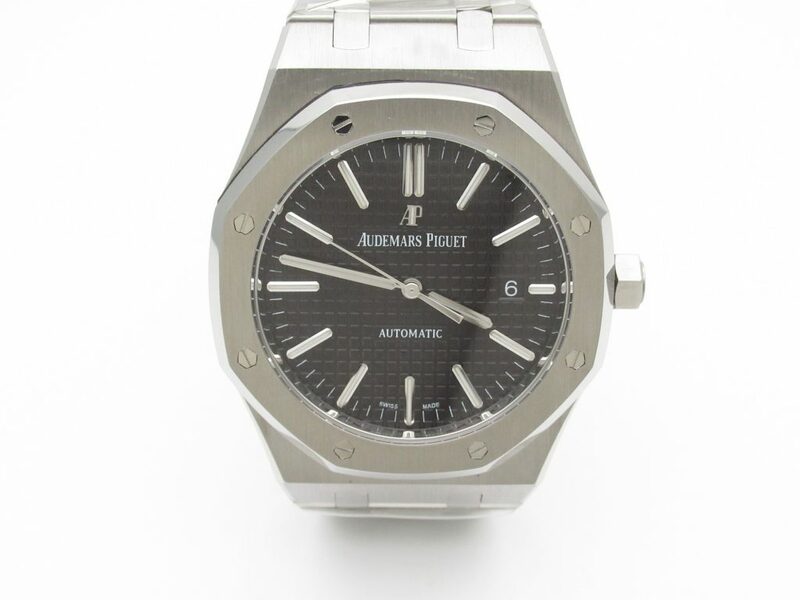 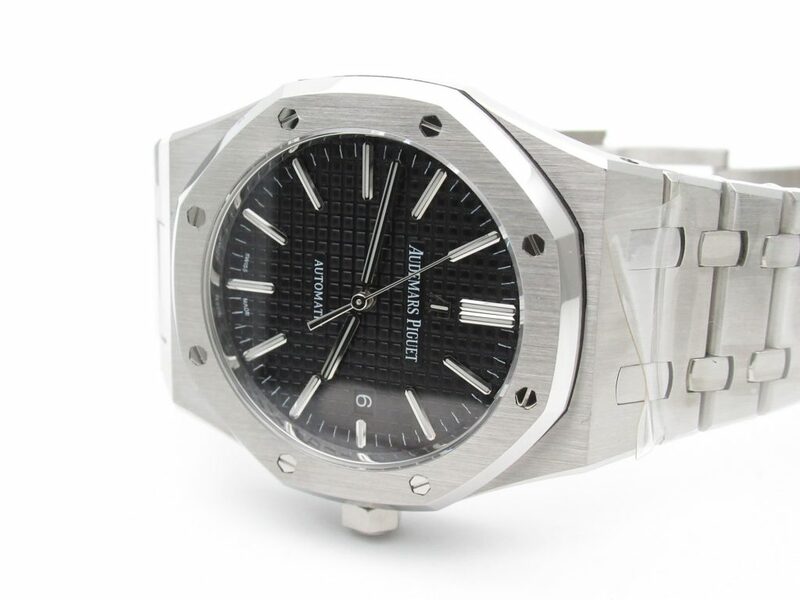 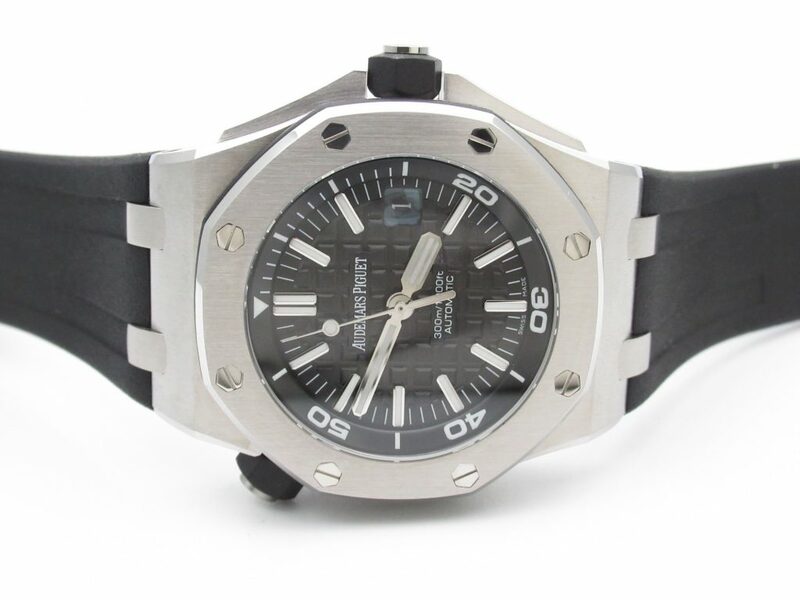 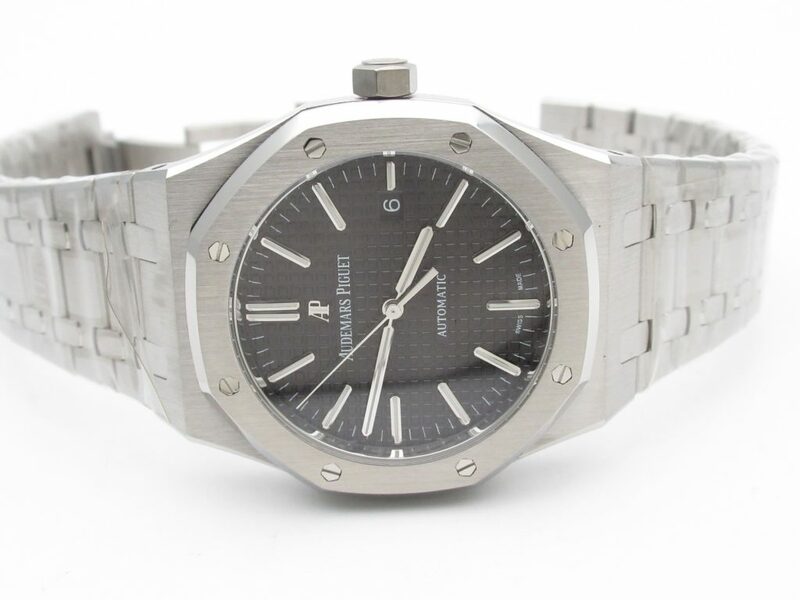 I have introduced so many amazing replica watches here, cover each Swiss brand such as Rolex, Panerai, Audemars Piguet, etc. 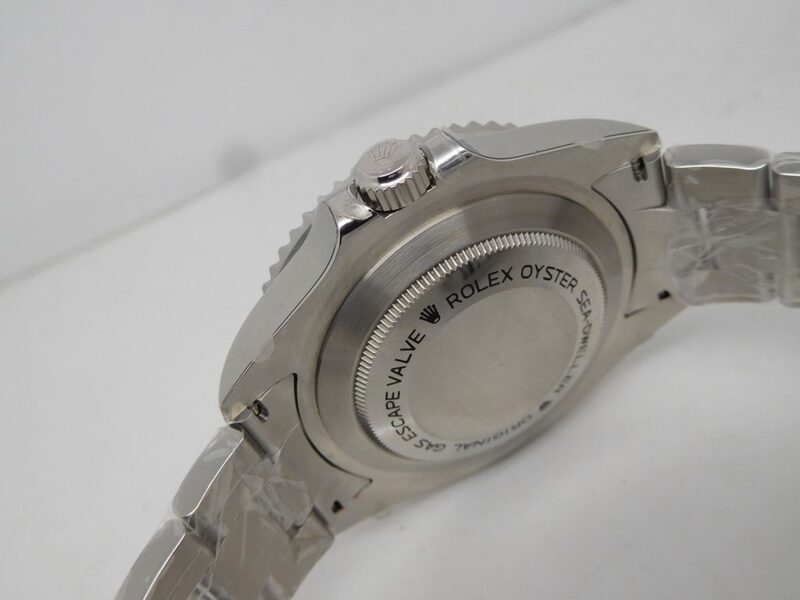 Most of them are diving-style watches and I am going to introduce a dress watch today, it is Datejust from Rolex. 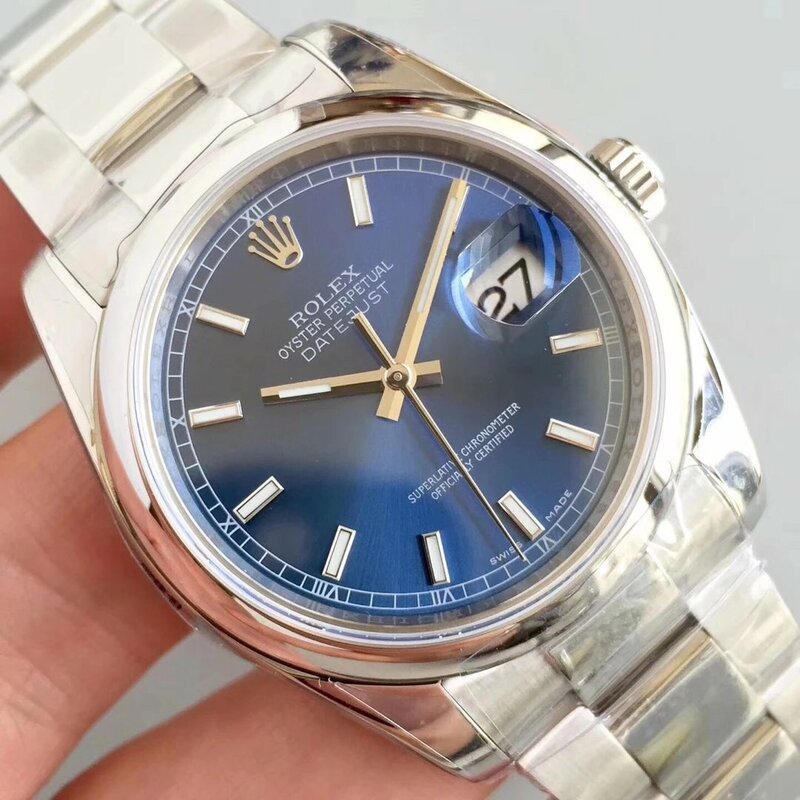 Yes, you have to admit Datejust is the best choice for men who usually attend formal business occasions. 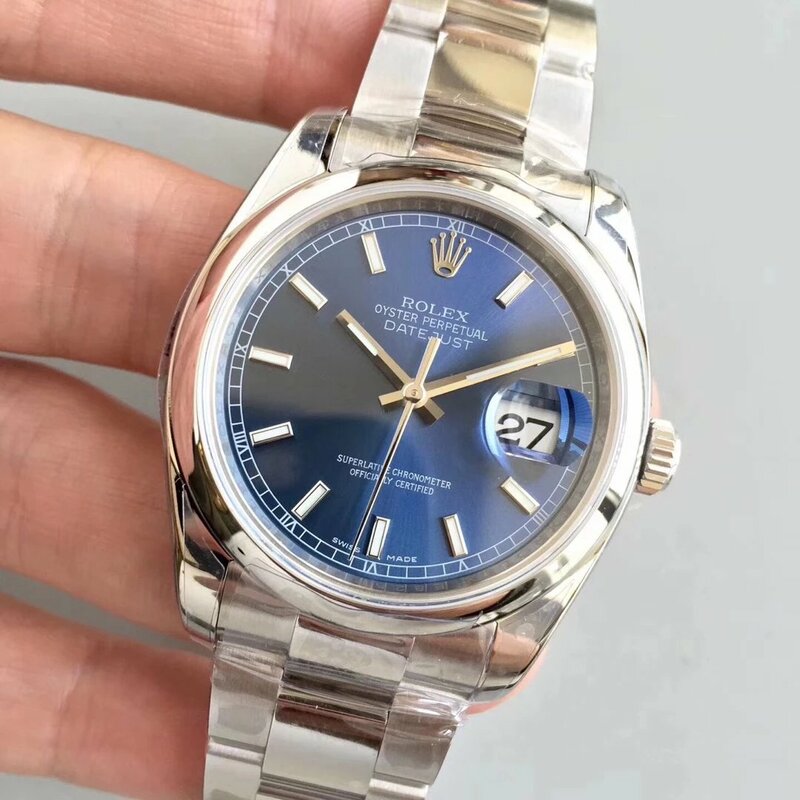 This Datejust replica I will post has some difference from those before because it uses higher quality watch material and another high end automatic movement. 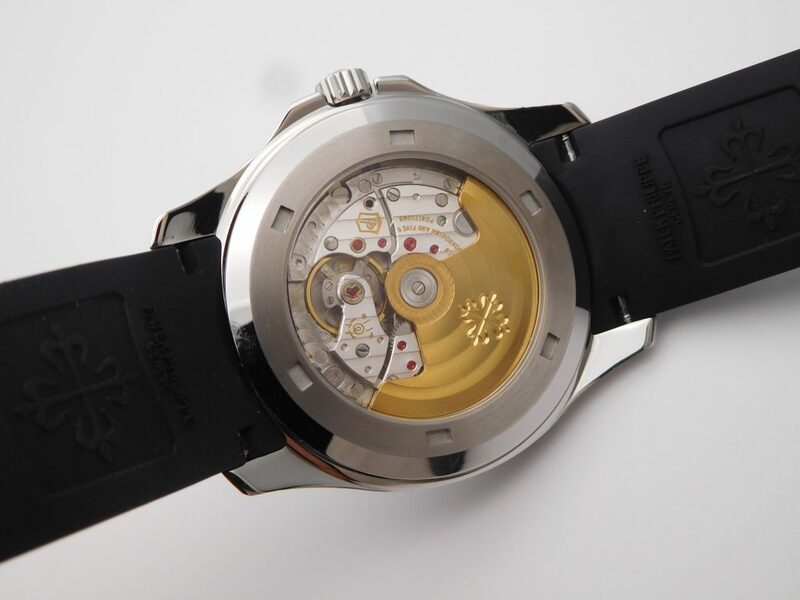 From outside to inner movement, the replica belongs to first-class watch, we call it Swiss grade replica watch. 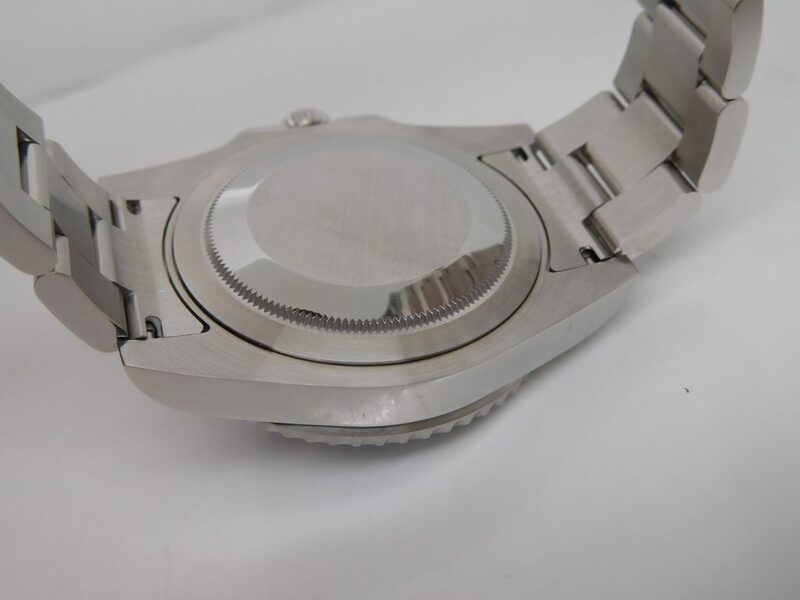 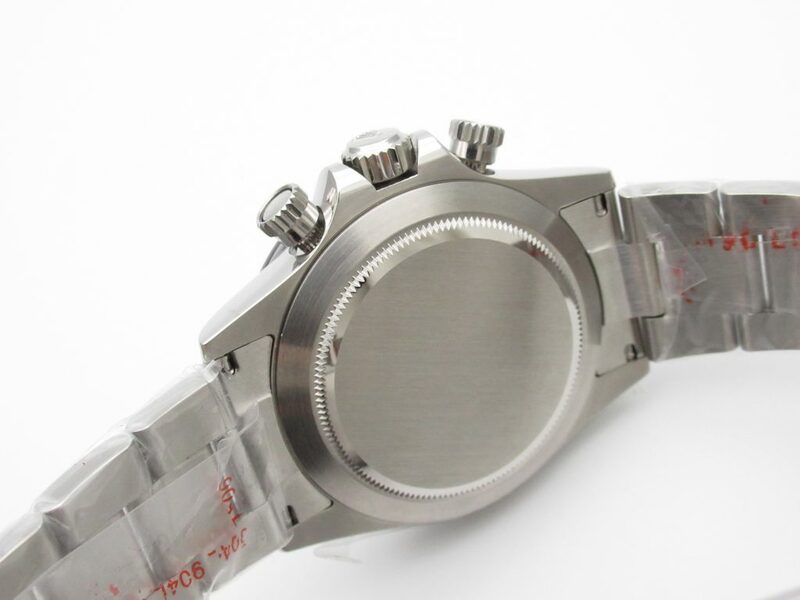 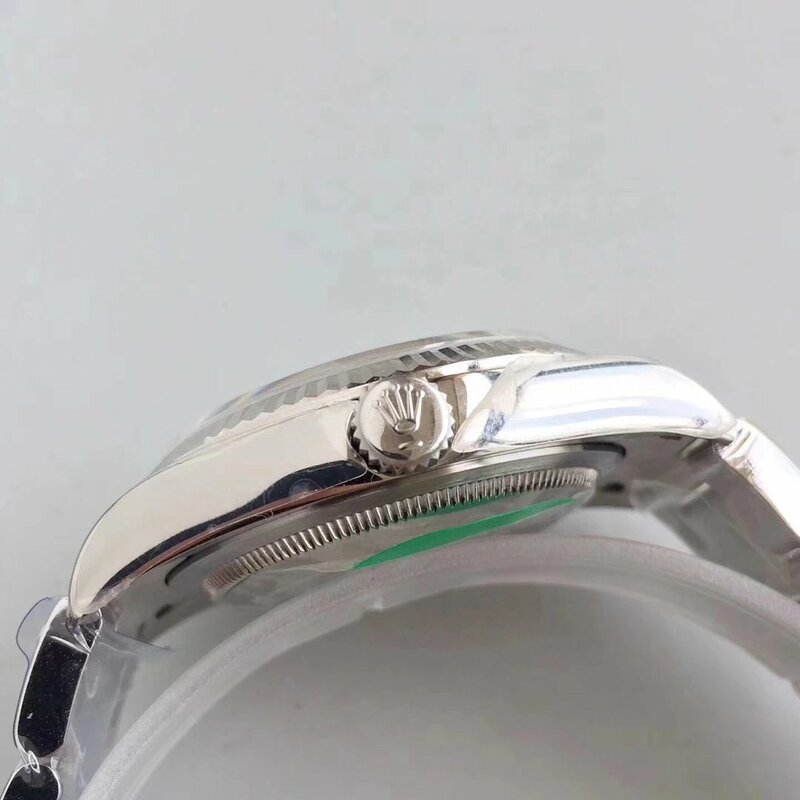 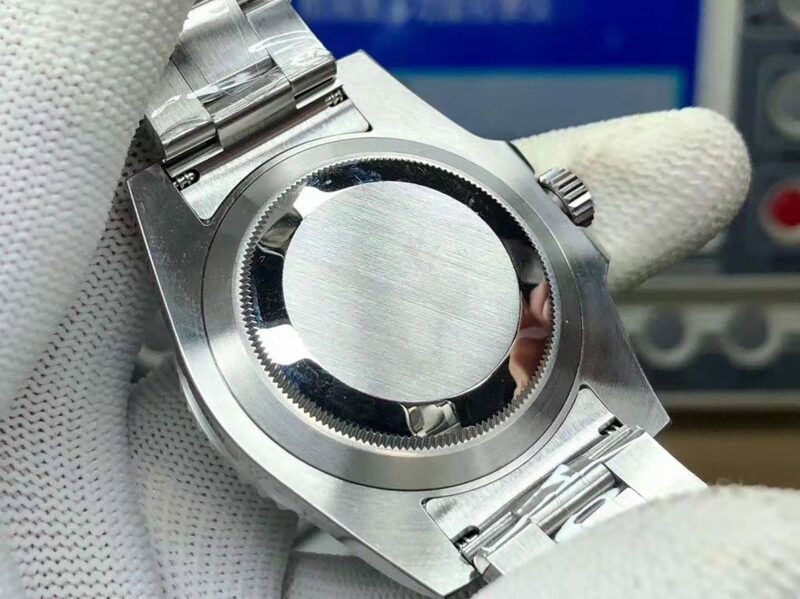 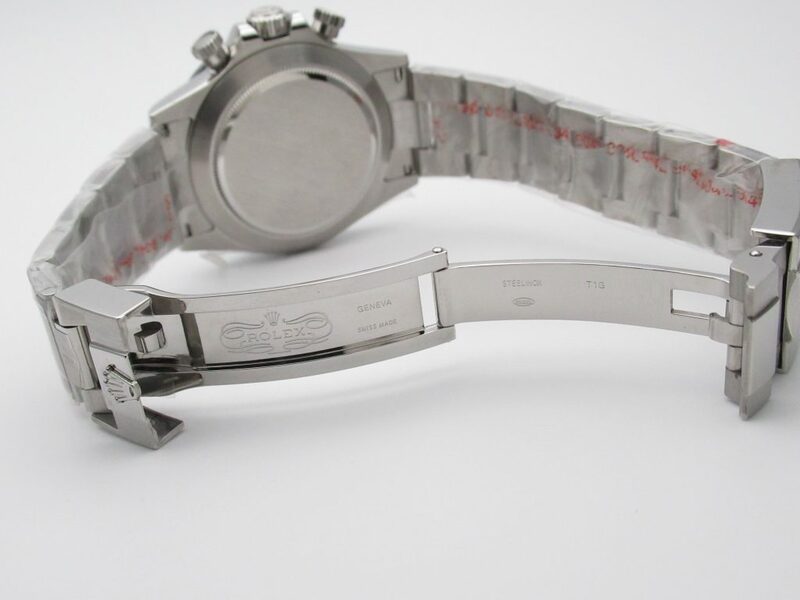 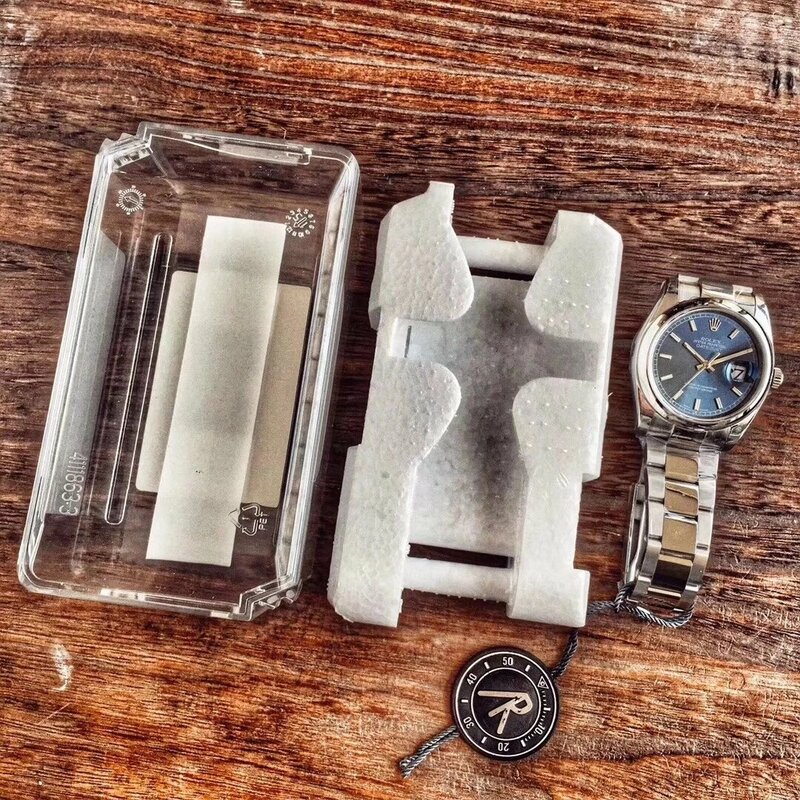 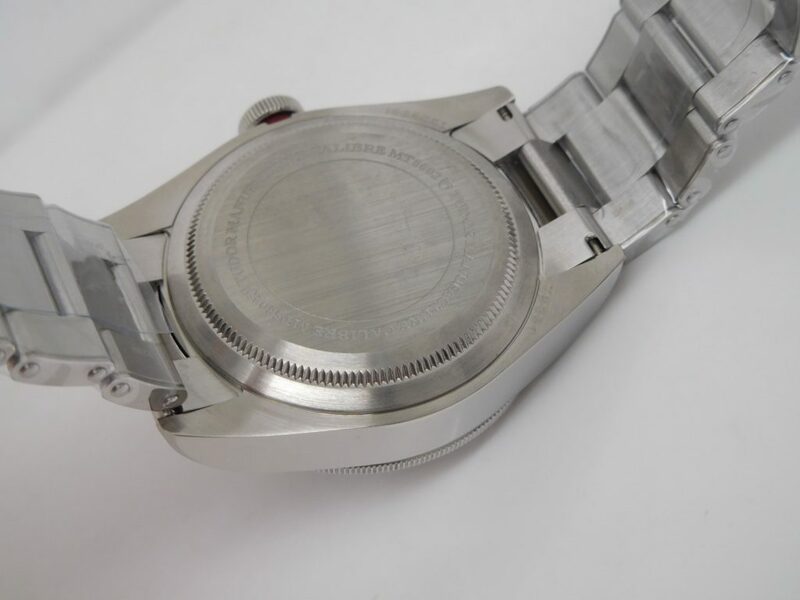 The case is measured to be 36mm in diameter, it is made of 904L stainless steel, a higher grade of steel material, the replica watch factories only used 316L or 316F stainless steel on their watches before, from now on, all replica Rolex watches will use 904L. 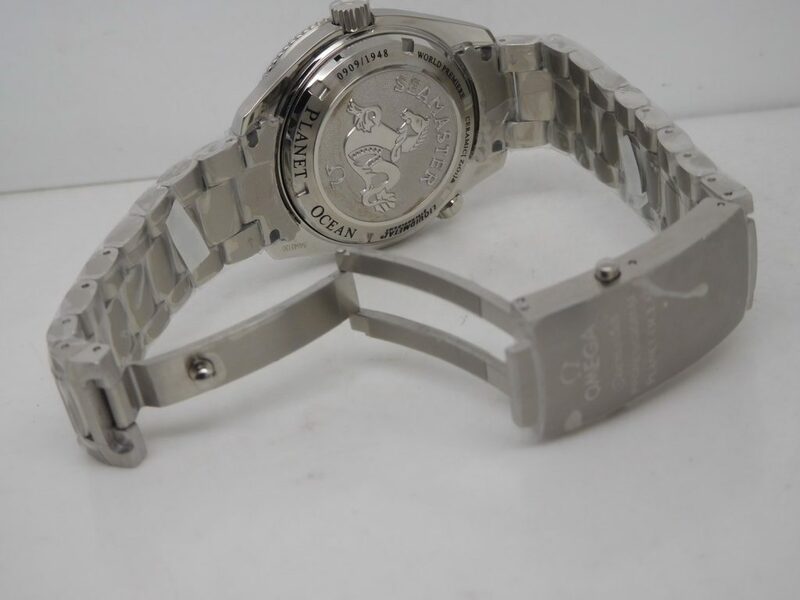 This is a great progress we have made in the development of replica watch industry. 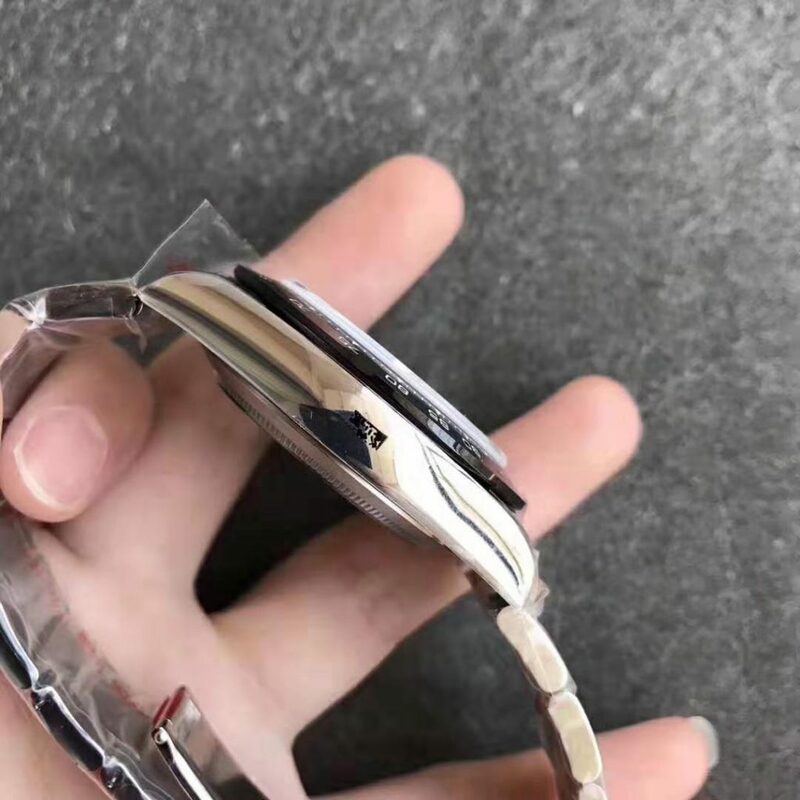 Classic dome round bezel, the case is polished very well, so round and smooth case edges, so there are no scratch feeling when wearing this watch on hand. 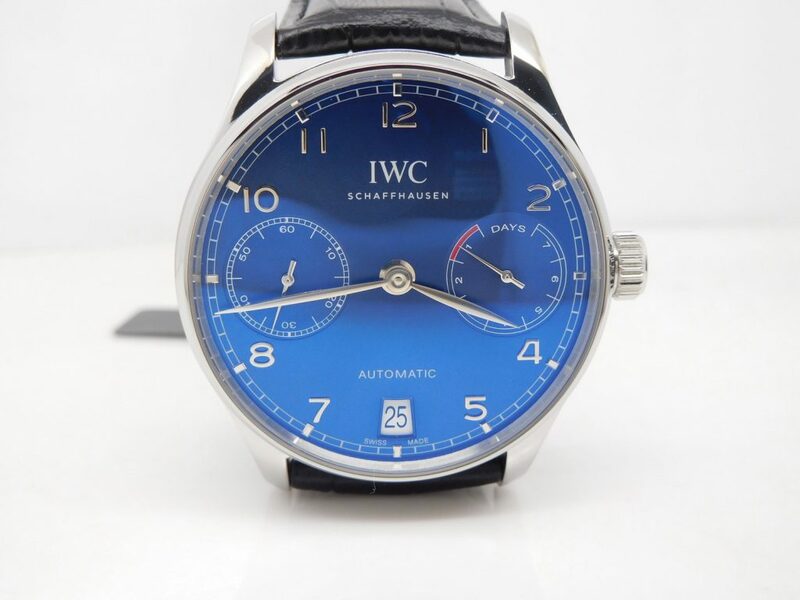 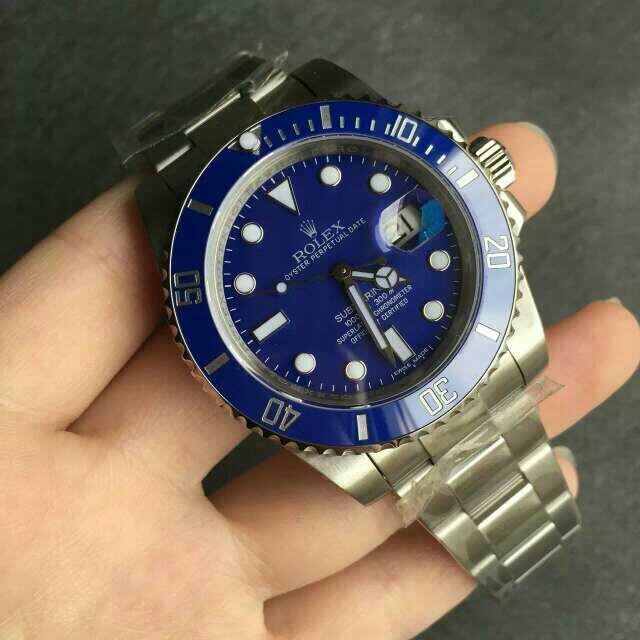 The dial is blue, bar-shaped hour markers and hands are applied with green superlume material, it is a Swiss grade lume material. 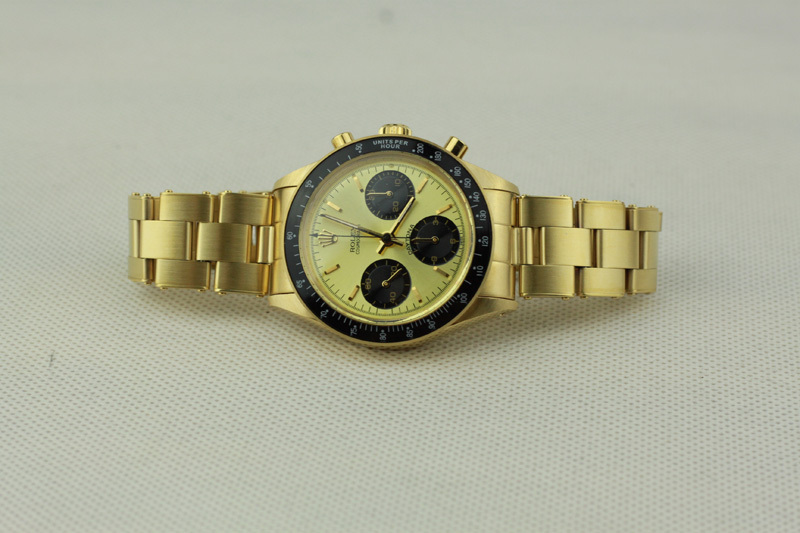 Central second hand is sweeping the dial smoothly. 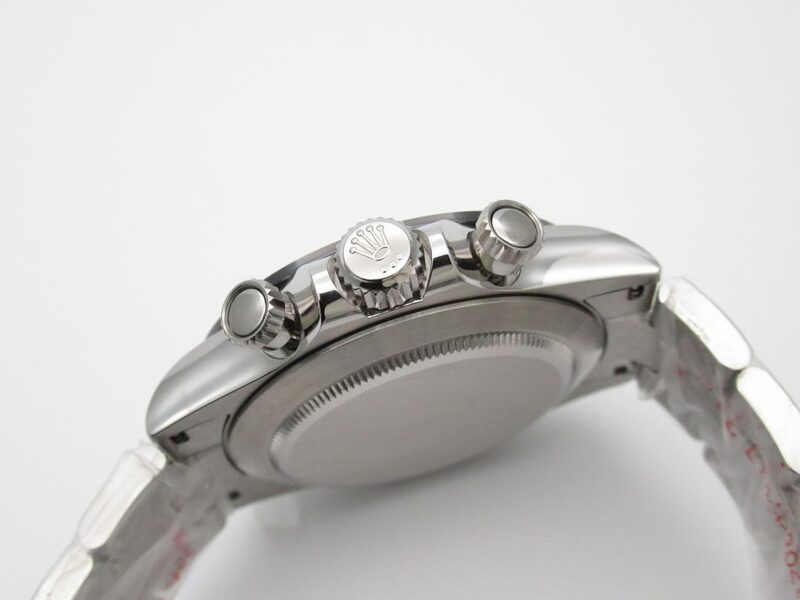 On the outer of the dial, there are track-style minute scales, each Rome number is matching with the bar-shaped hour marker. 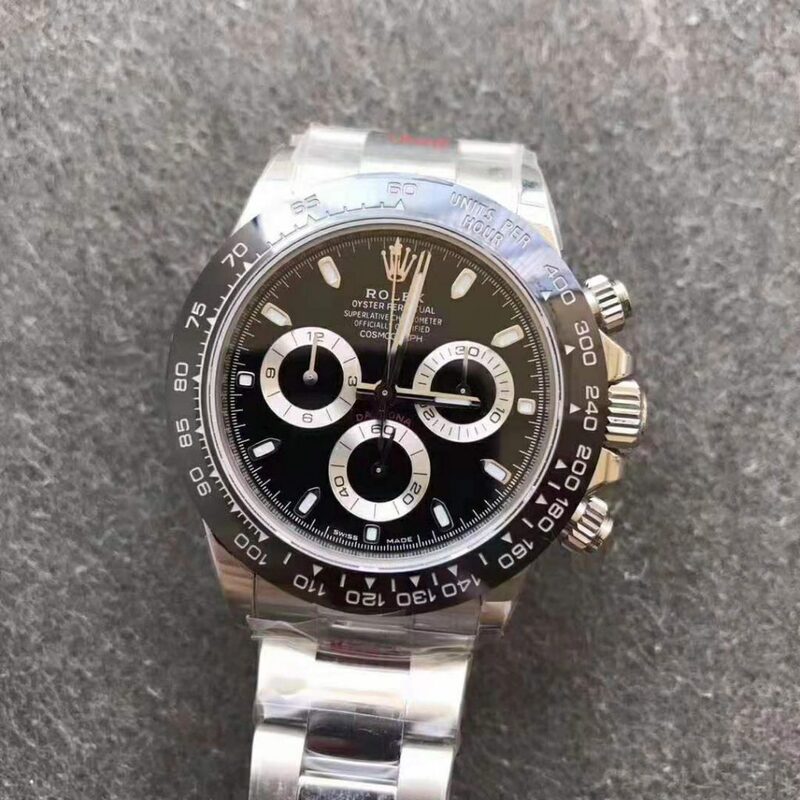 Date window has black date font in a white background, so it is very clearly readable. 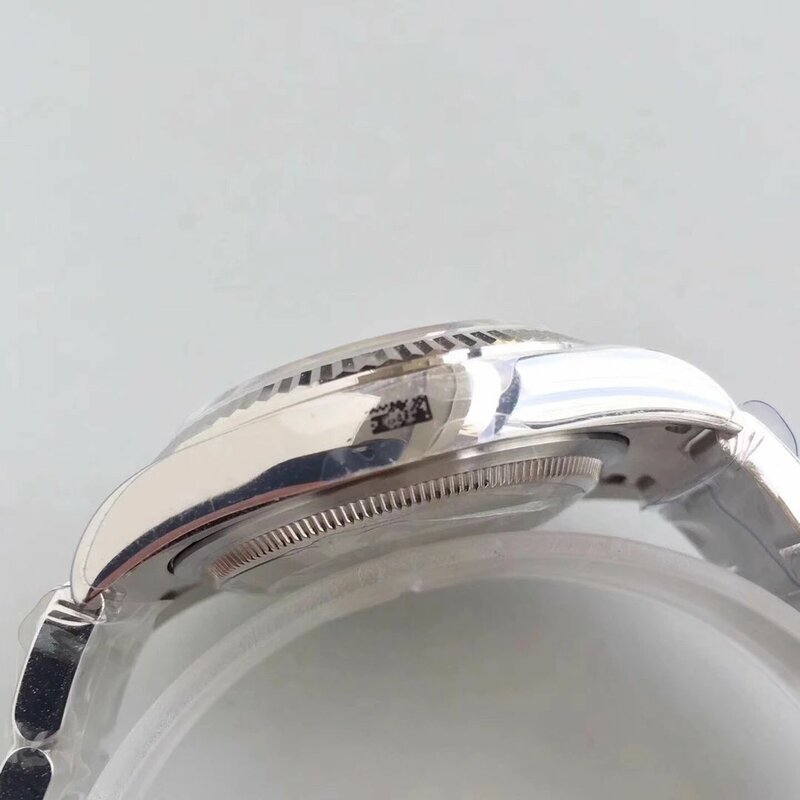 Besides, all hour markers, including the crown logo at 12 o’clock, are three-dimensional. 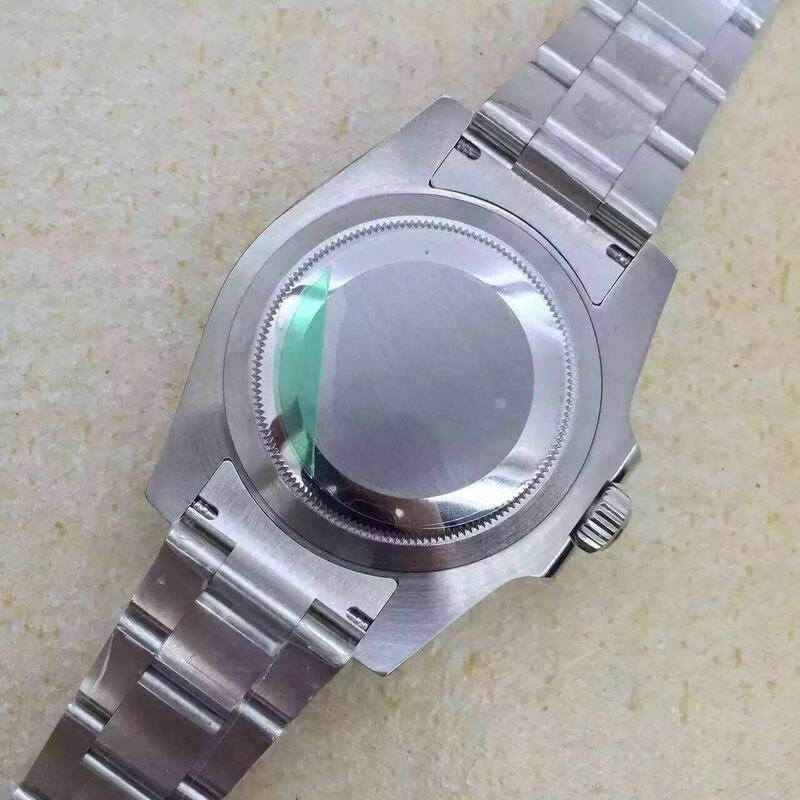 They are raised from the dial. 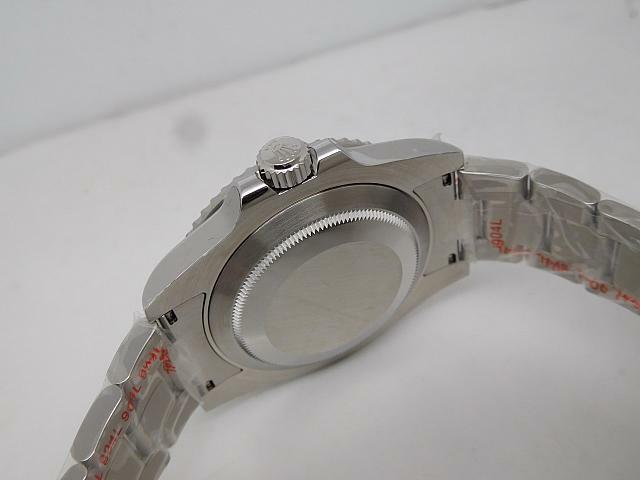 Inside, the movement is a Super Copy Cal. 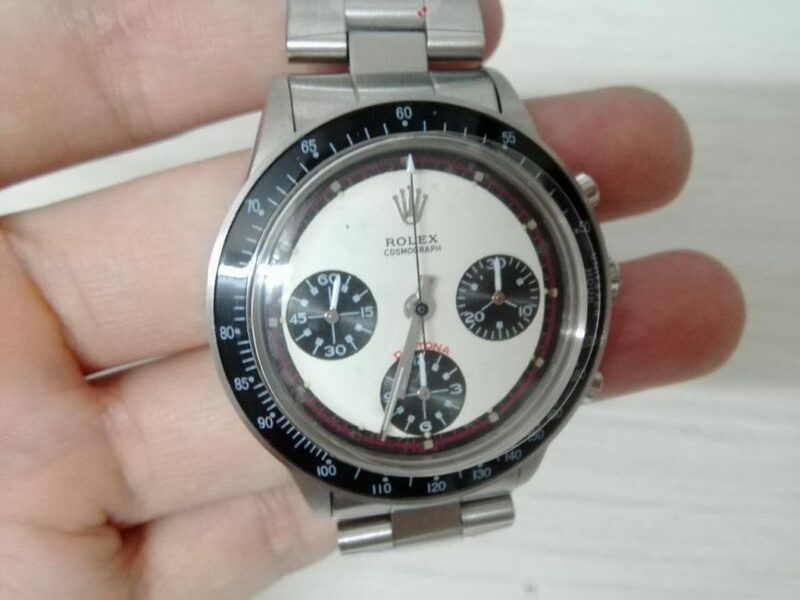 3135. 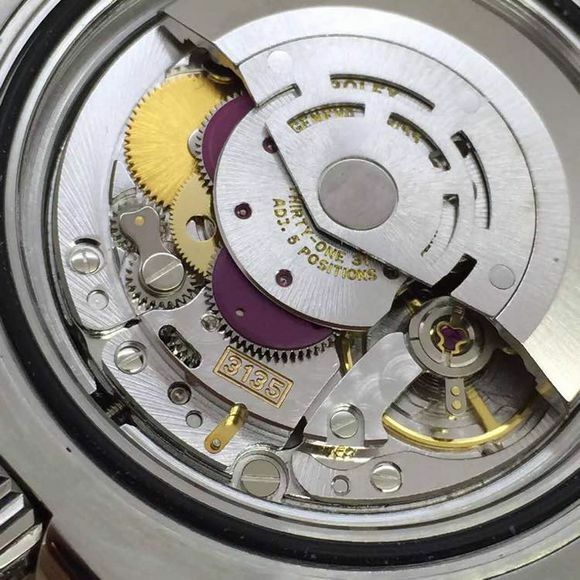 Among all previous Rolex Datejust replicas, they only used Asian Clone ETA 2836 or 2824 movement. 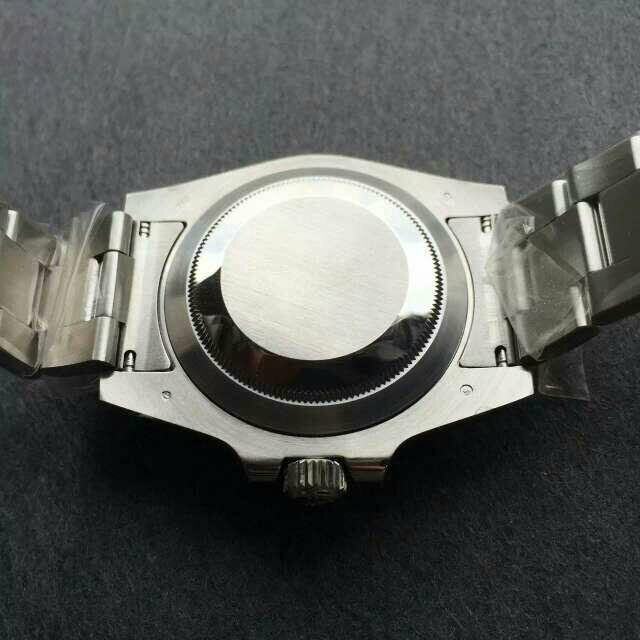 The Super Copy 3135 is the most beautiful clone movement because the plates and auto rotor are decorated to be the same as genuine Caliber. 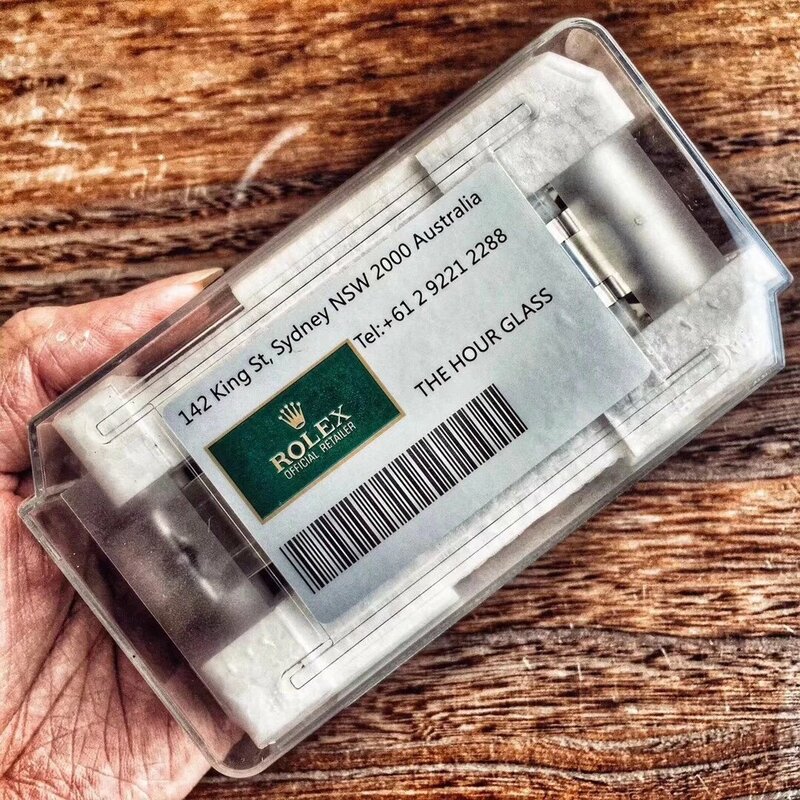 All readers here are concerned its waterproof performance, yes, the replica Rolex Datejust is tested to be 50m waterproof in the factory. 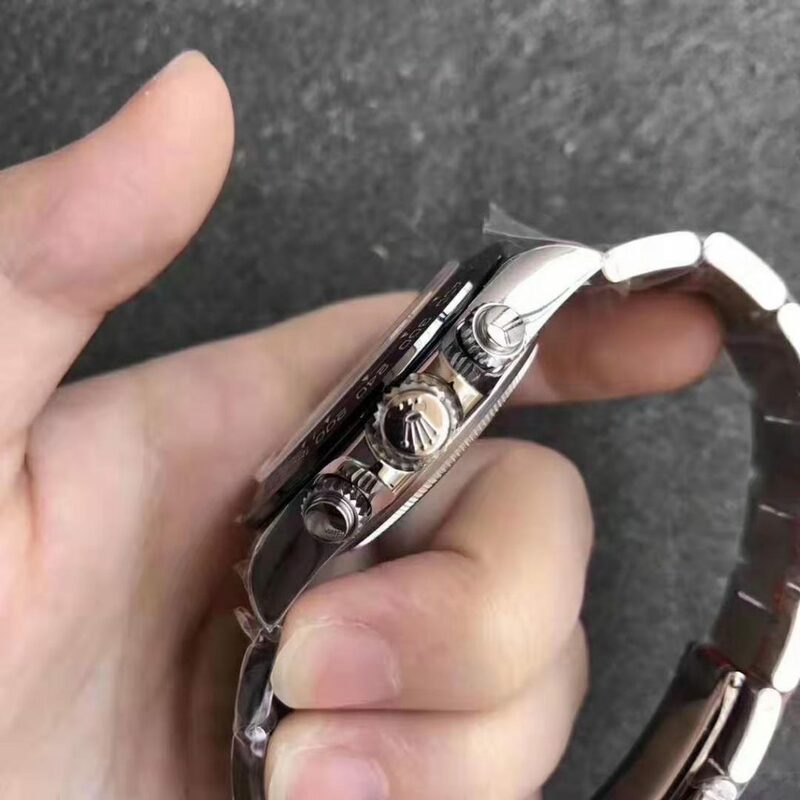 Although it has a great water resistance, you need to take the watch off before a hot bath. 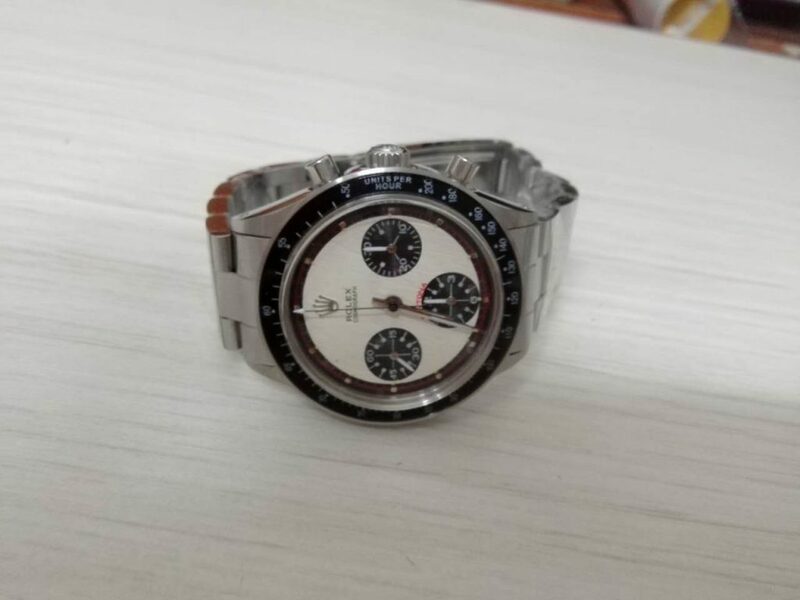 If you are interested in this replica, please leave your comment on this post. 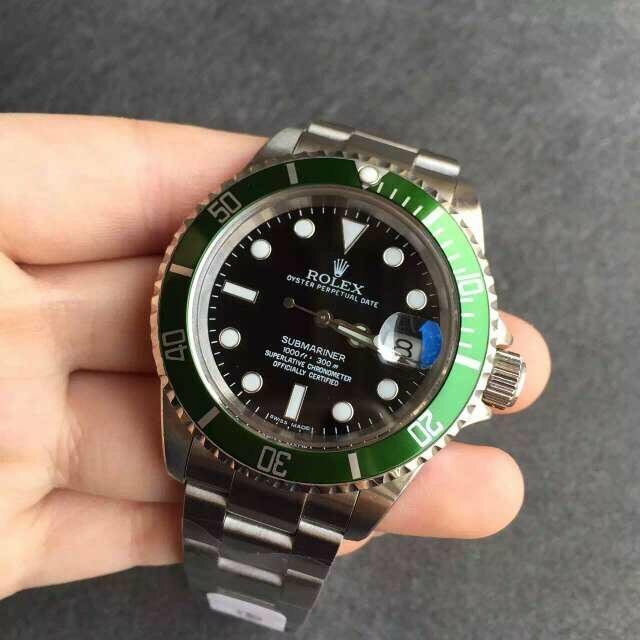 BP made this replica Submariner according to genuine watch 16610. 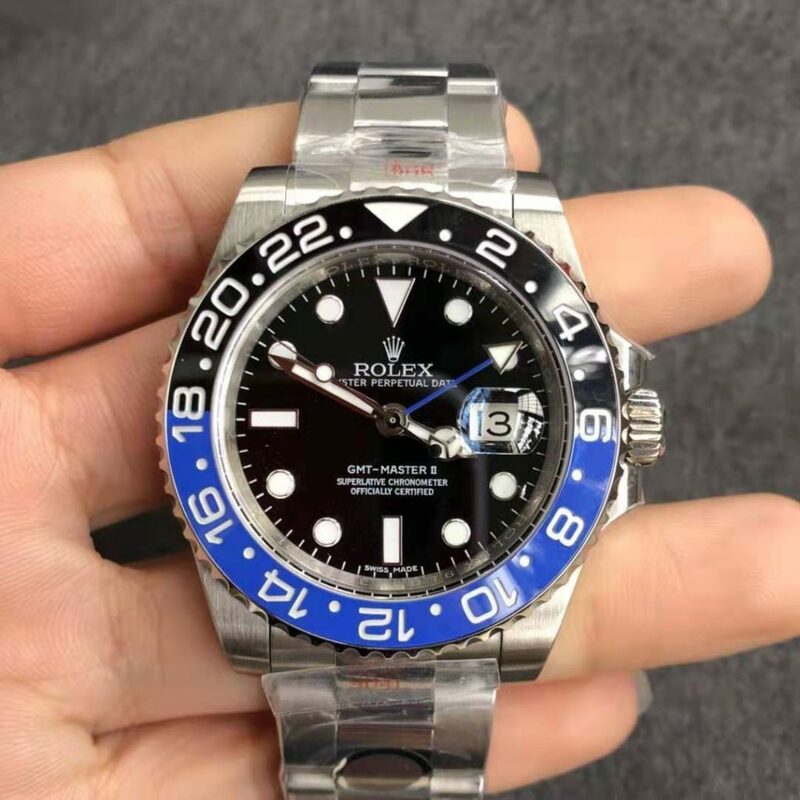 Every Rolex replica made in the market is made by three major factories, they are BP, Noob and J12, these are good quality replicas. 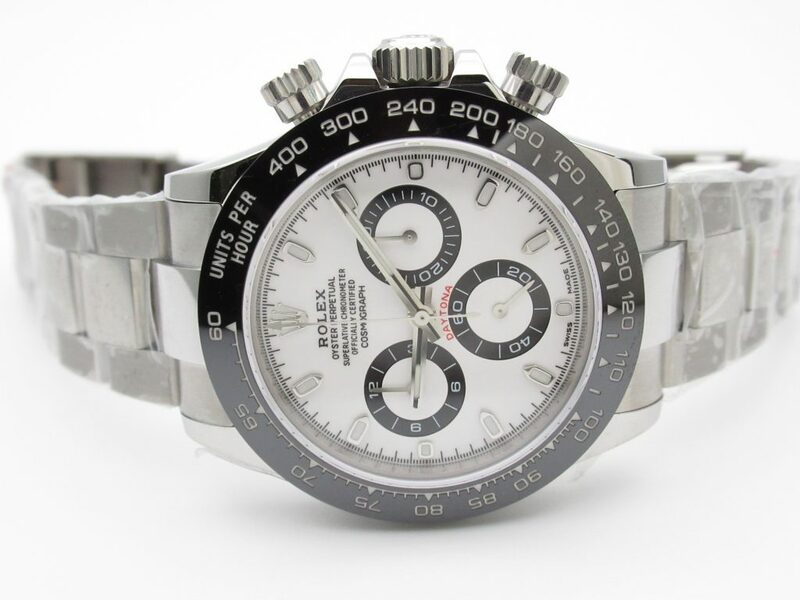 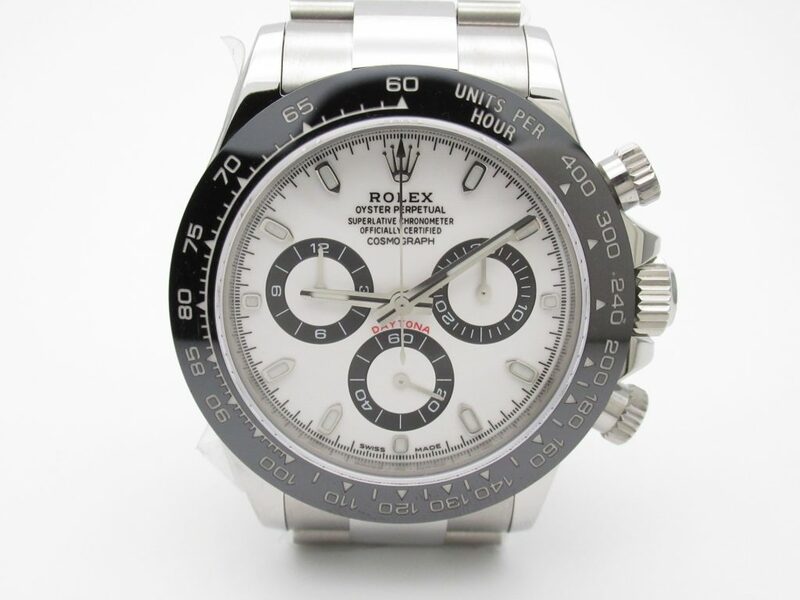 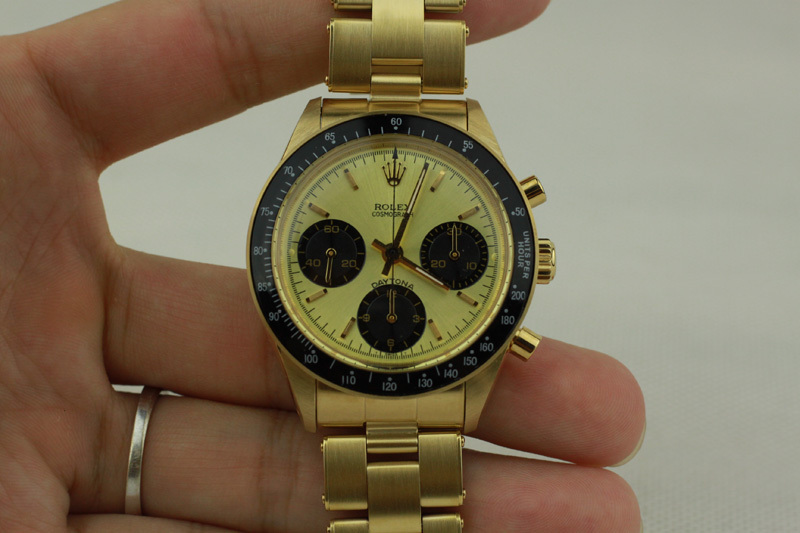 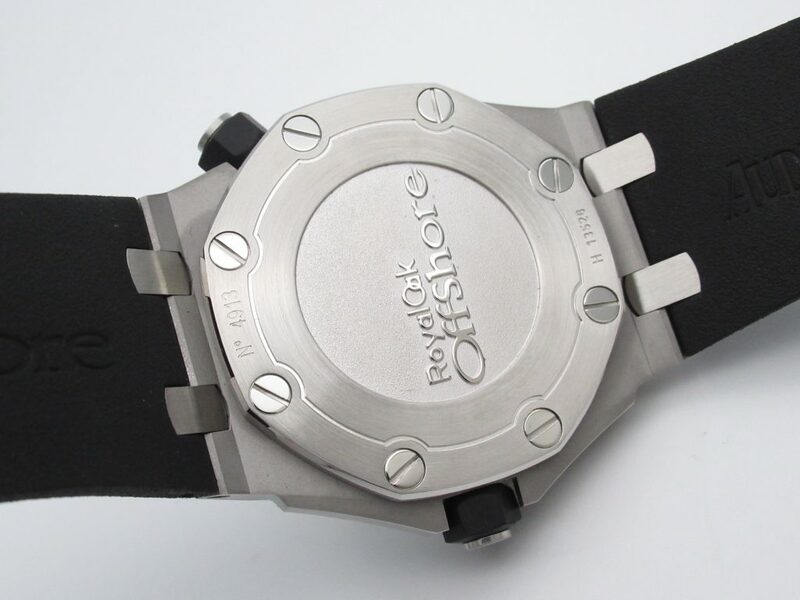 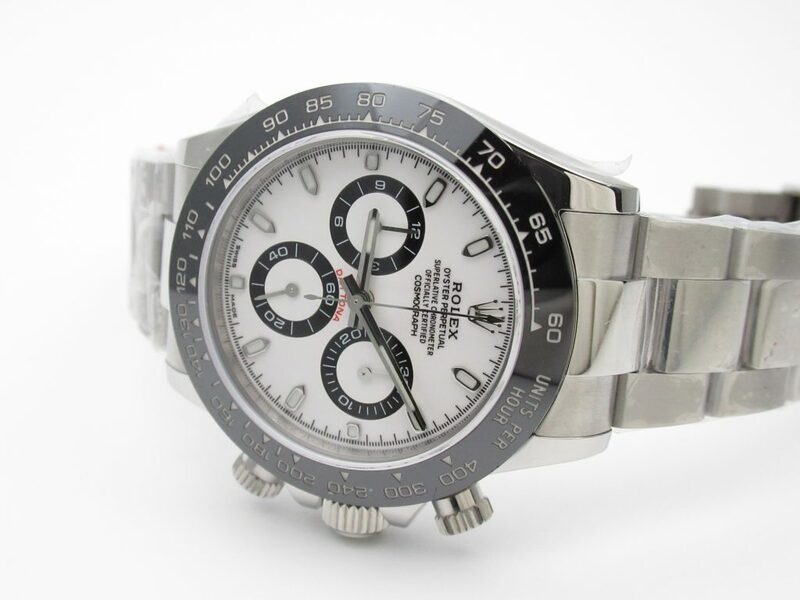 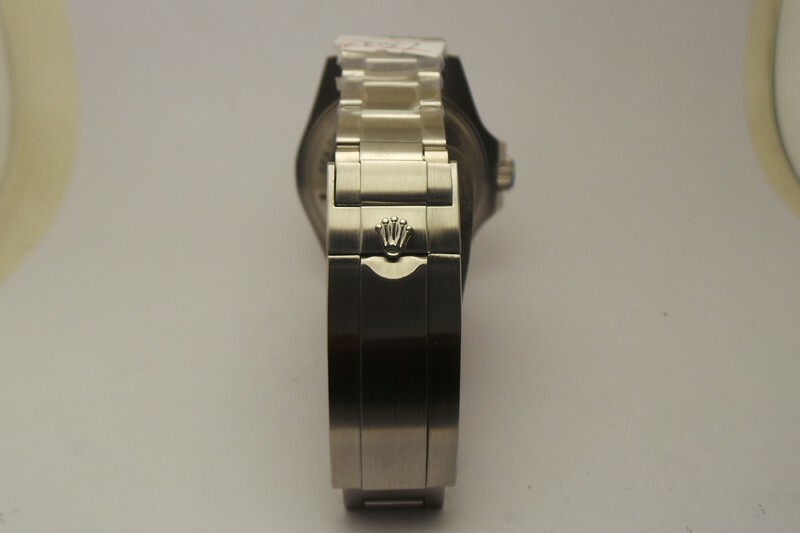 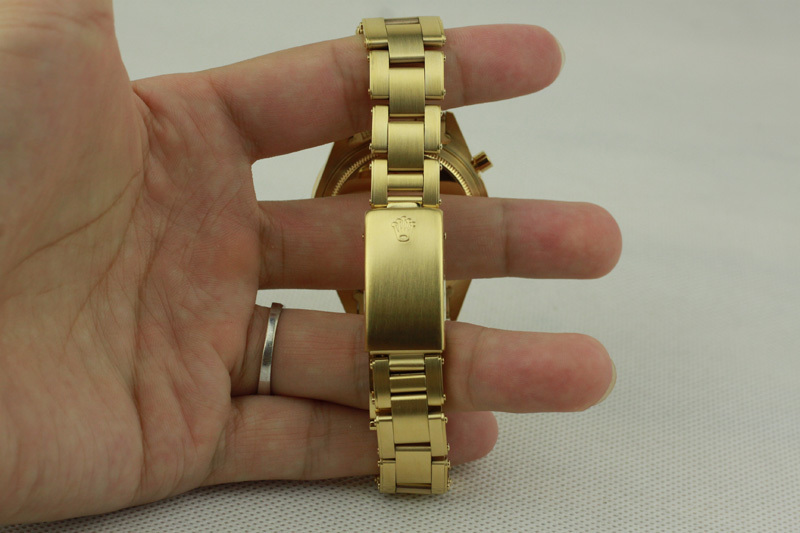 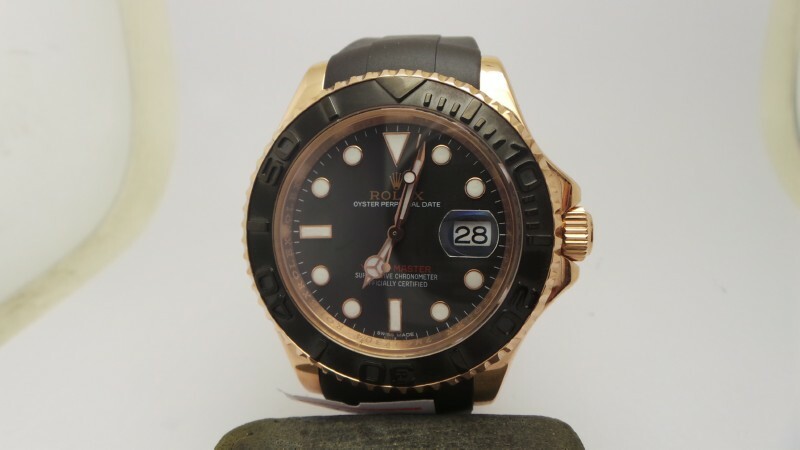 While the quality of these Rolex replicas made by other small factories can not be ensured. 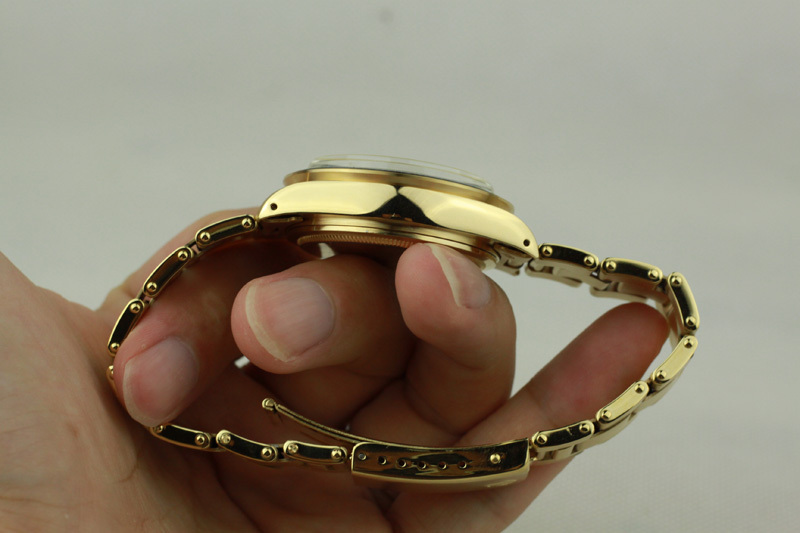 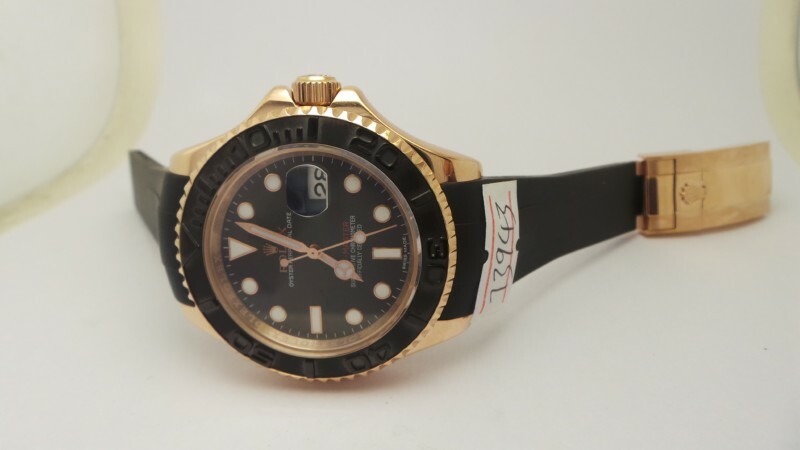 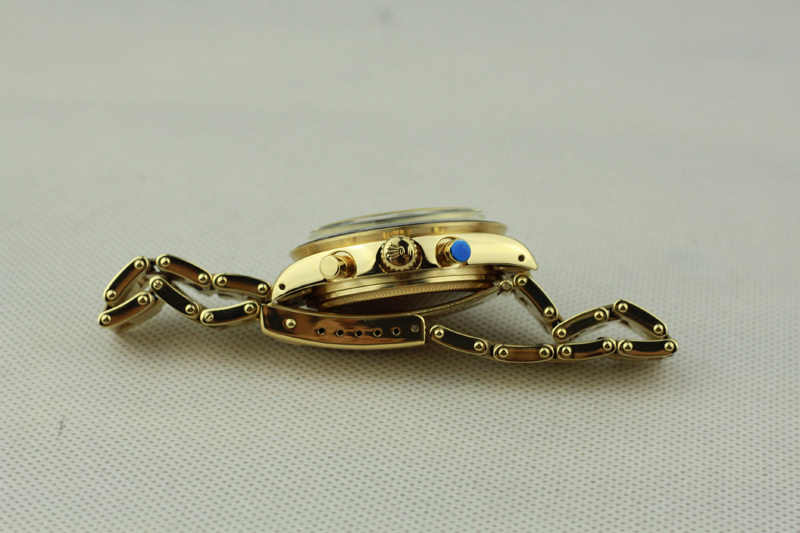 The 16613 replica here features a two tone appearance, it is made of 316L stainless steel, while its bezel, crown and the central links of bracelet are plated with yellow gold. 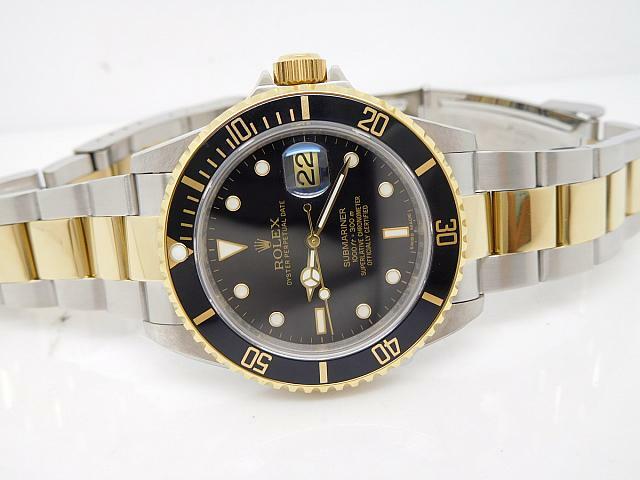 The Submariner watch looks more luxury than others because of the yellow gold tone applied. 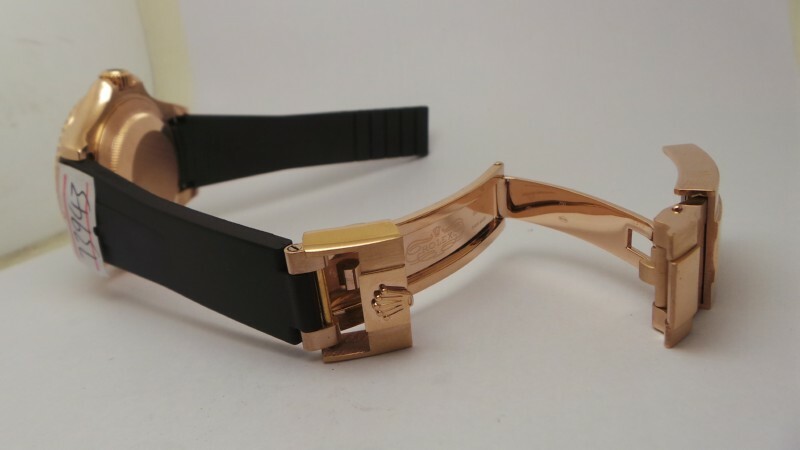 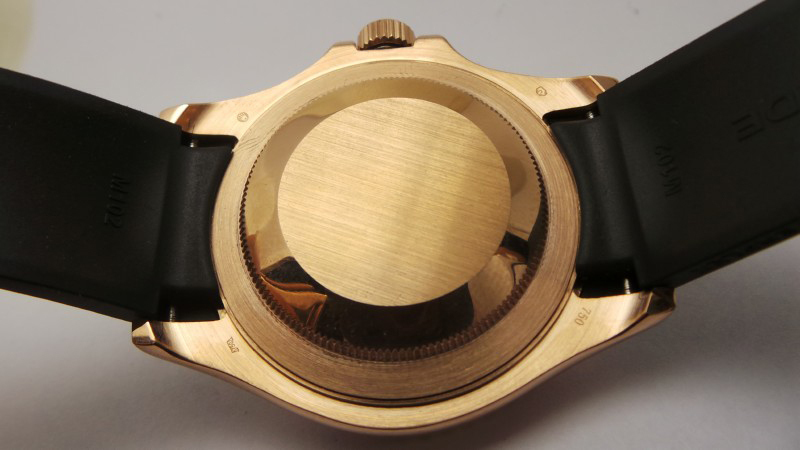 Black bezel insert has golden markers engraved, the edge of the bezel is also plated with yellow gold. 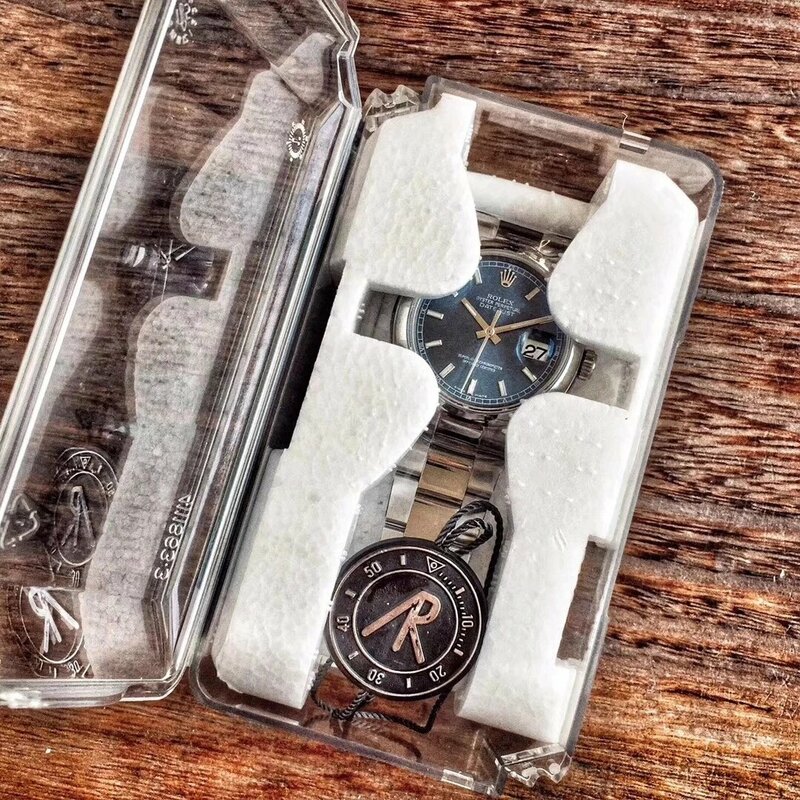 The whole case is brushed and solid case back has nothing. 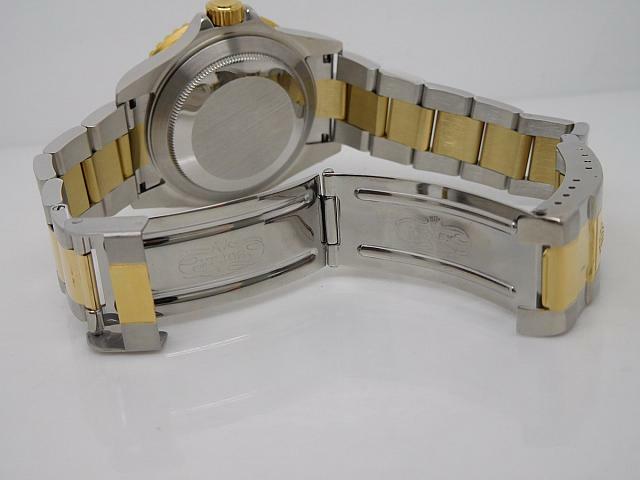 Streamlined case design looks great from the case side. 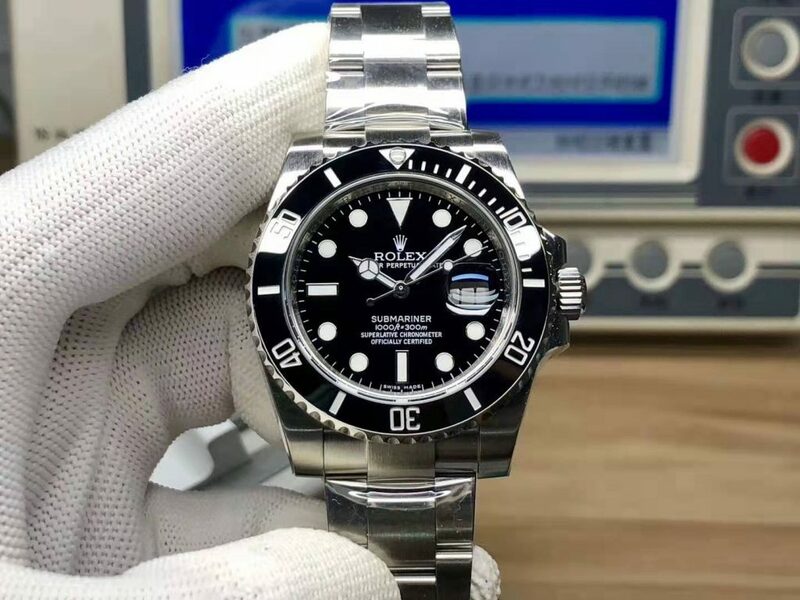 Black dial is perfectly cloned, the dial design is also a great advantage of BP because it could make a Submariner dial that is closest to genuine. 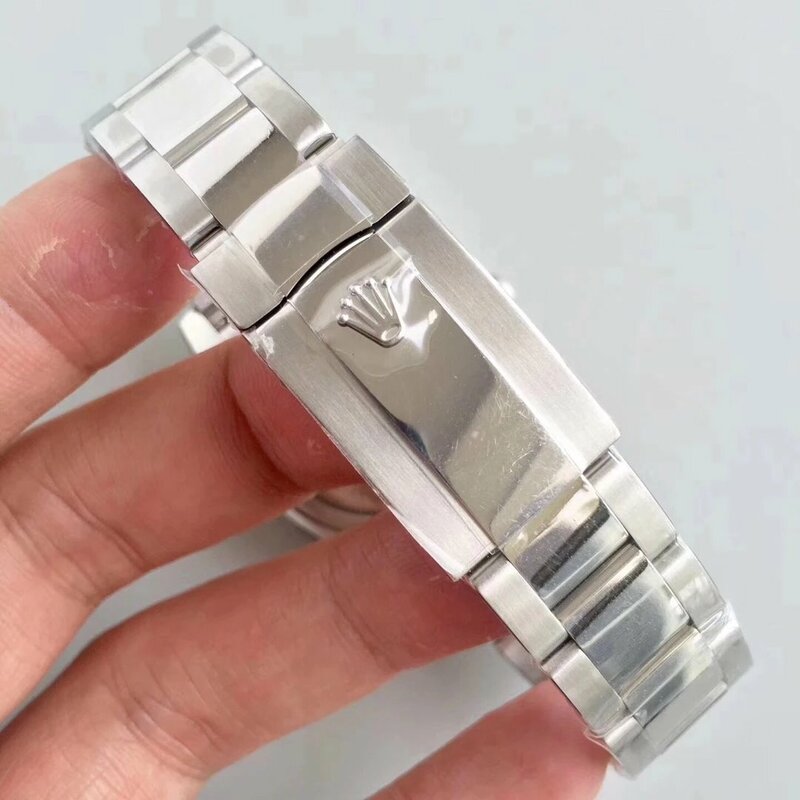 The Rolex Crown Logo positioned at 12 under the triangle marker is three-dimensional, all hour markers and hands have yellow golden edge, which echoes with the yellow golden bezel markers. 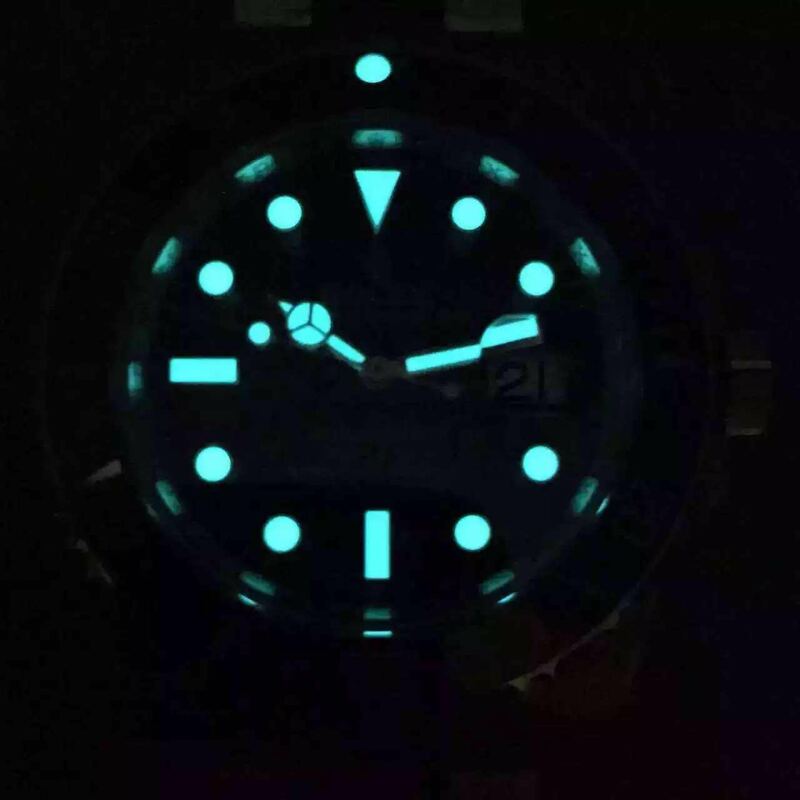 White luminous material applied on markers and hands will offer green light in the dark. 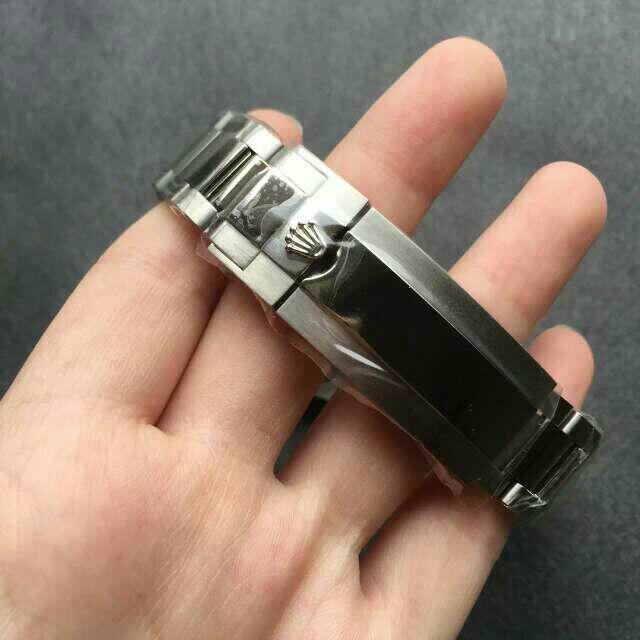 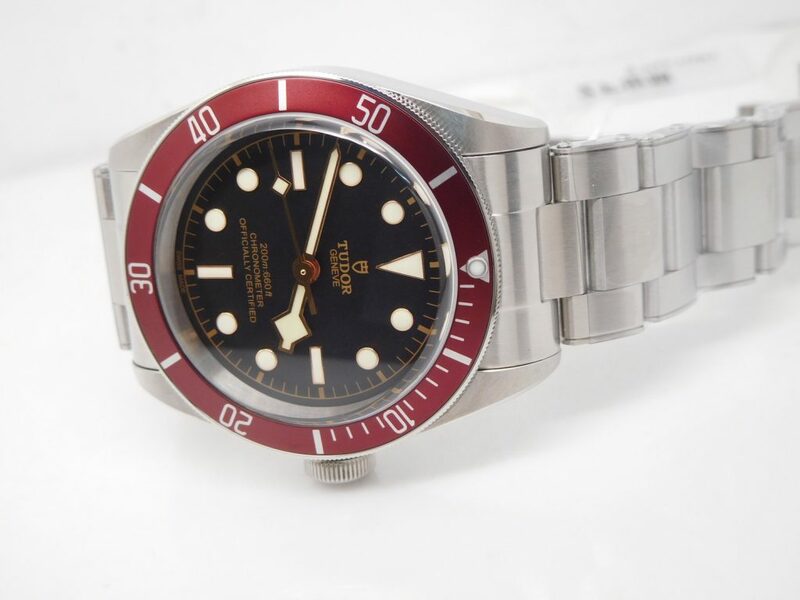 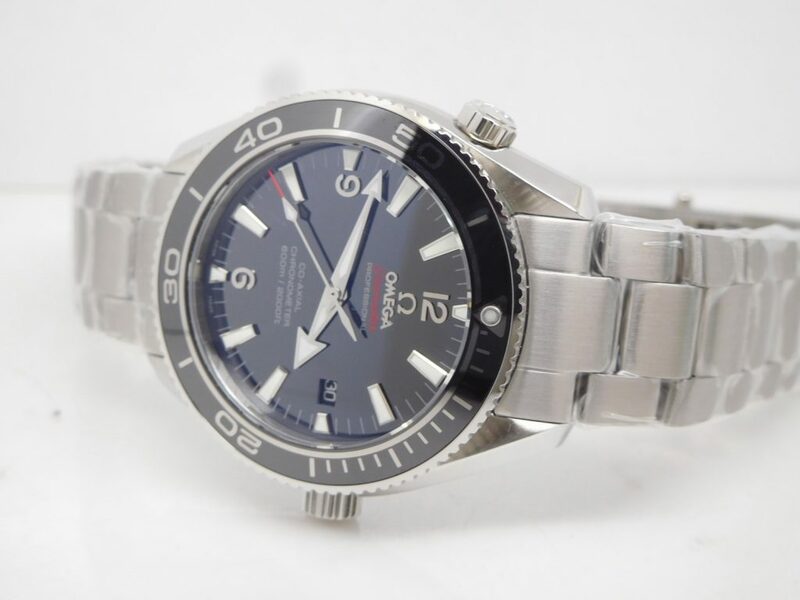 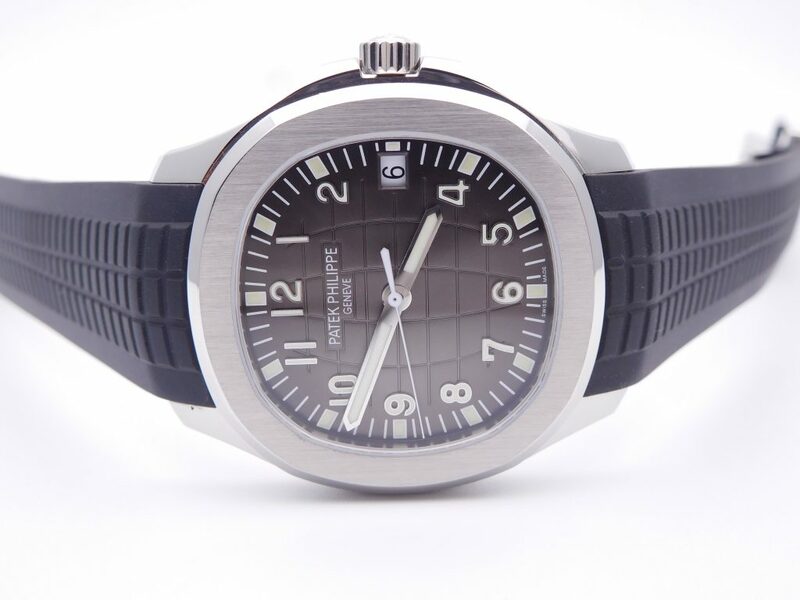 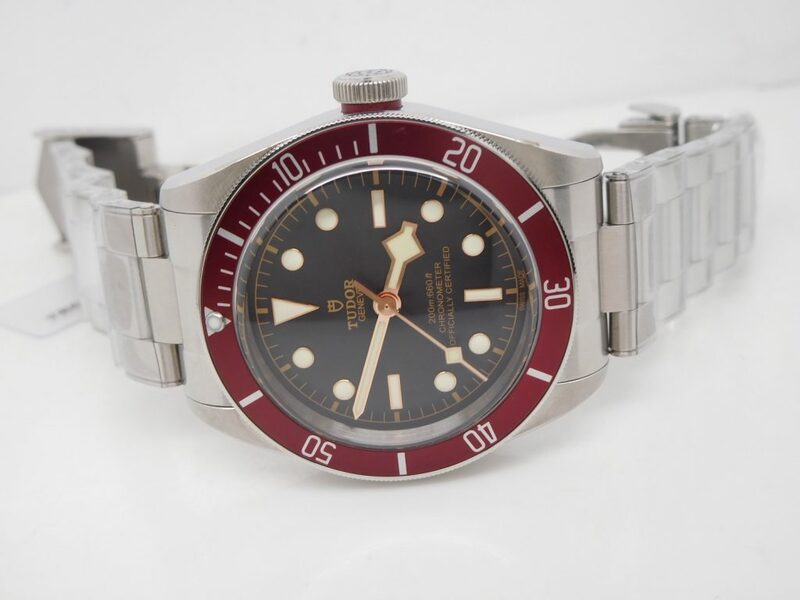 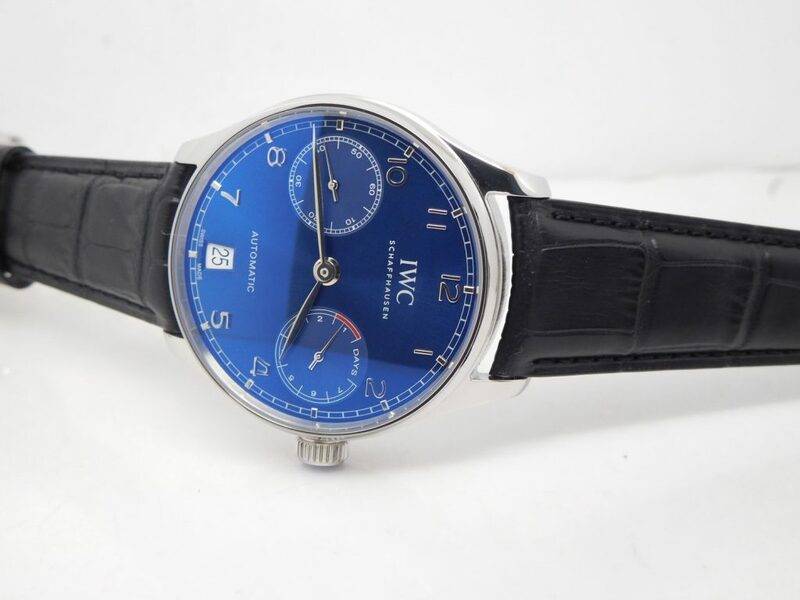 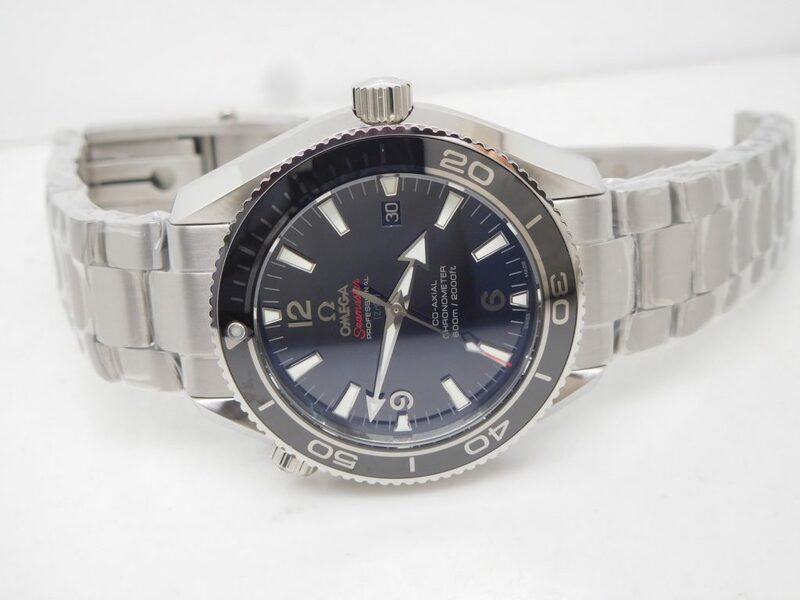 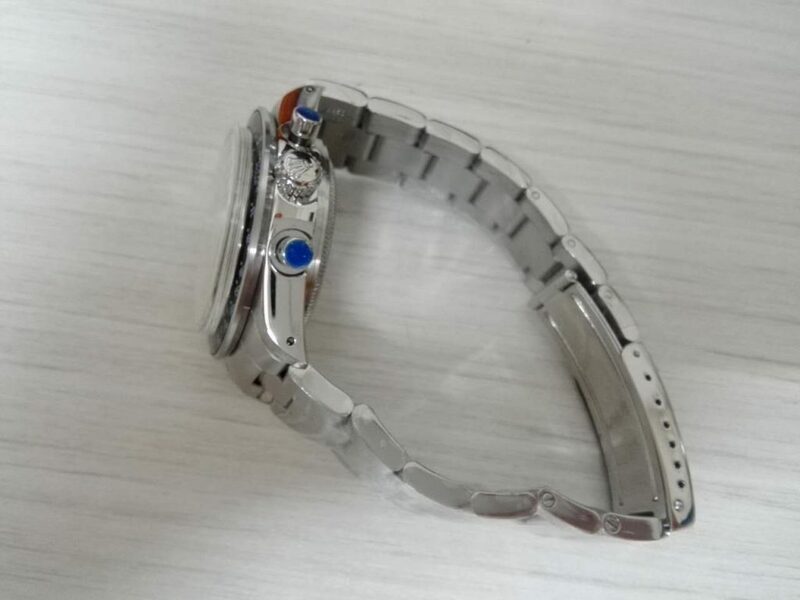 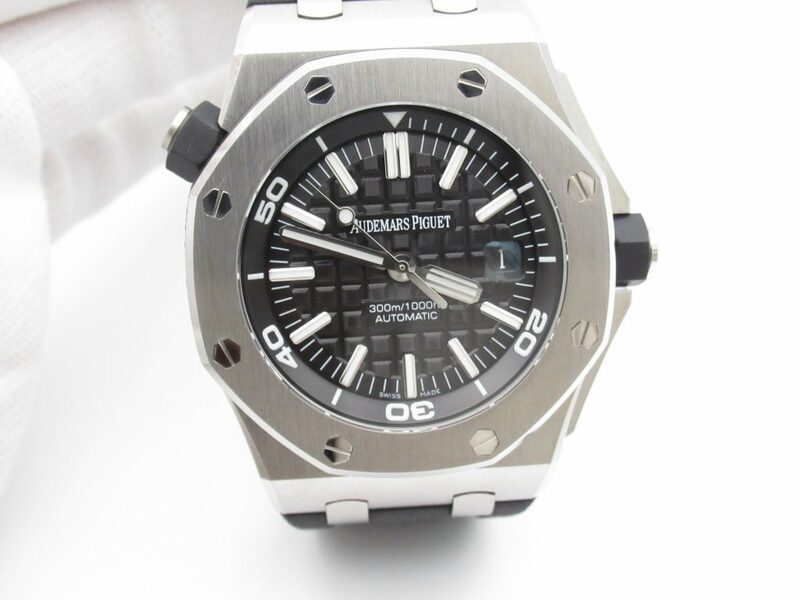 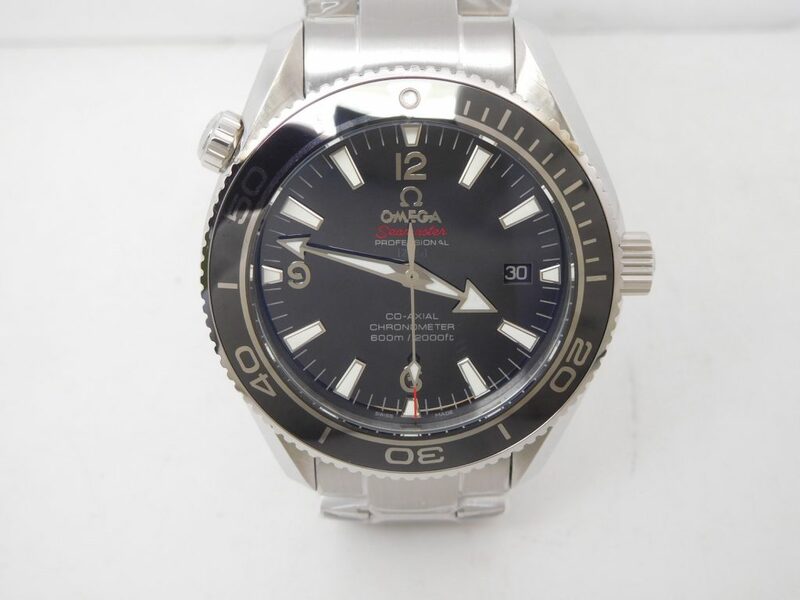 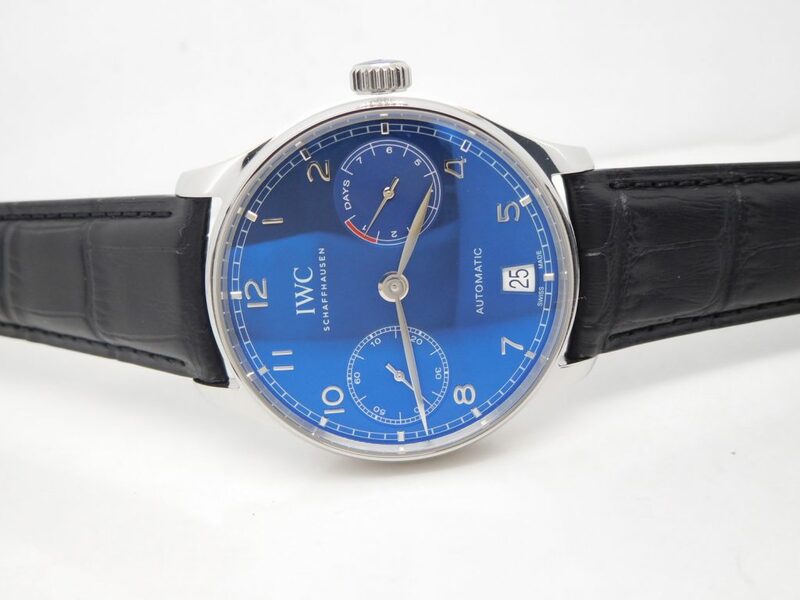 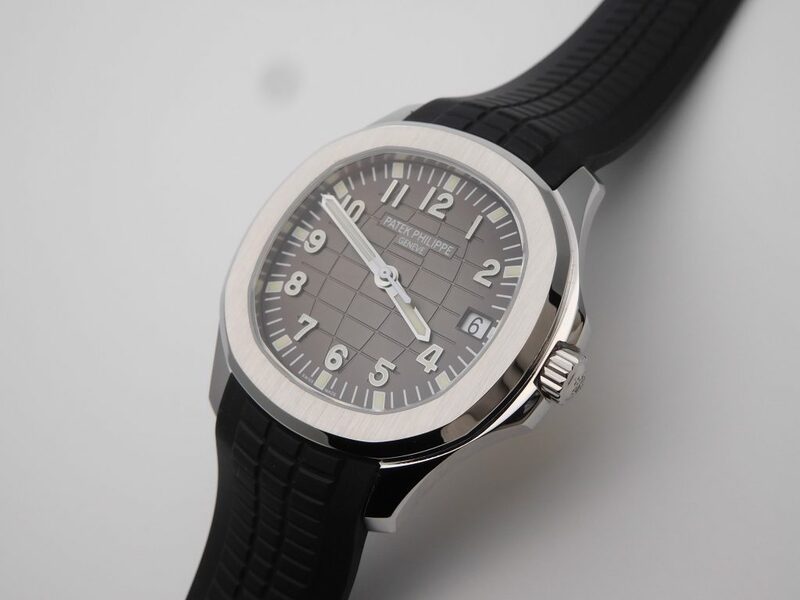 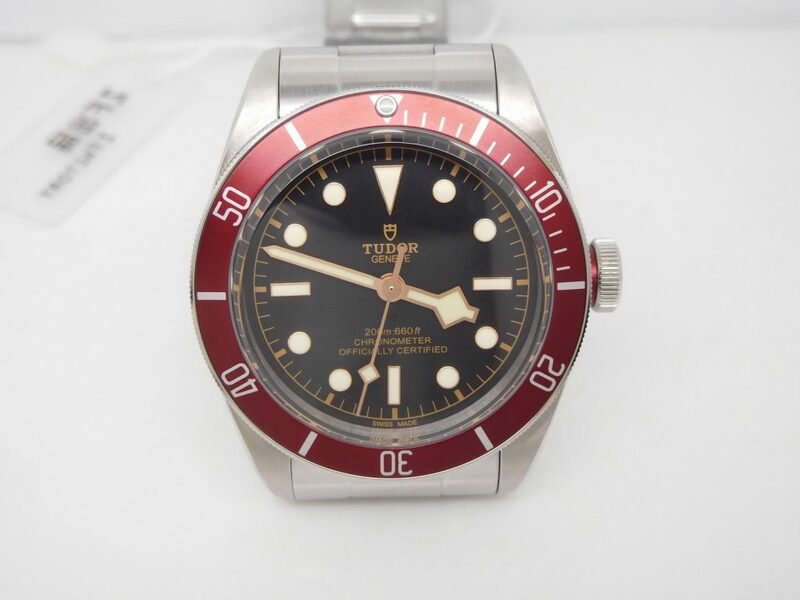 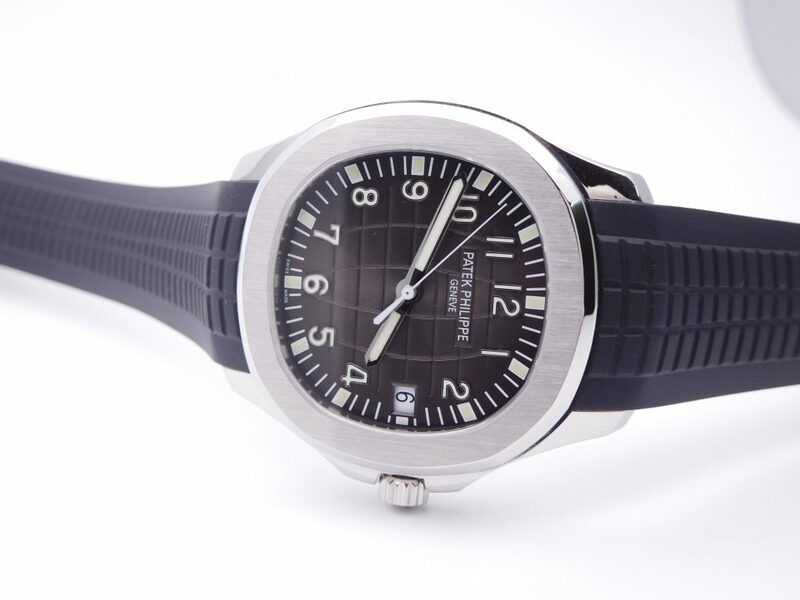 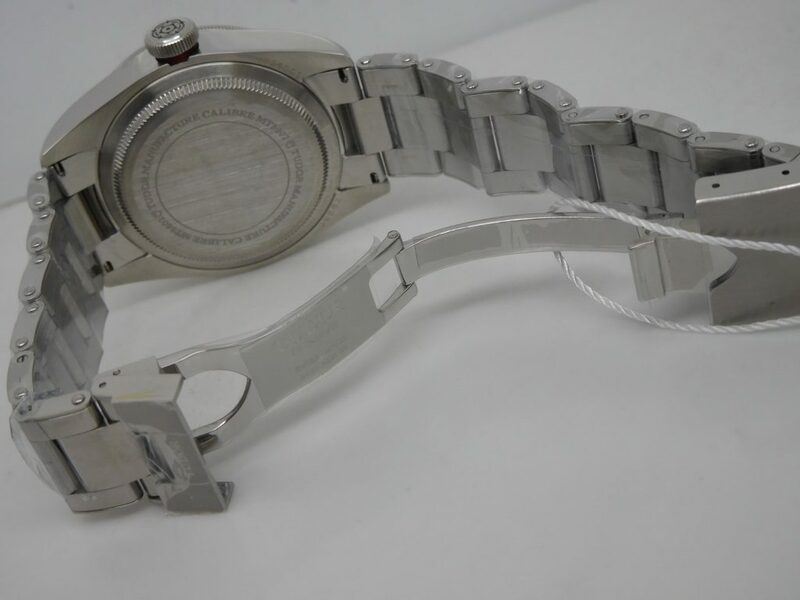 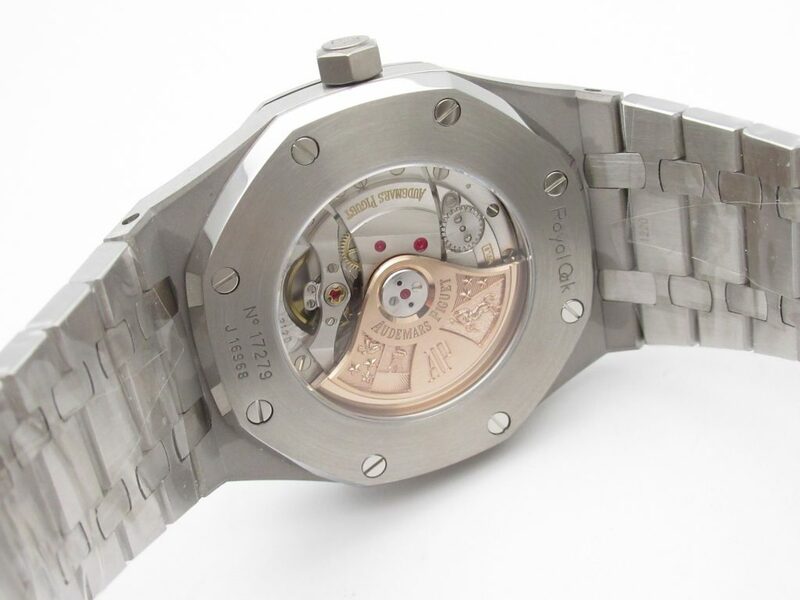 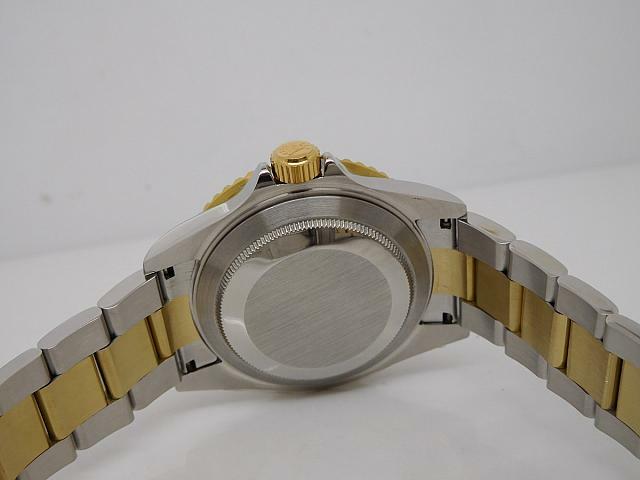 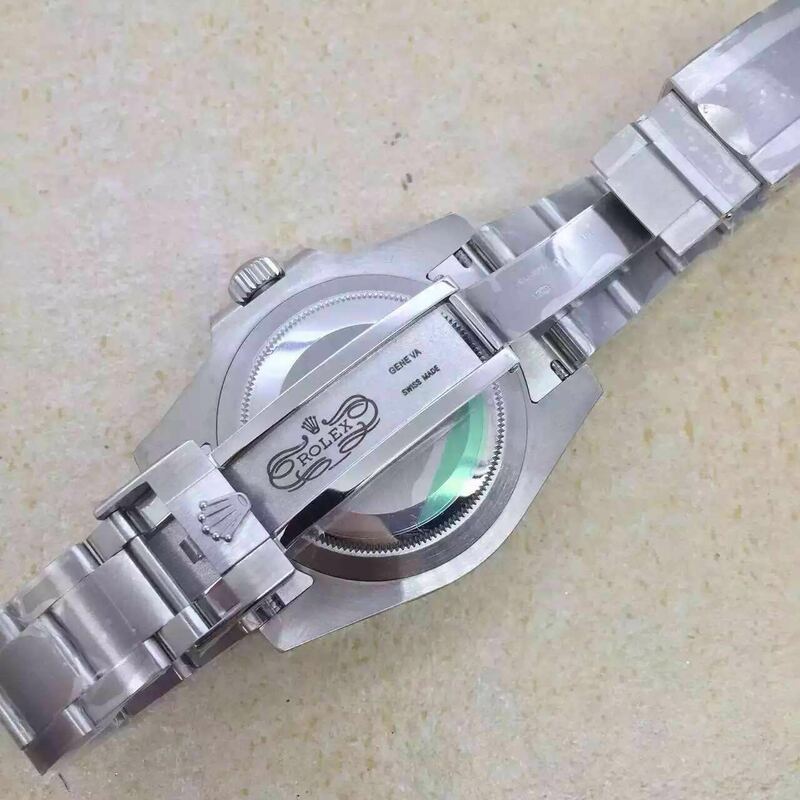 By the way, the watch is equipped with a Super Asian 3135 movement, it is modified from a Miyota 9015 automatic movement, and it is better than the clone 3135 movement that is modified with a Chinese automatic, as we all know, automatic movement coming from Japan is always more stable and accurate. 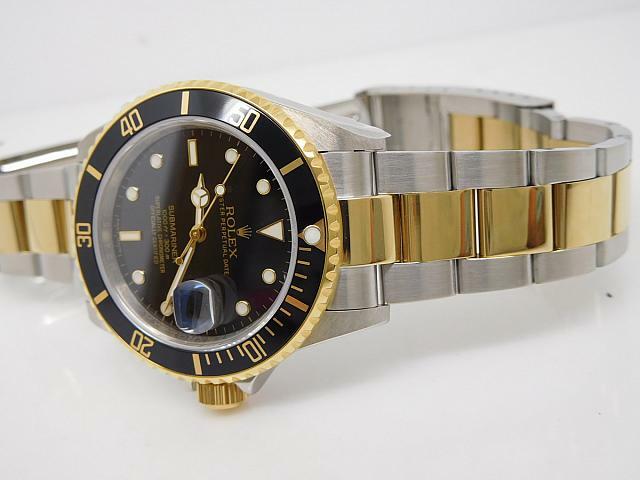 16610LV is an old Submariner model Rolex published to celebrate its 50th anniversary. 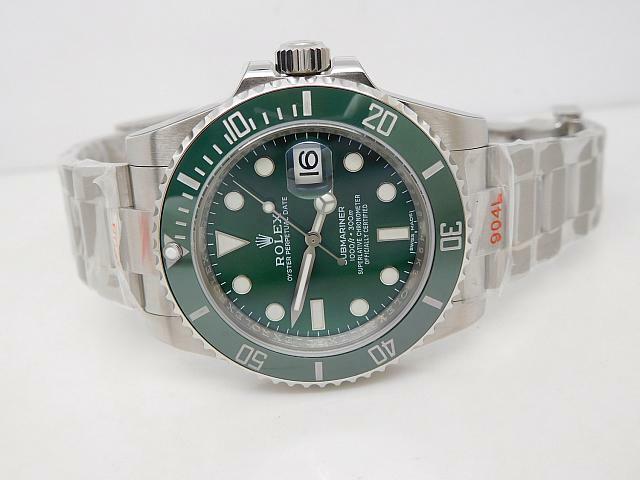 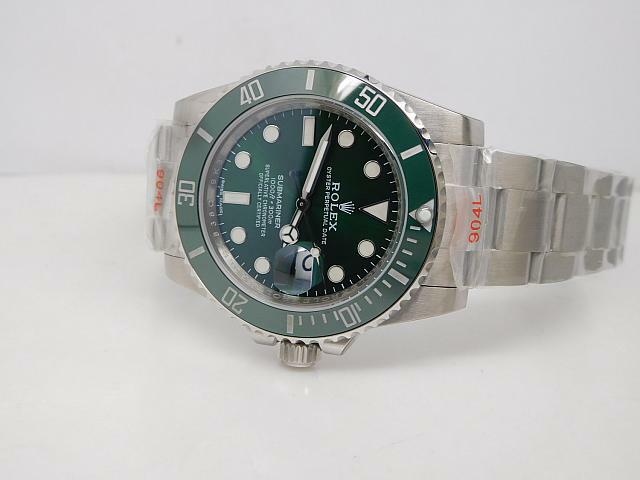 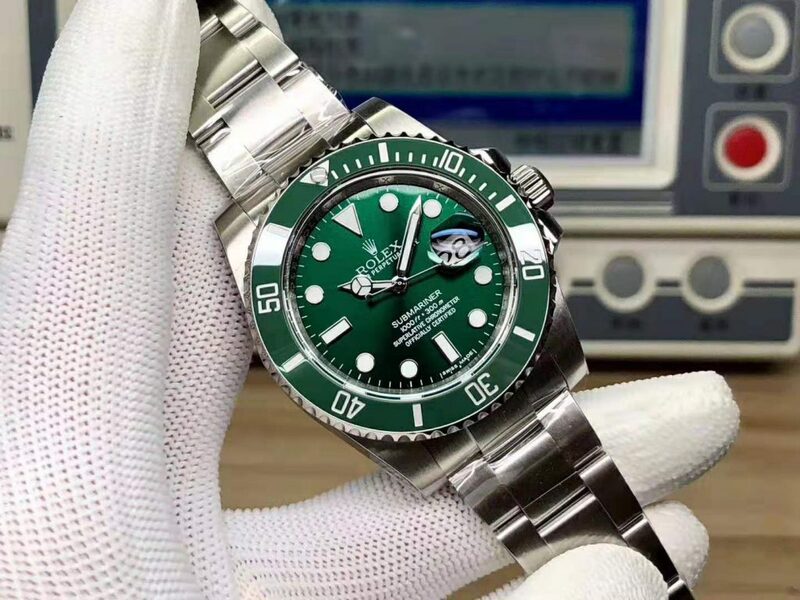 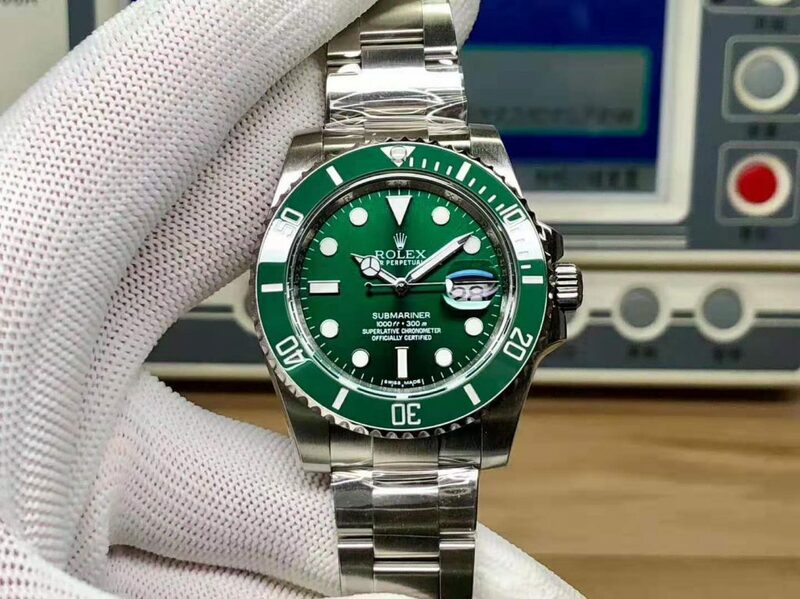 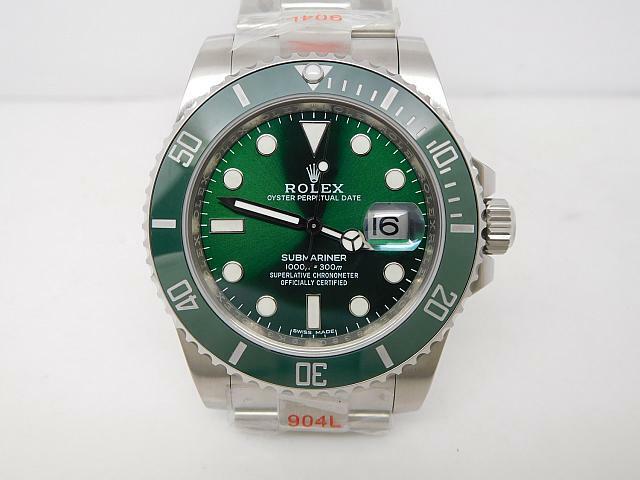 I think it is the first Submariner to use a green ceramic bezel, in next a few years, Rolex released another Submariner with green bezel and dial, it is 116610LV, but I still love the old 16610LV model, I like its green bezel and black dial, because this gives me a good visual impact. 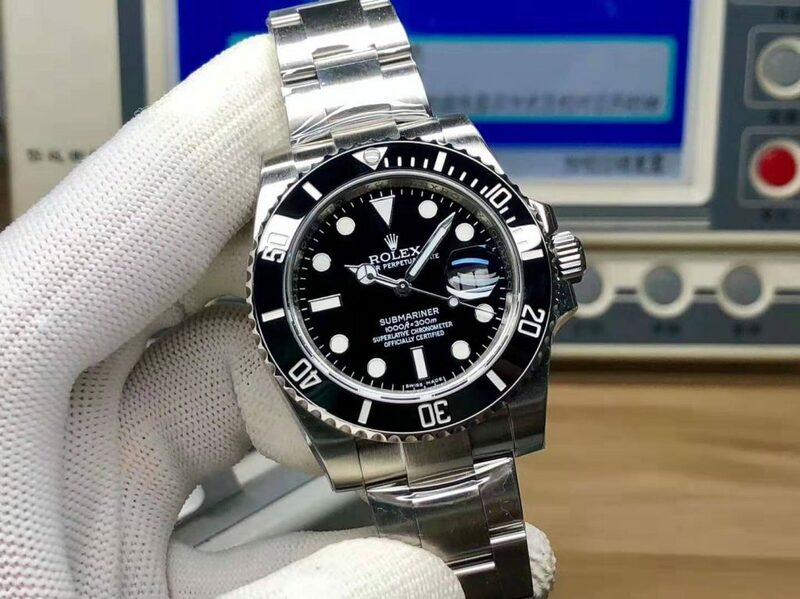 The replica Rolex Submariner 16610LV below is made by BP factory, it is the so-called Swiss Made Replica Watch we usually discuss. 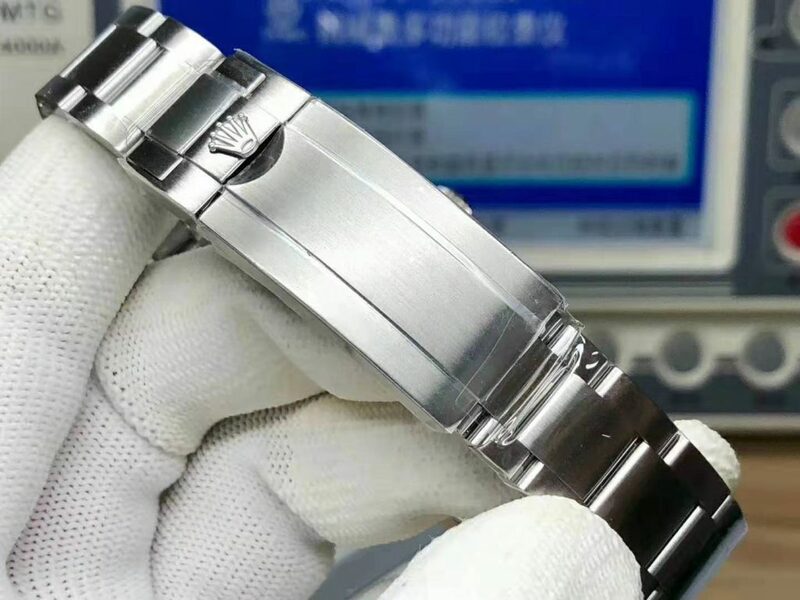 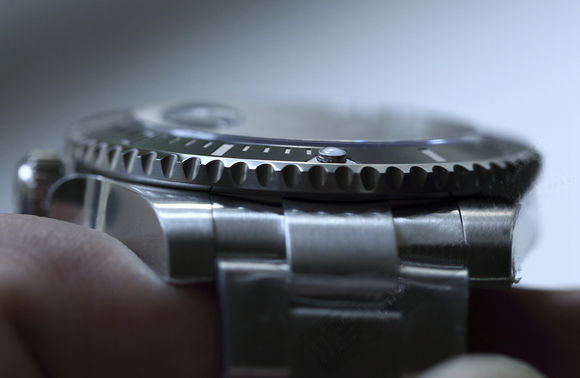 Every thing on case finishing, dial details and accuracy is perfect. 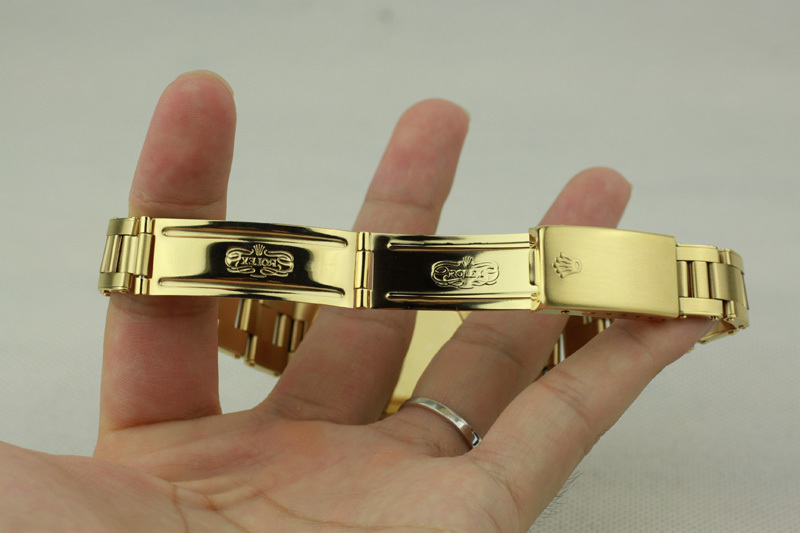 It gives a good wearing comfort and high end touch feeling. 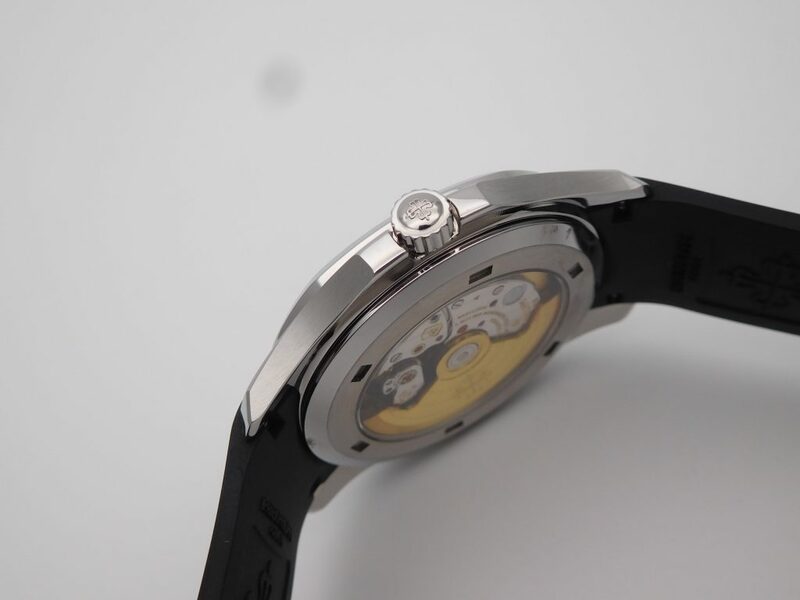 The biggest two selling points of the replica lie in its Swiss lume material and Super Clone 3135 movement. 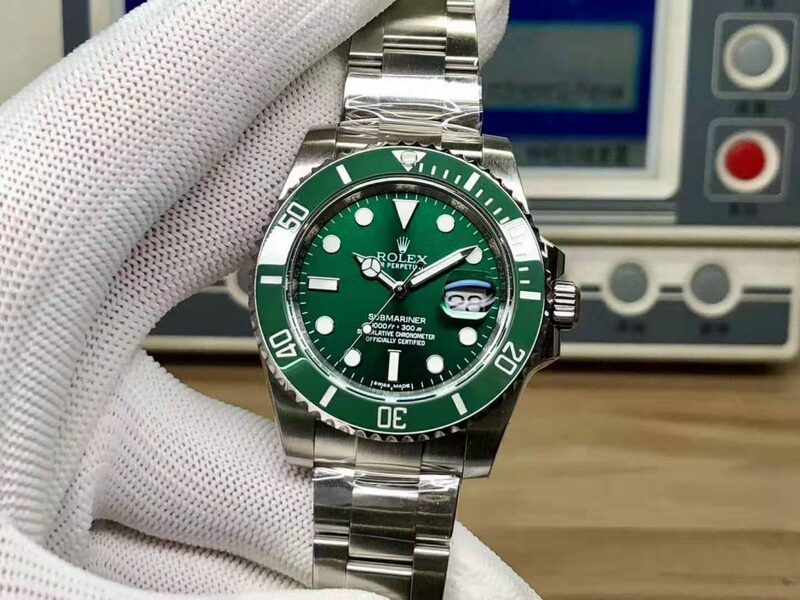 First, hour markers and hands on black dial are applied white luminescence, this lume material is imported from Switzerland, its lume color and durability are the same as that used on genuine Submariner watch. 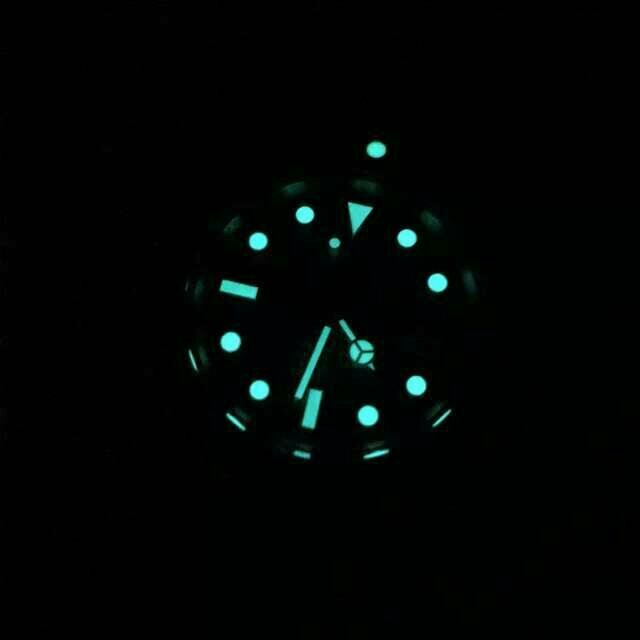 The hands, hour markers and bezel pearl all emit green light in the dark. 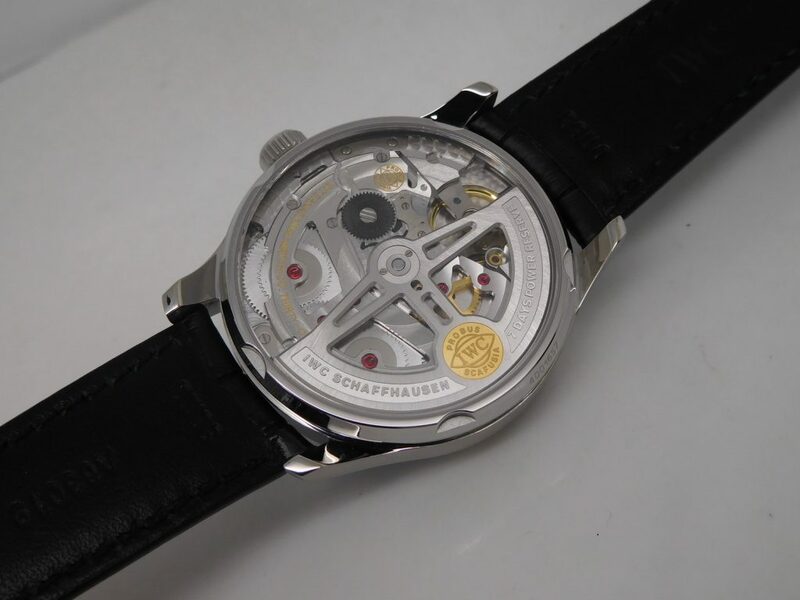 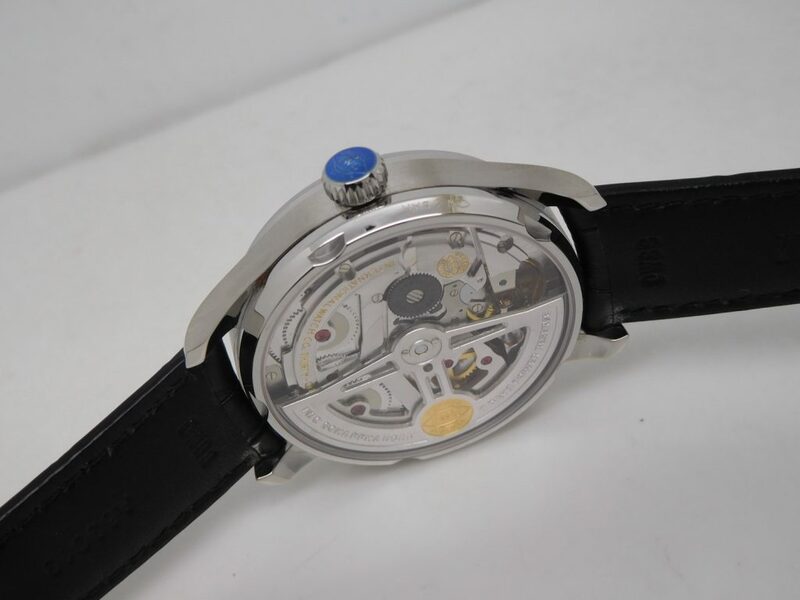 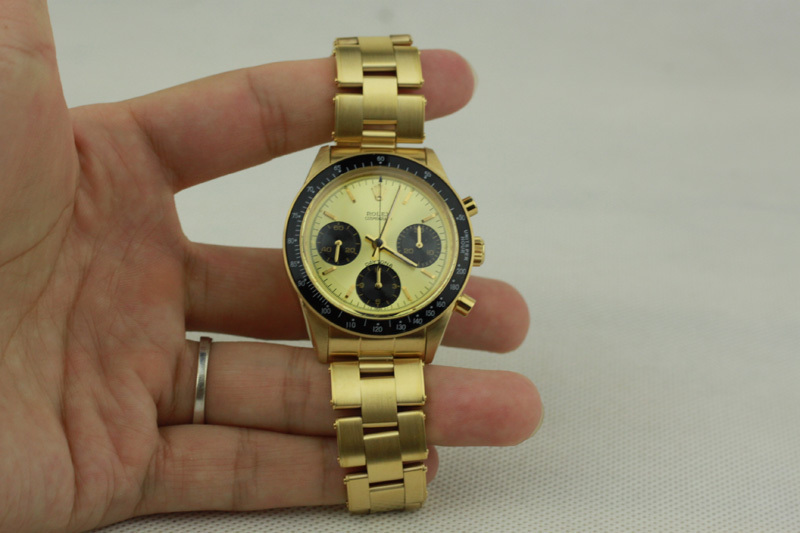 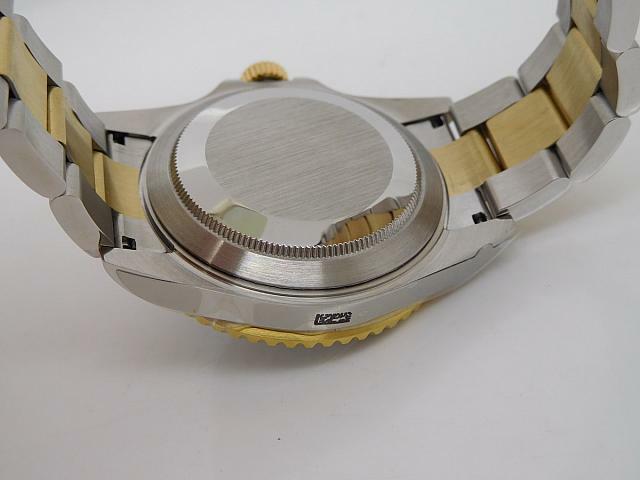 Second, the replica is equipped with a Super Clone Asian 3135 movement, we call this movement SA3135 here. 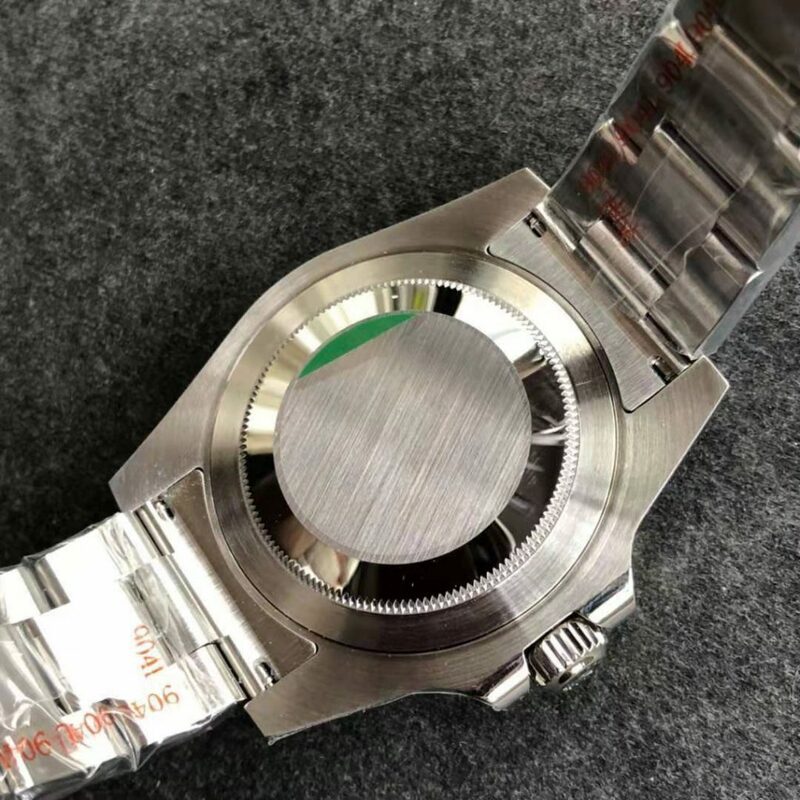 Some people will doubt whether the replica 16610LV is equipped with SA3135 or not, but I have to say ETA 2836 and SA3135 give two different winding feeling, when you have a chance to wind the two movements, you will find their difference easily without opening the case back. 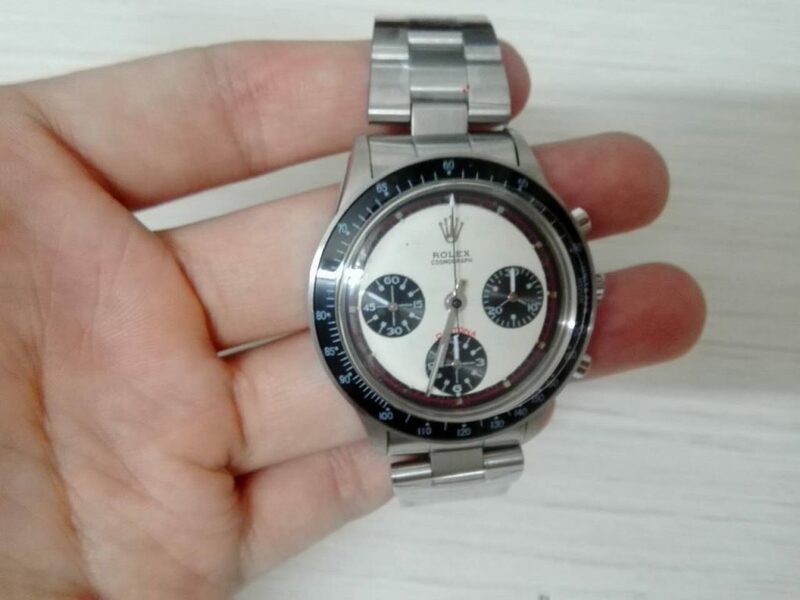 Although SA3135 makes the replica closer to genuine watch, I still suggest people buy the replica with Asian ETA 2836, which is much cheaper. 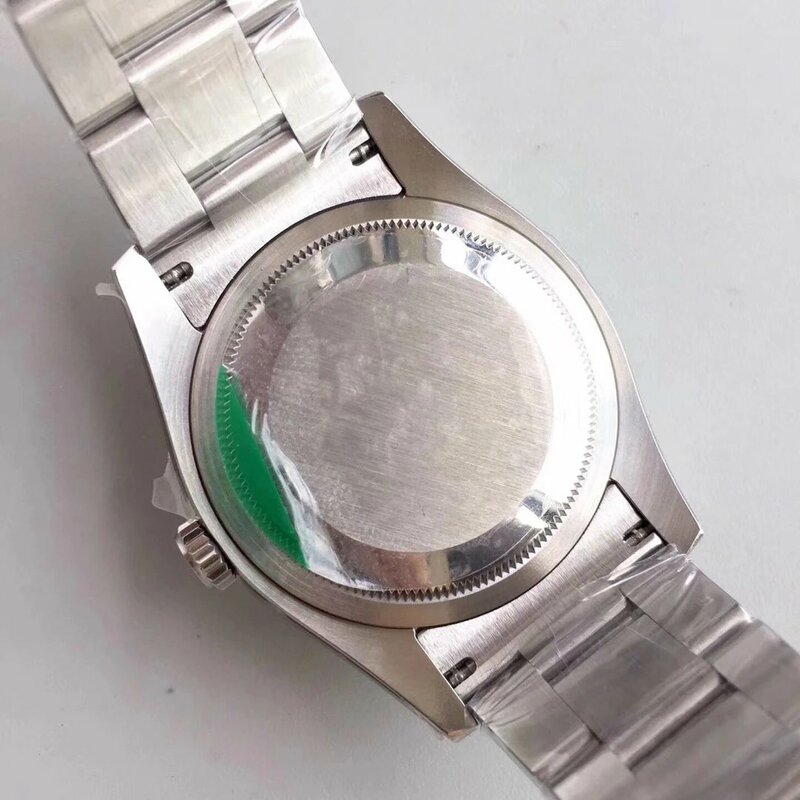 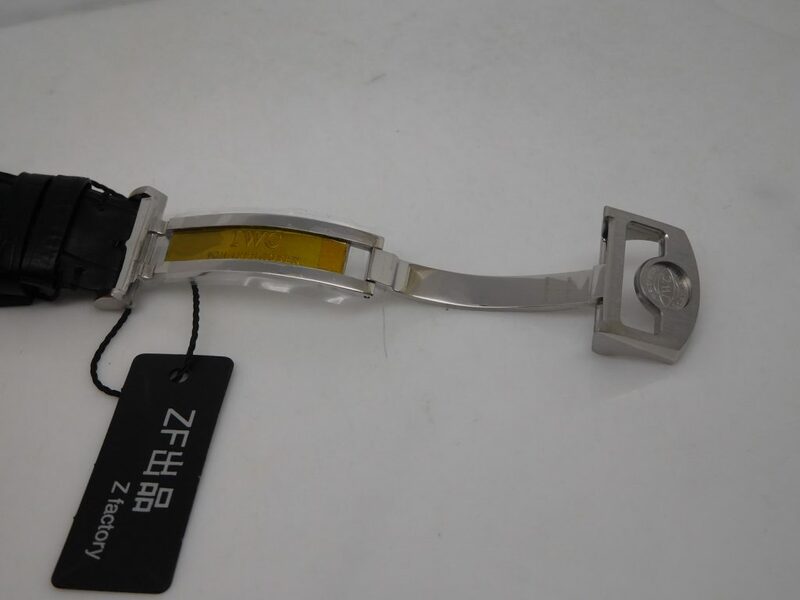 Besides, SA3135 movement is completed on the base of a Chinese automatic, which means too many movement parts have been modified on the base movement, I think the stability of SA3135 should be doubted, also its repairing rate may be higher than A2836. 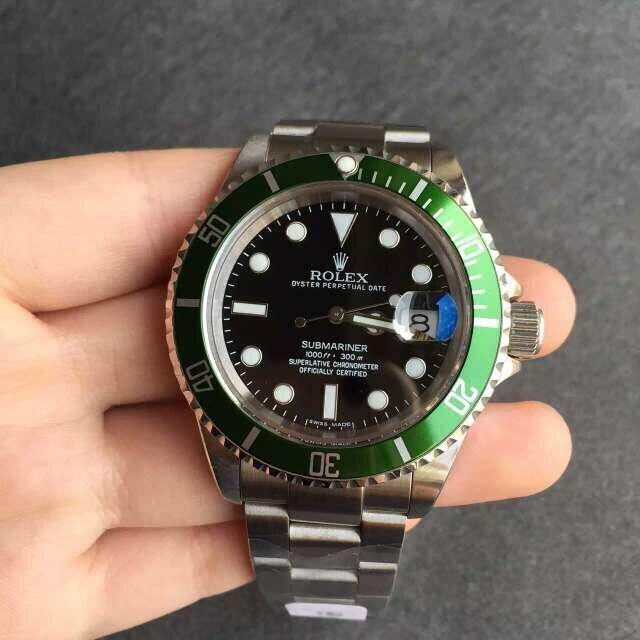 That’s my opinion, welcome to leave comments here to describe what’s in your mind. 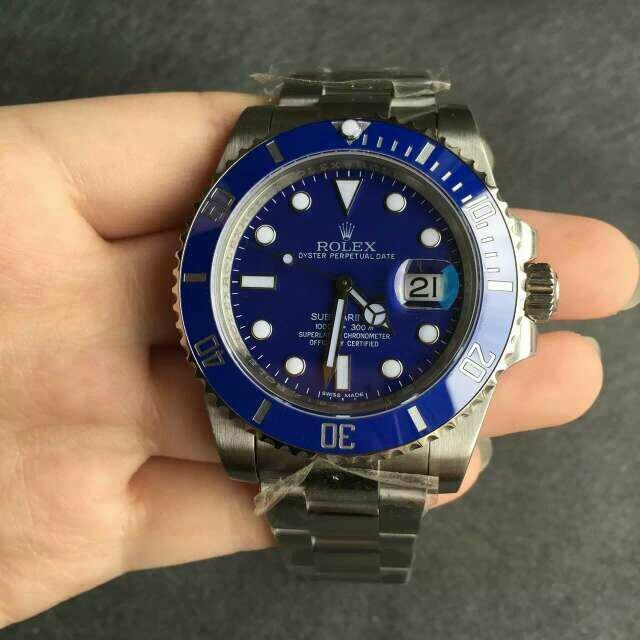 The replica is the best verion of blue Submariner, it is also the best seller in 2015 and continues to make its legend. 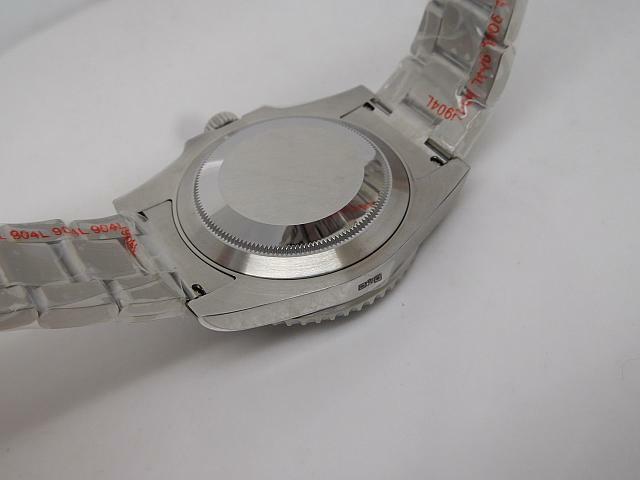 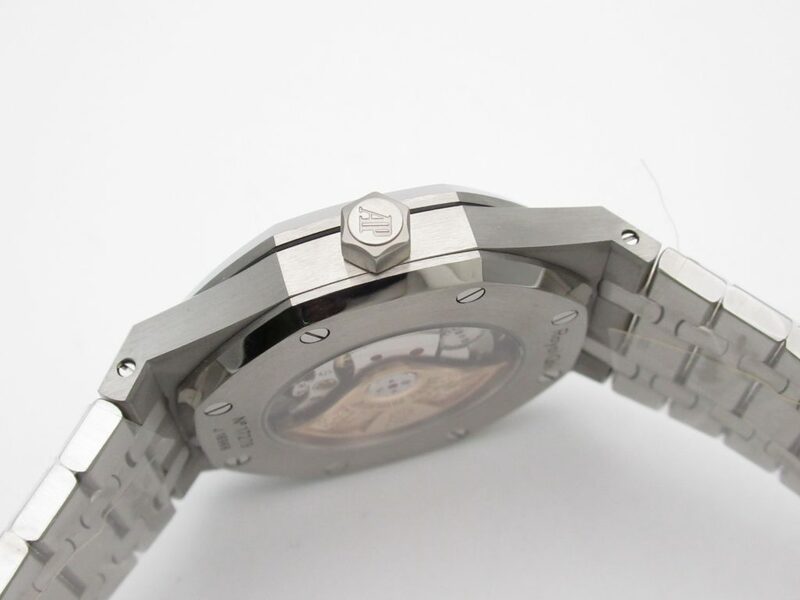 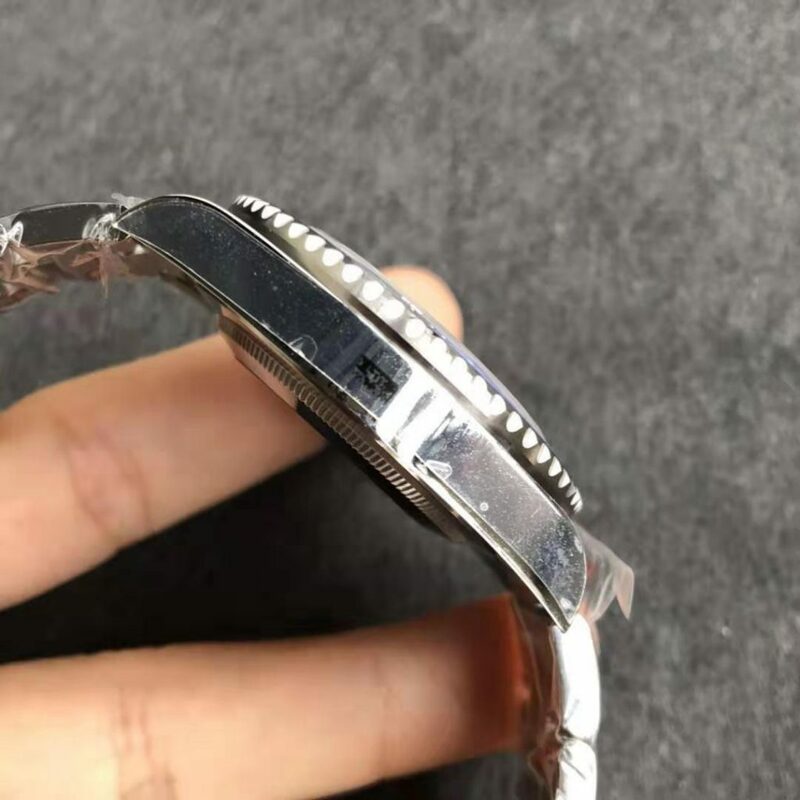 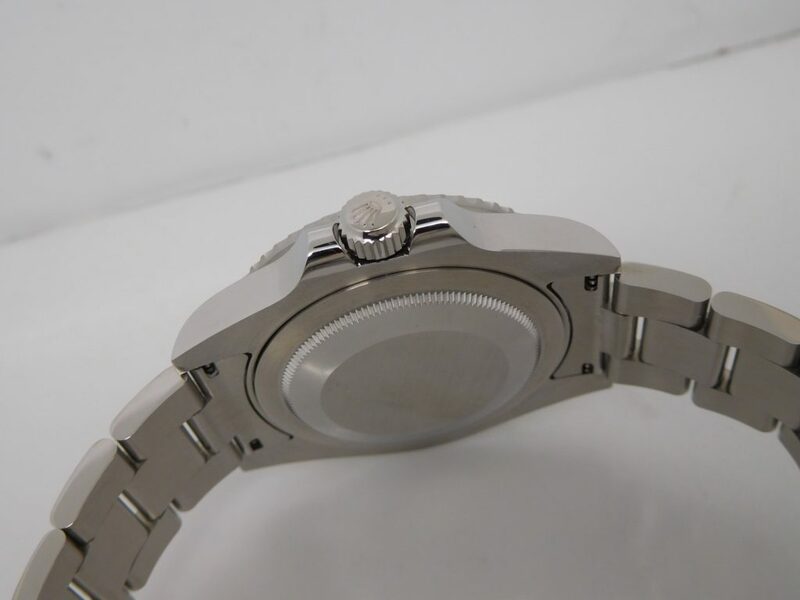 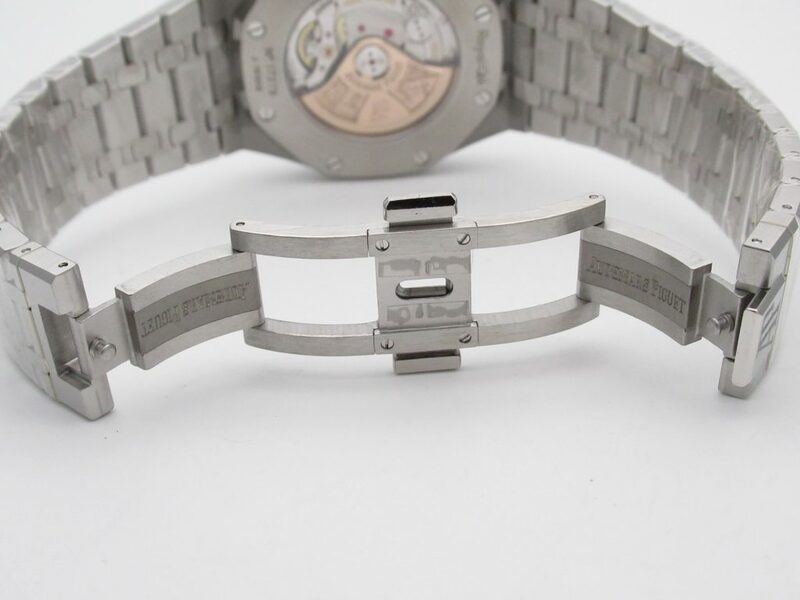 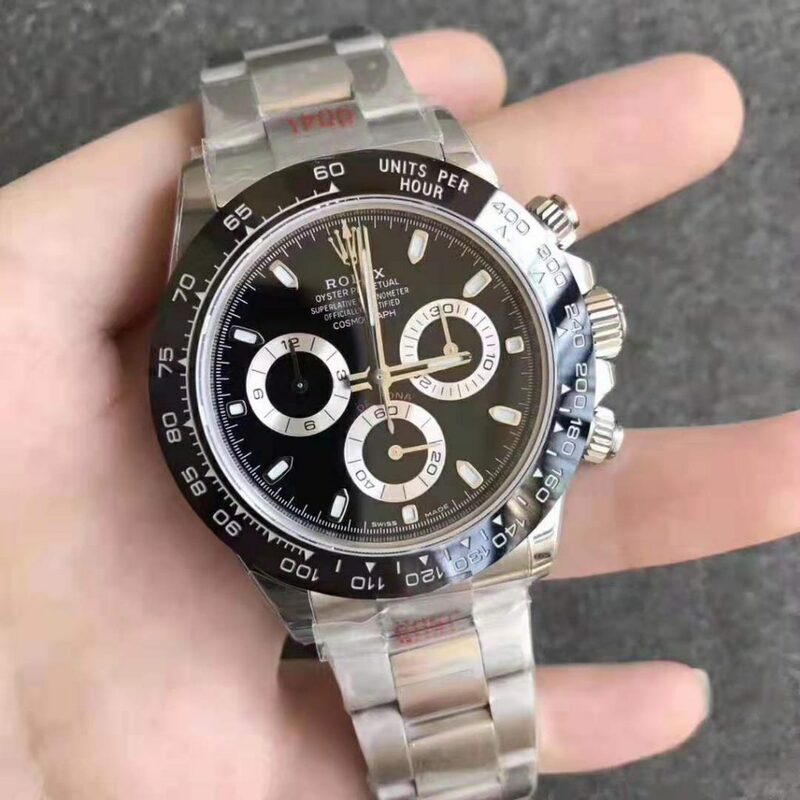 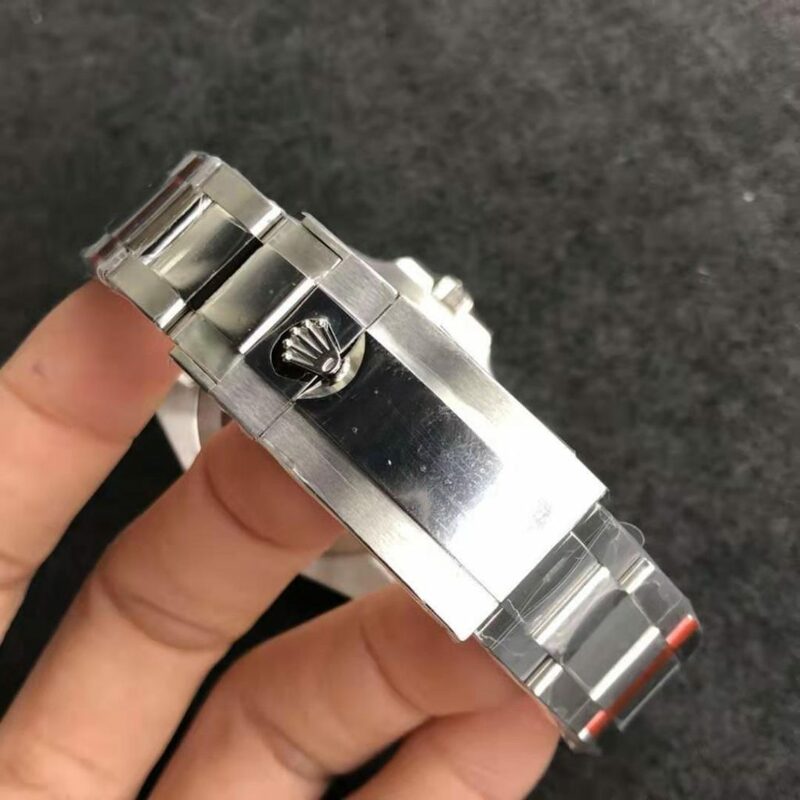 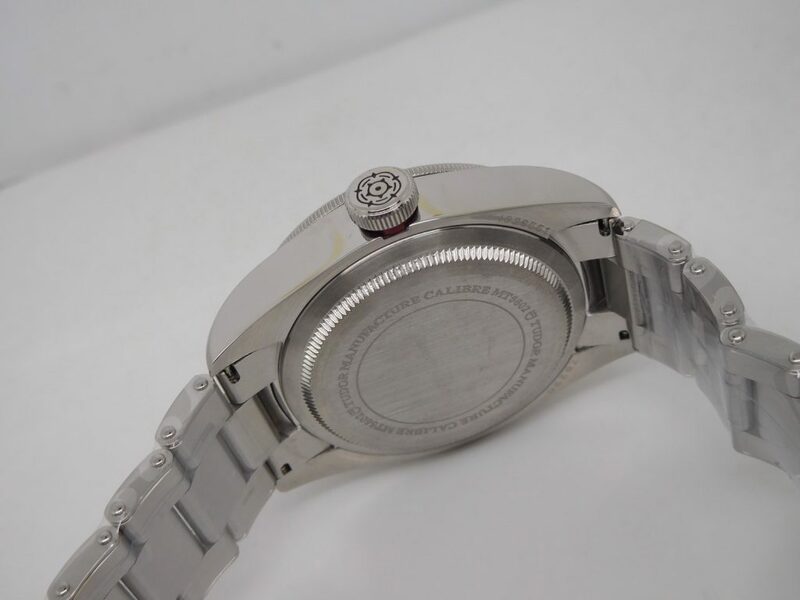 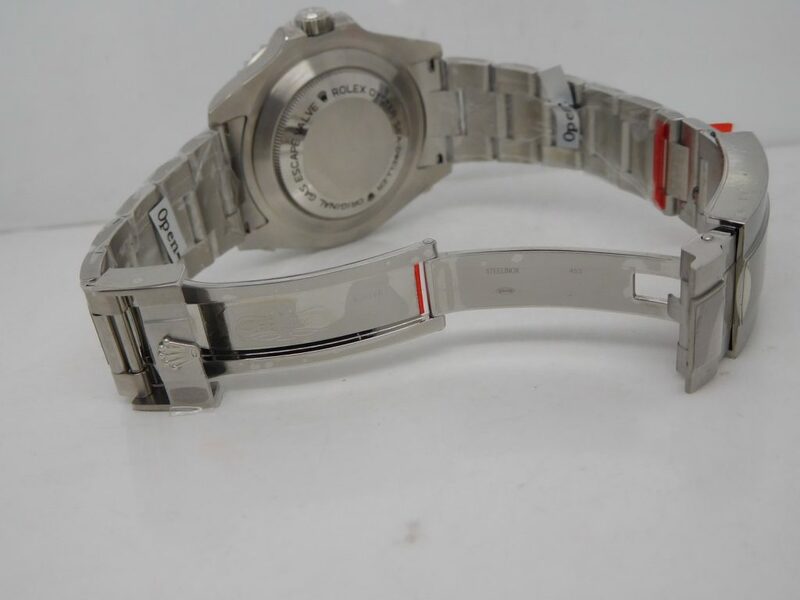 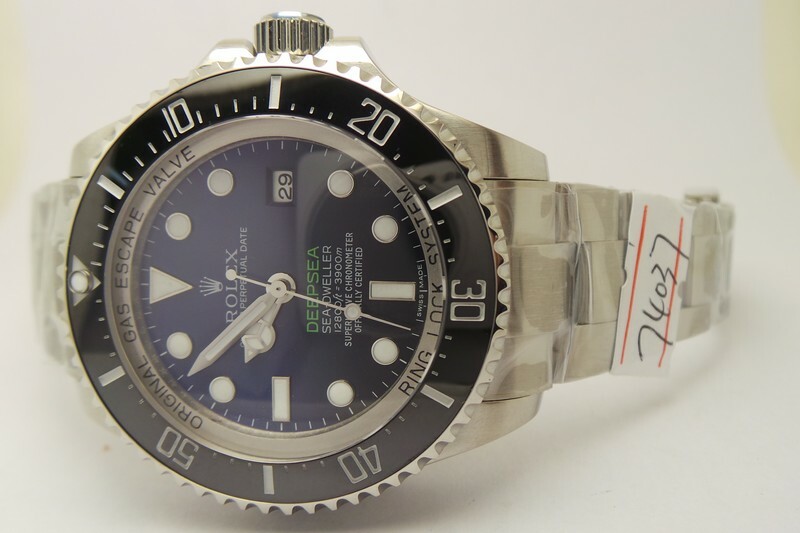 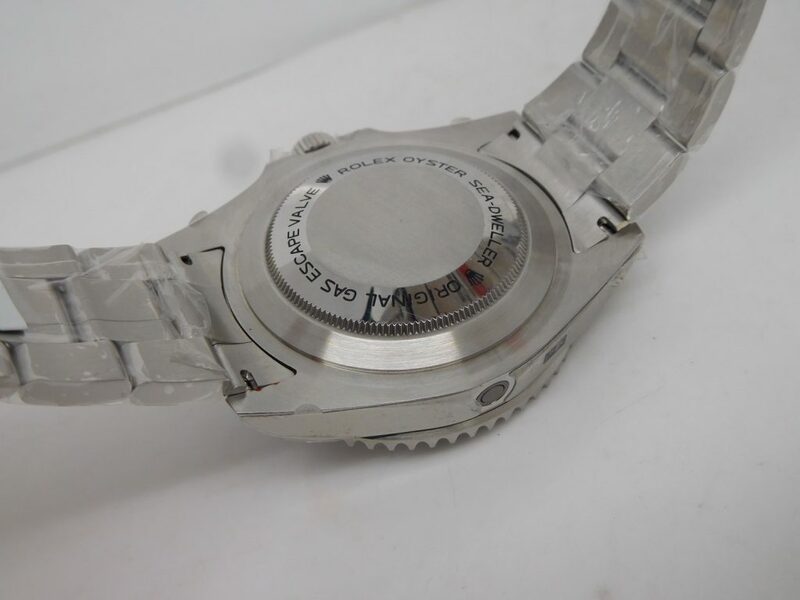 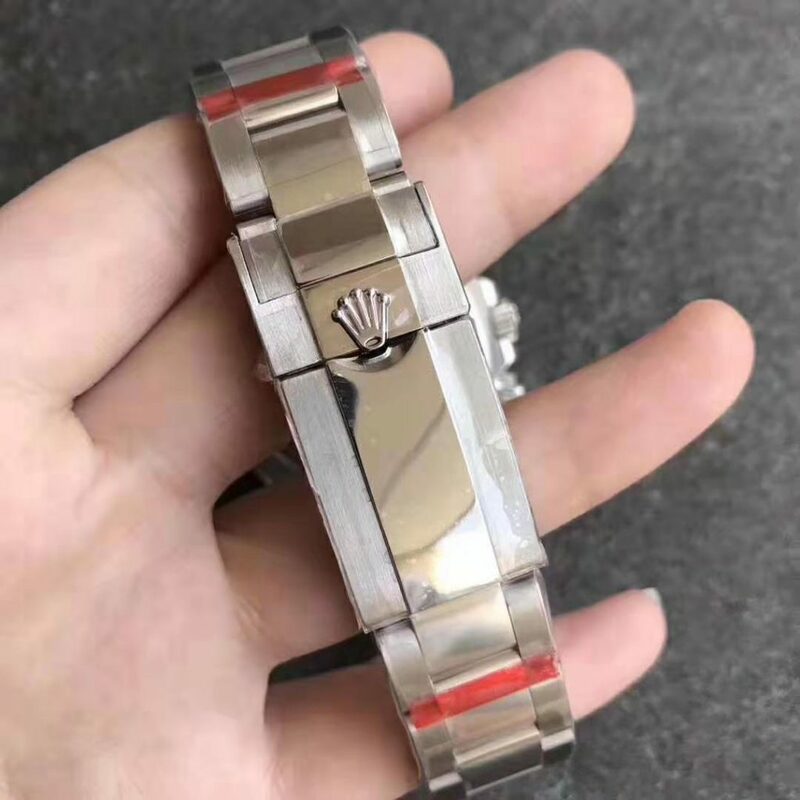 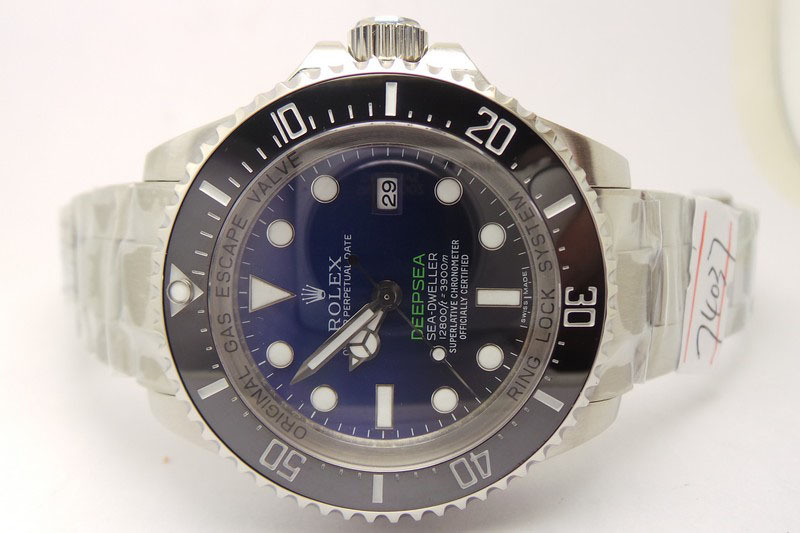 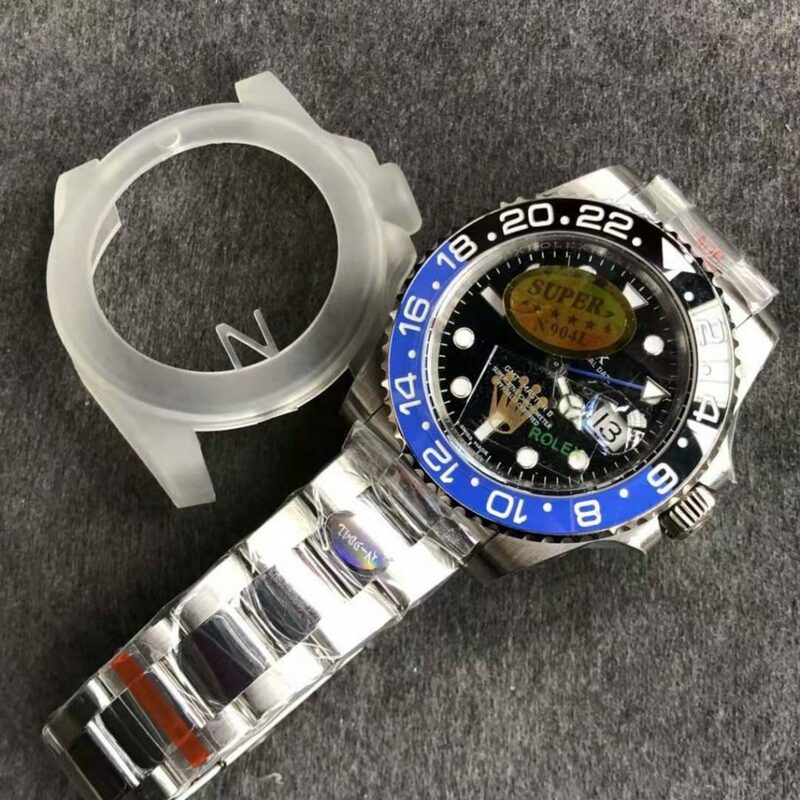 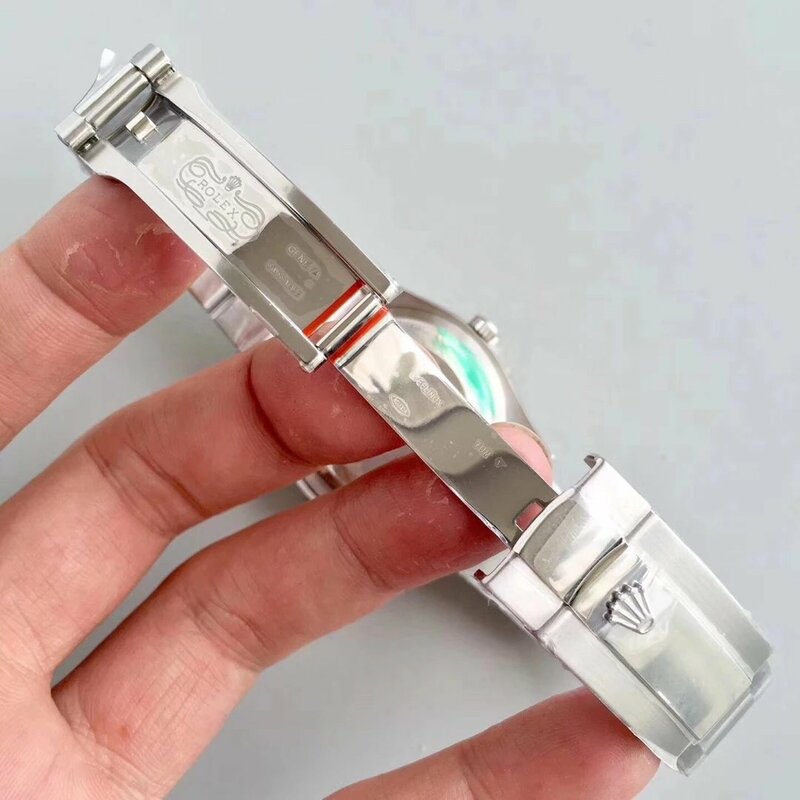 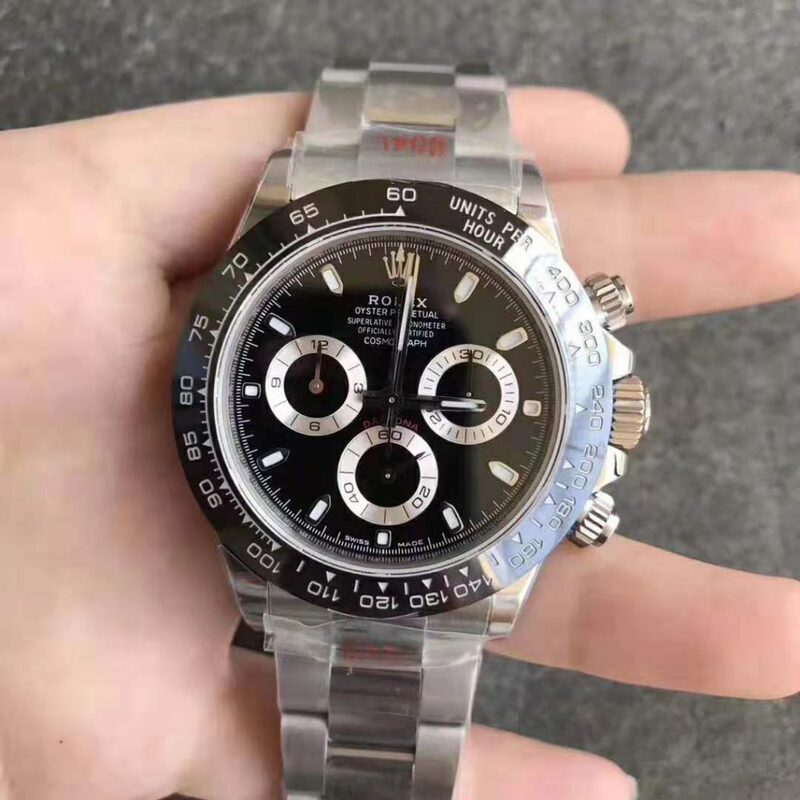 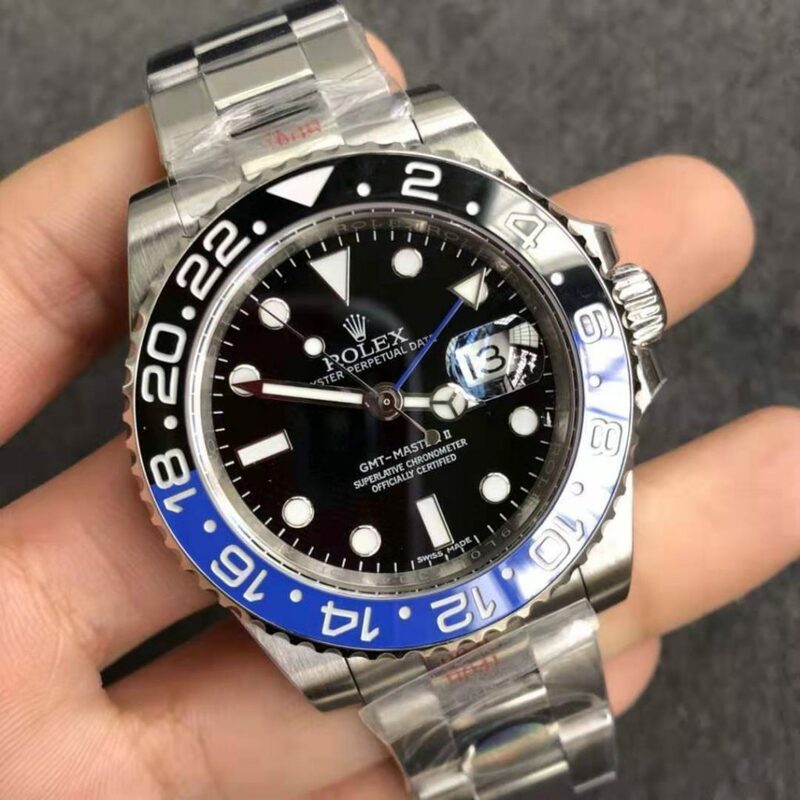 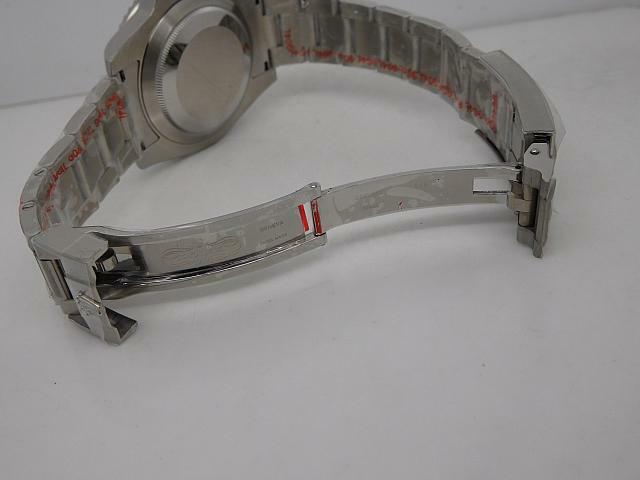 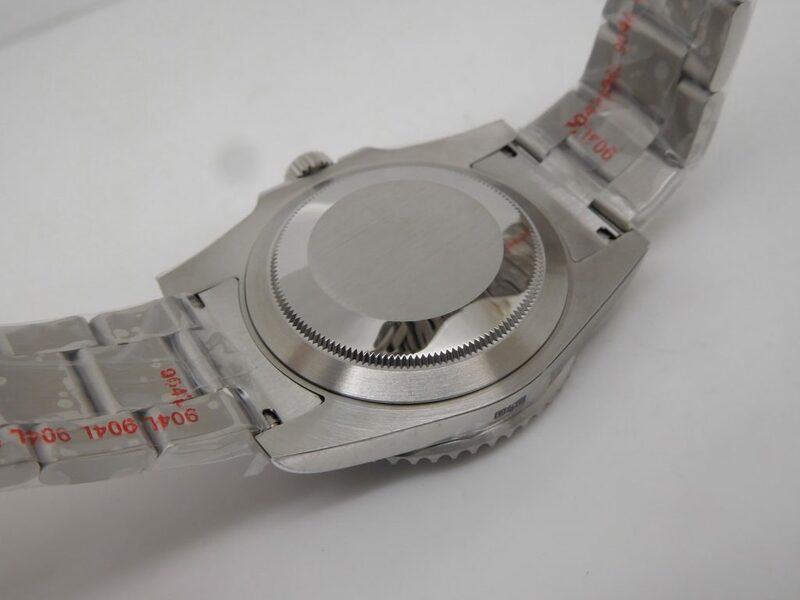 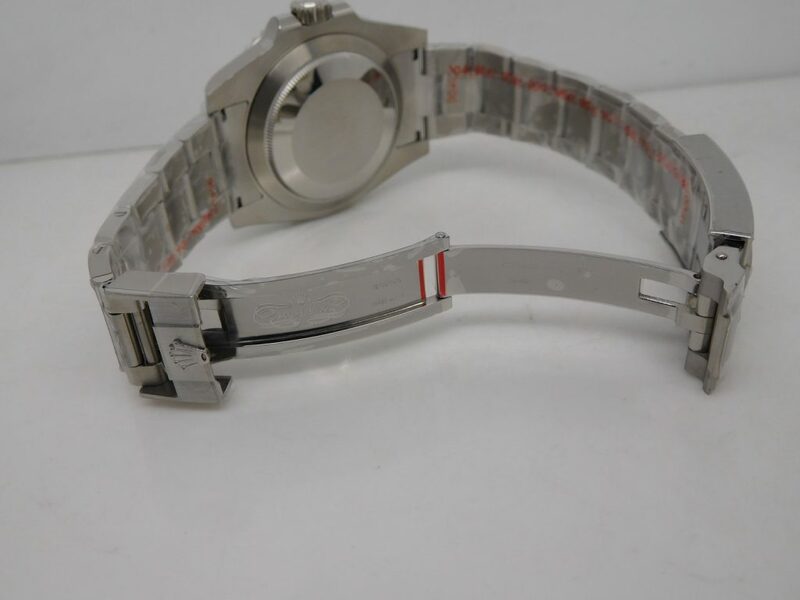 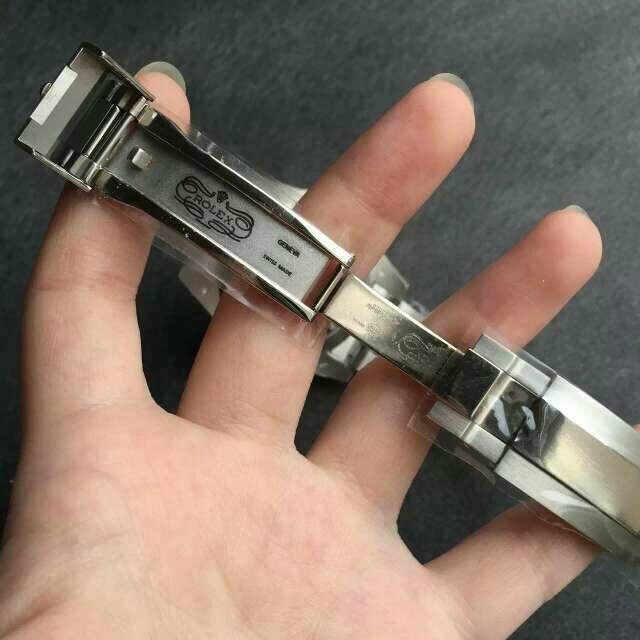 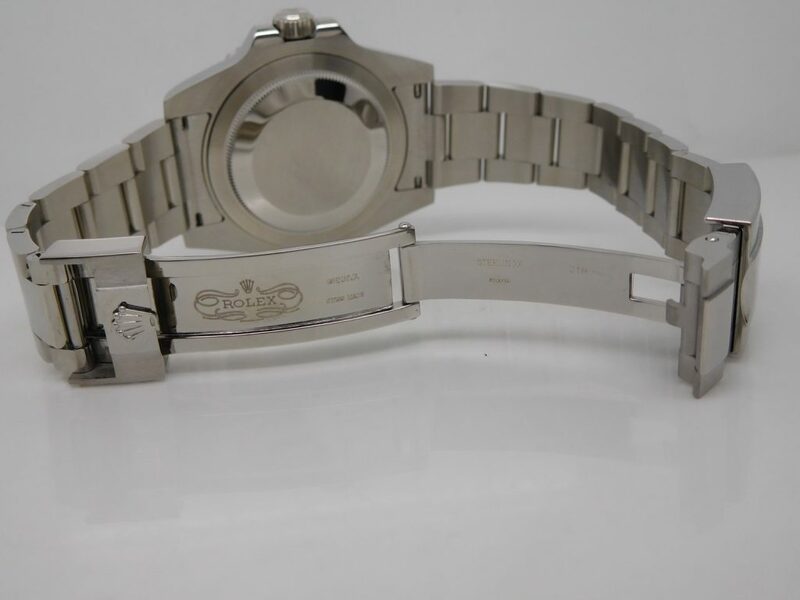 There is an anti-counterfeit laser crown at 6, common versions his it printed, the bezel markers are in silver while other versions are in white. 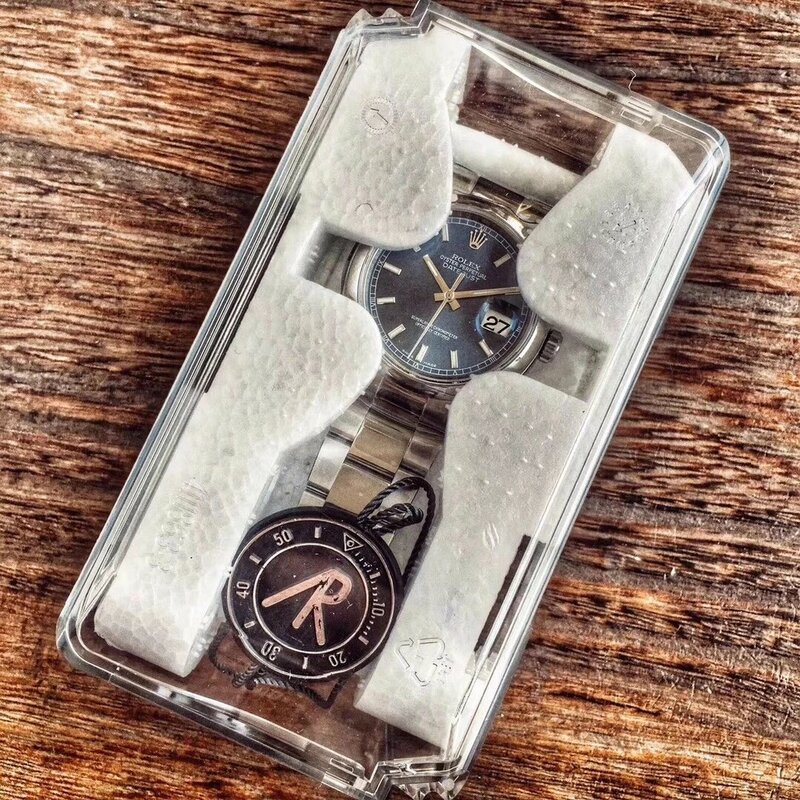 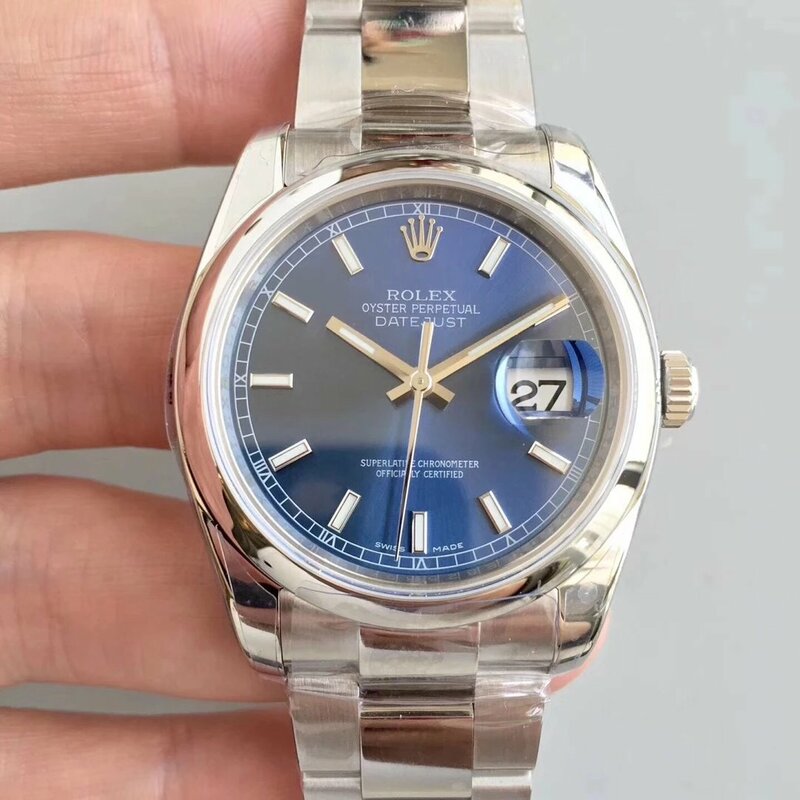 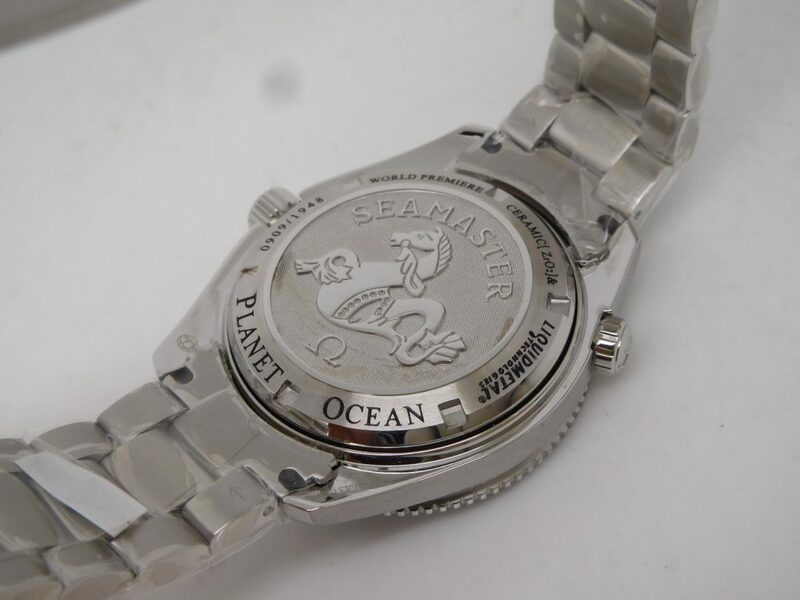 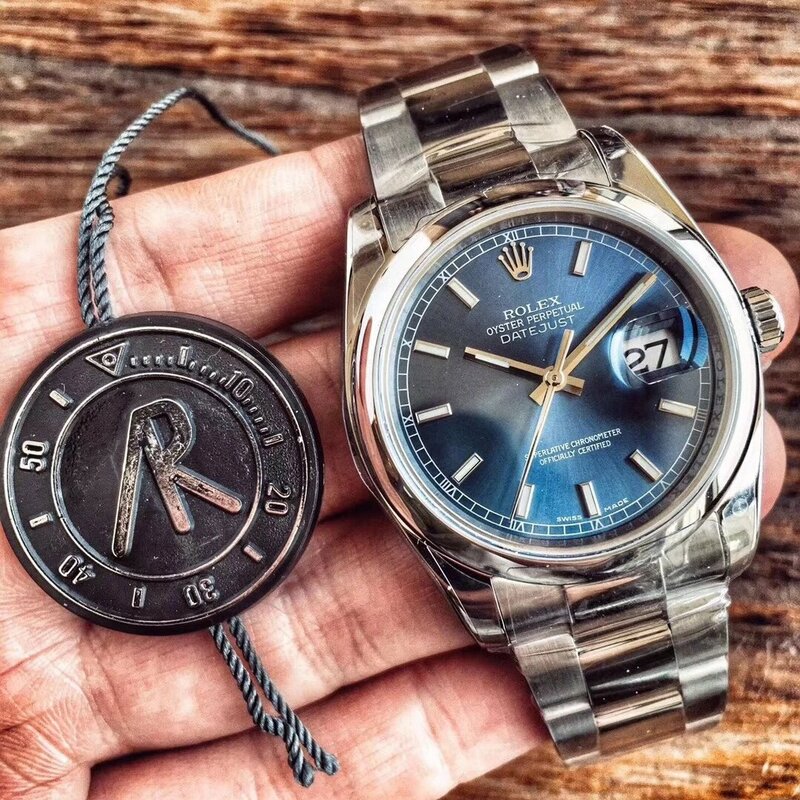 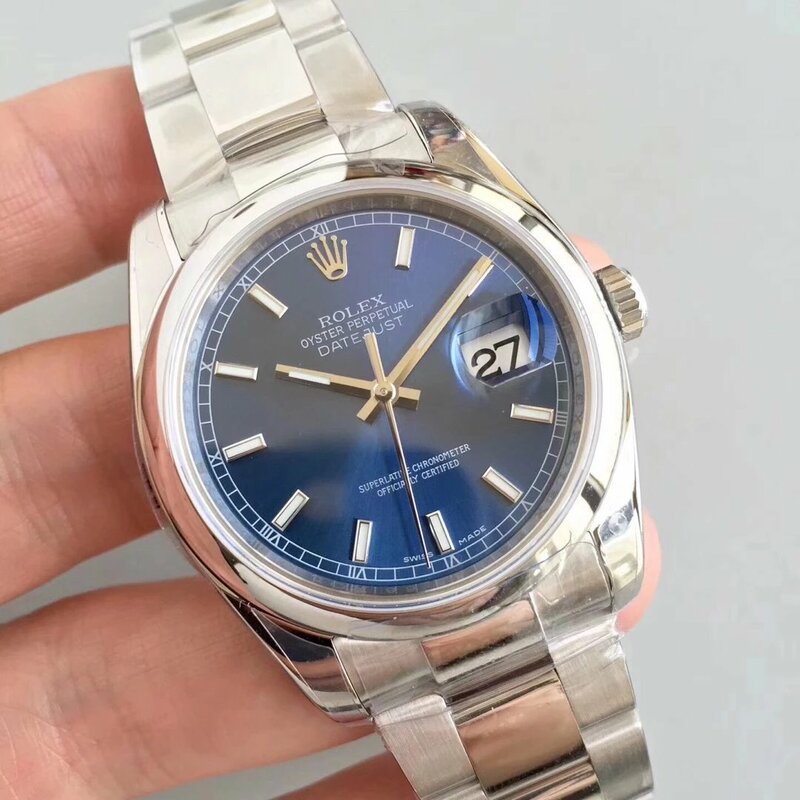 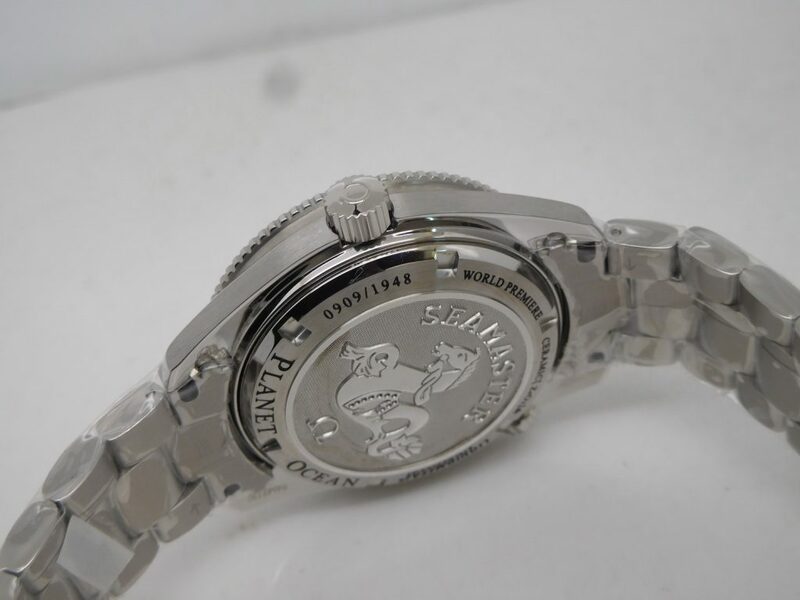 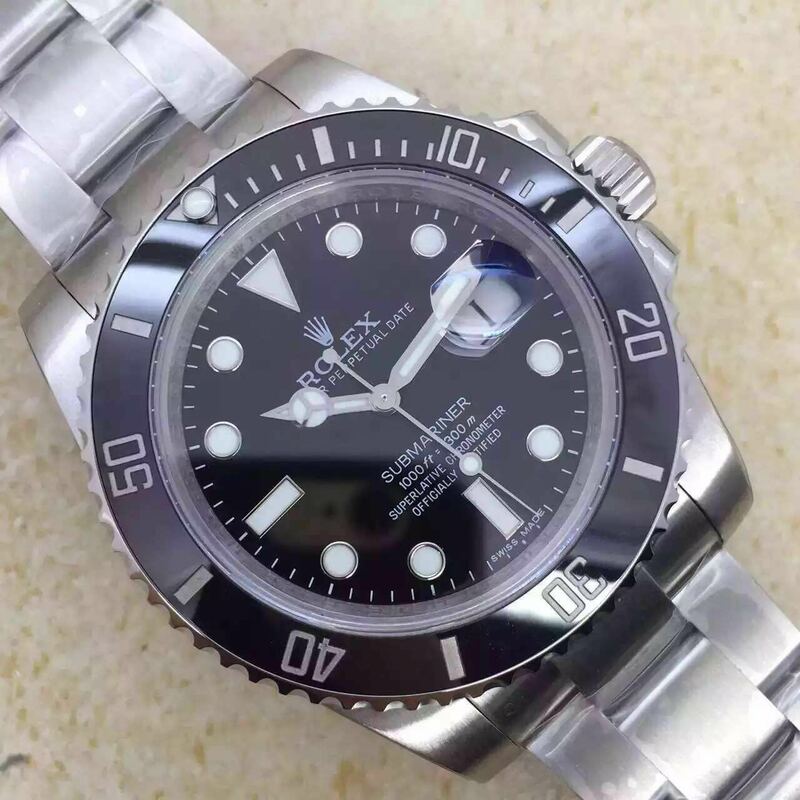 The replica has a lot of things improved, the bezel has the same construction as genuine, it has the same clicking sound as genuine, the bezel markers are deeply engraved, crystal is sapphire, the proportion of Crown Logo on dial is modified, the laser crown is in crystal not printed, it consists of laser points. 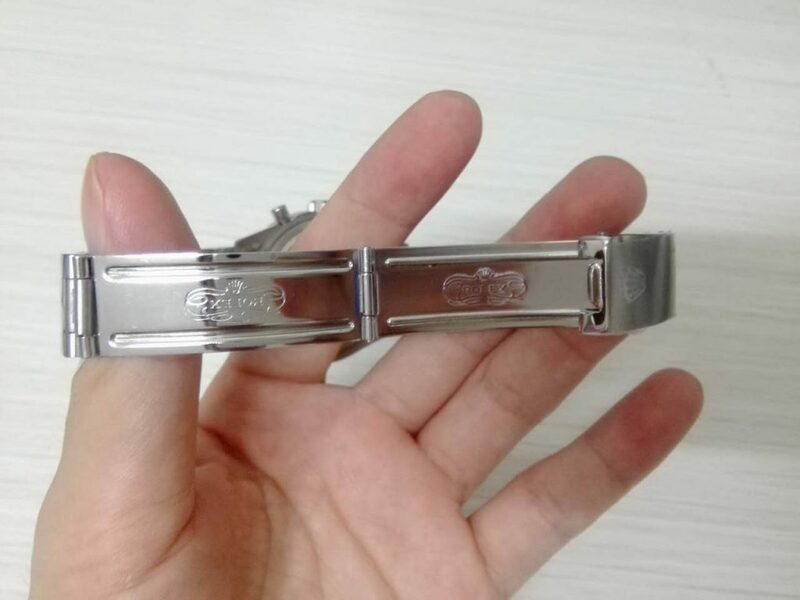 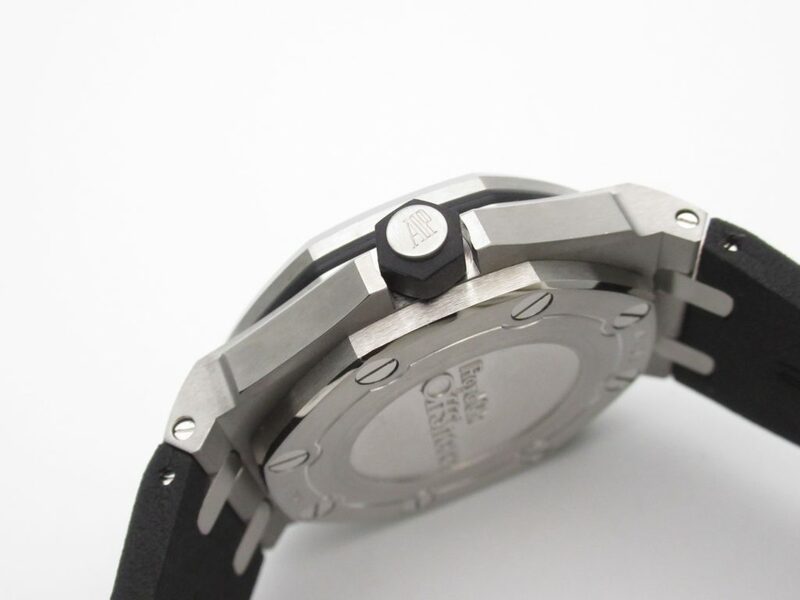 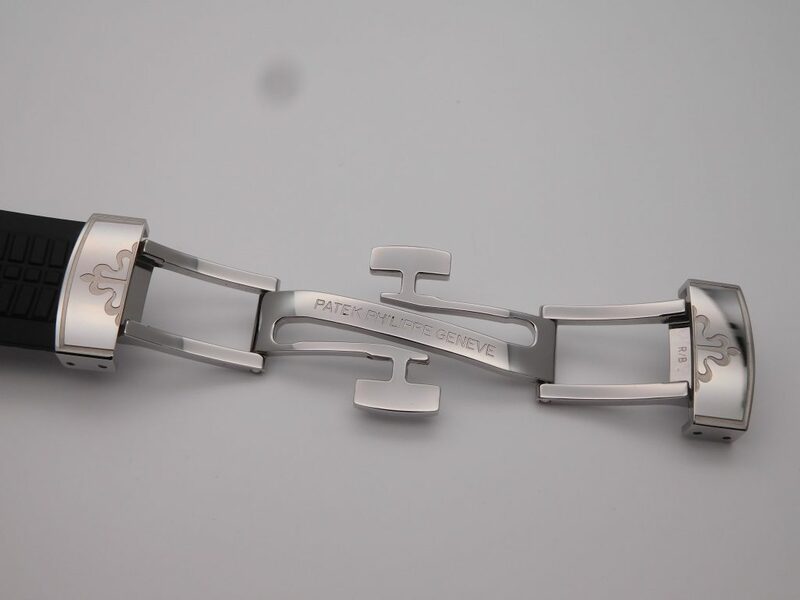 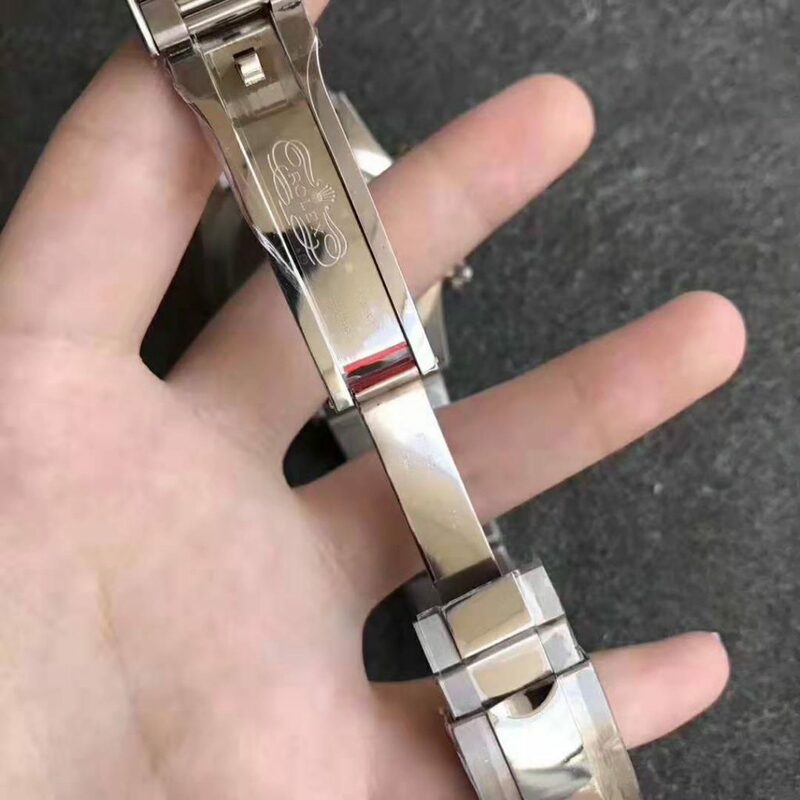 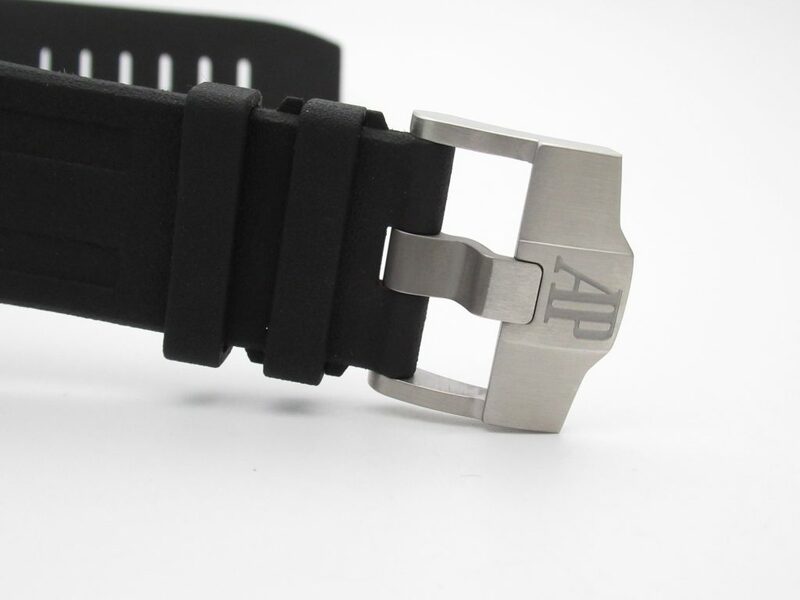 The connector between case and bracelet is improved, black clasp engraving is closer to genuine. 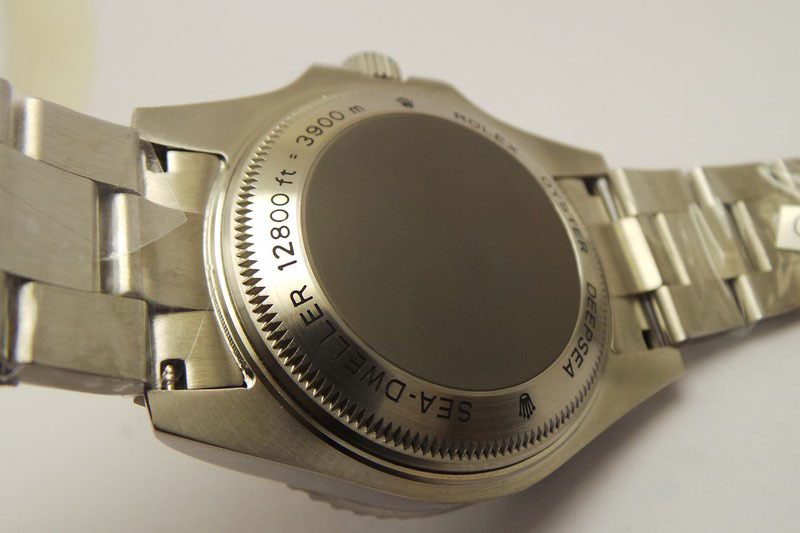 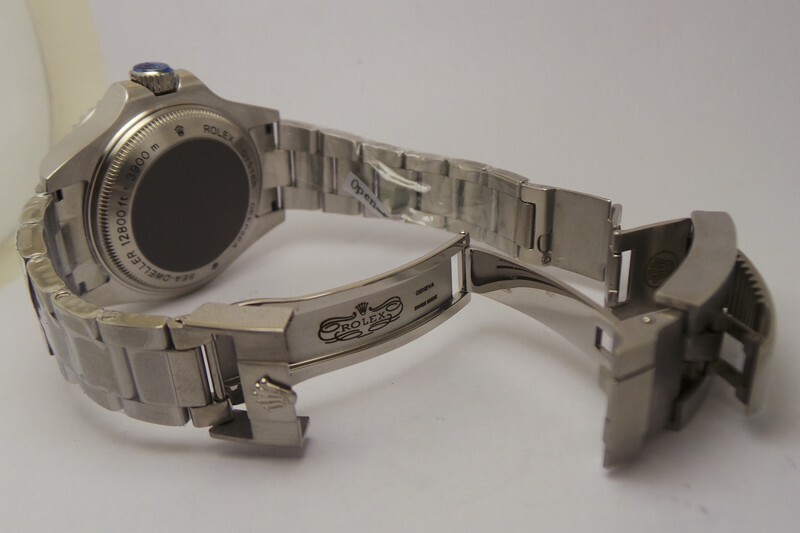 There is an independent laser reference number on inner bezel at 6, each watch is unique. 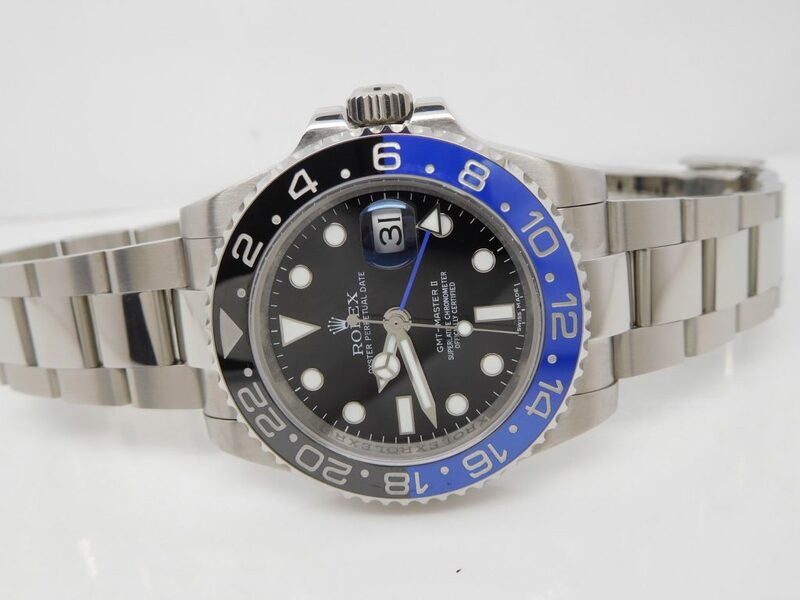 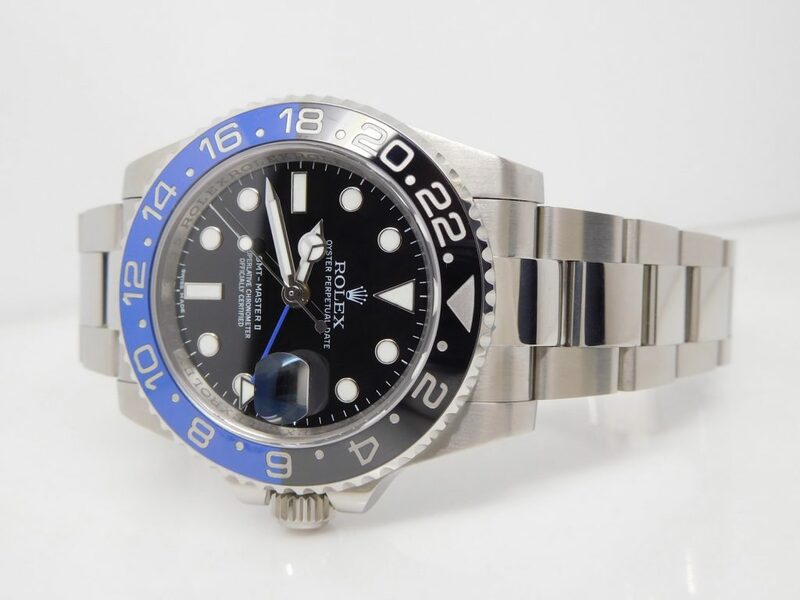 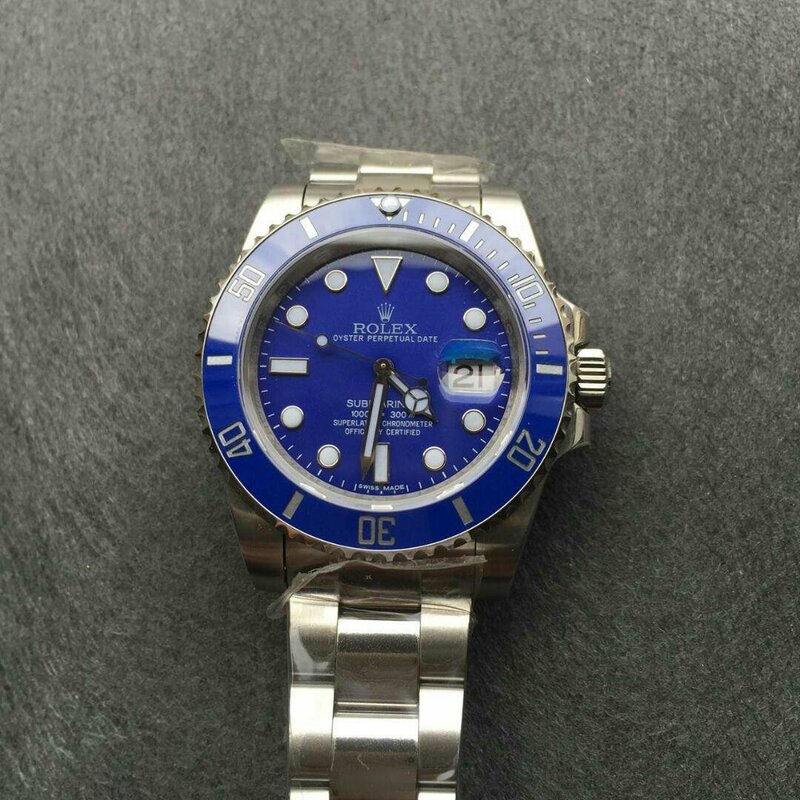 In a word, the replica Rolex is currently the best blue Submariner 116619LB. 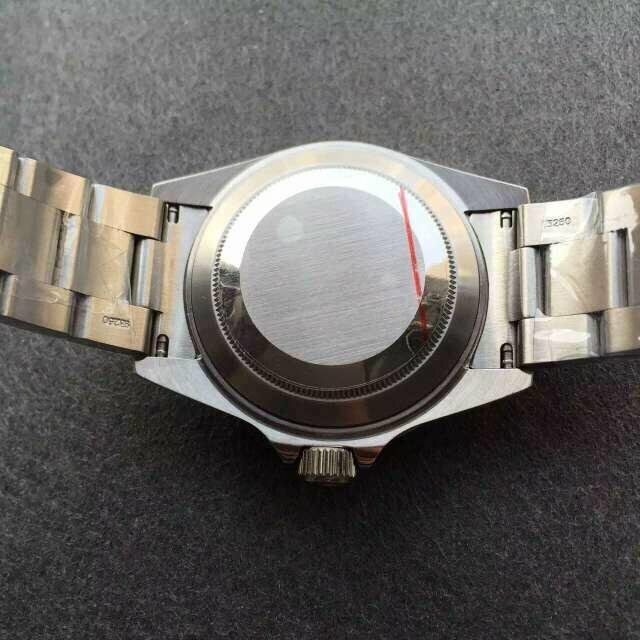 Here are some pictures I just took from the watch that was borrowed from my watch supplier. 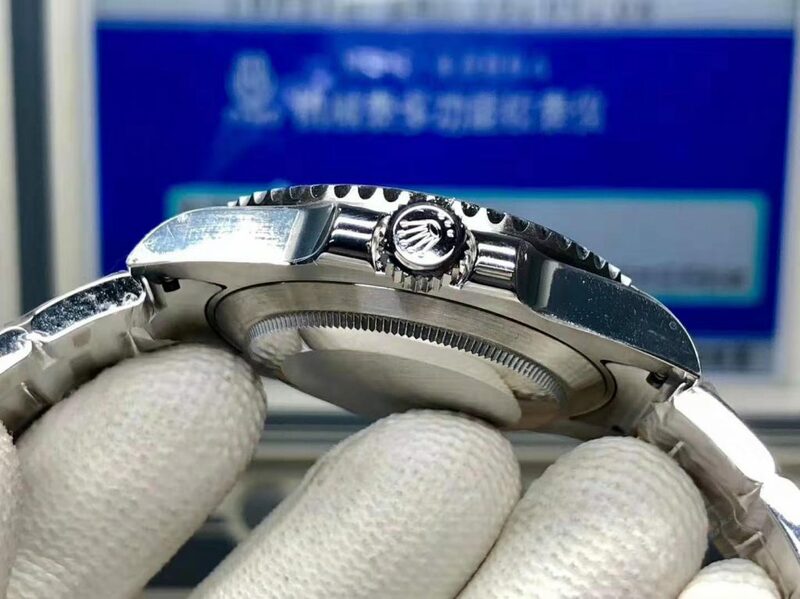 By the way, the replica is also made by N factory, which is the pioneer that has been manufacturing such high quality replica Rolex for years. 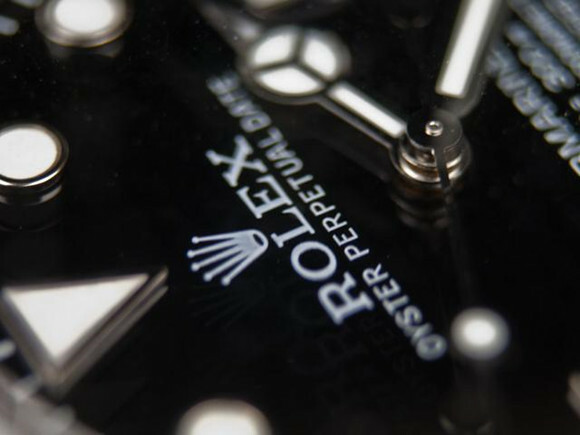 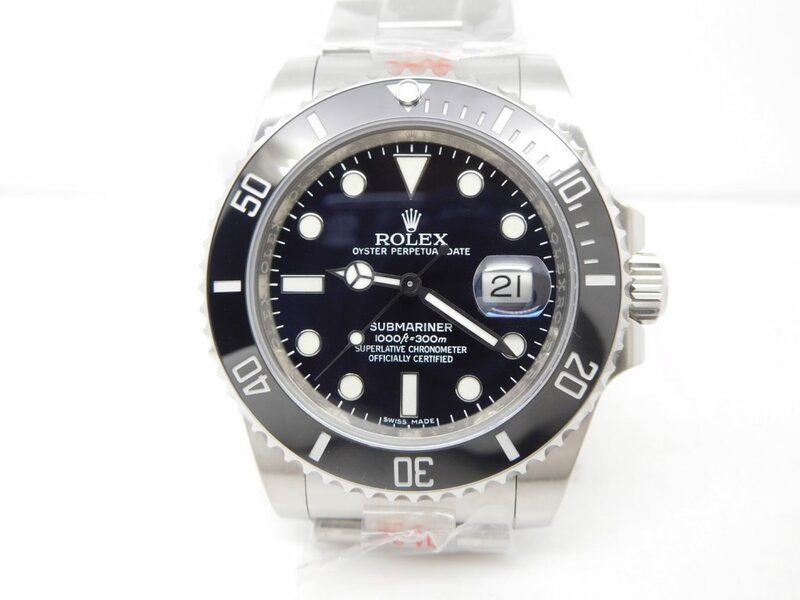 Rolex Submariner, which has been a popular watch model for decades, is regarded as a classic. 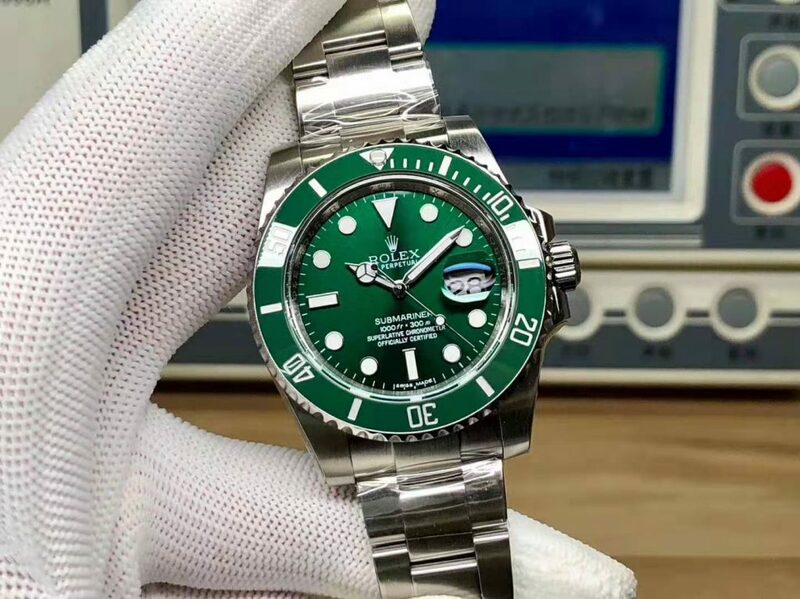 And in fake watch industry, with the progress made in technology, the replicas of Rolex Black and Green Submariner are also being improved. 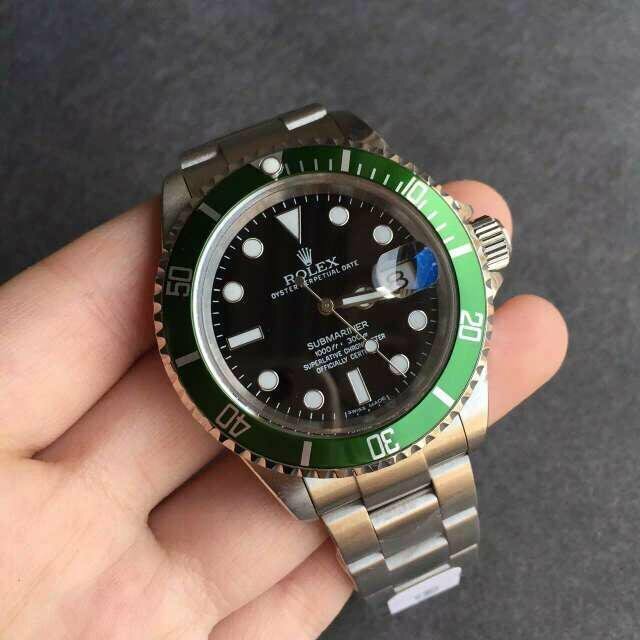 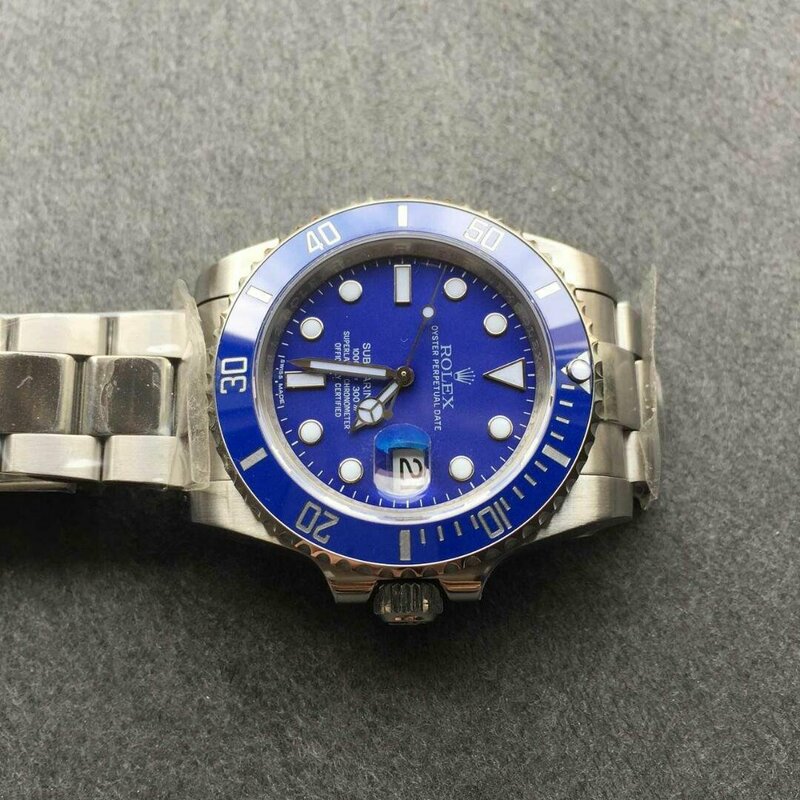 This time, as the new generation of Submariner, V6s version only only has improvement. 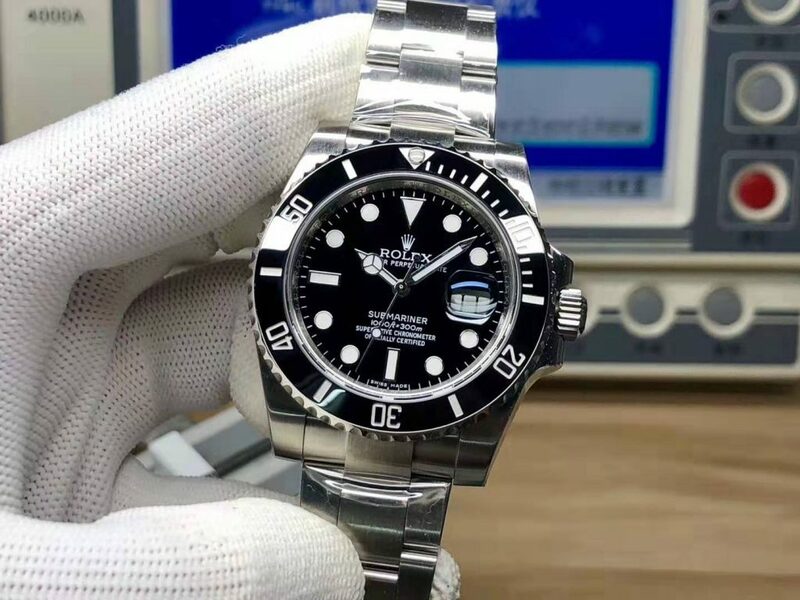 The V6s Black Submariner has brand-new casing and crystal, its movement is also modified, it totally meets the expectation of many Noob V6 Submariner fans. 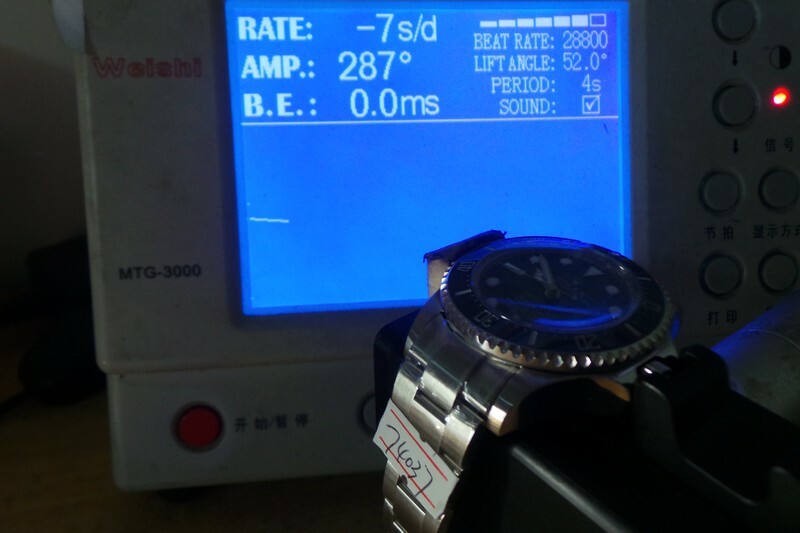 Here I am going to introduce its improvements made upon the previous V5 version. 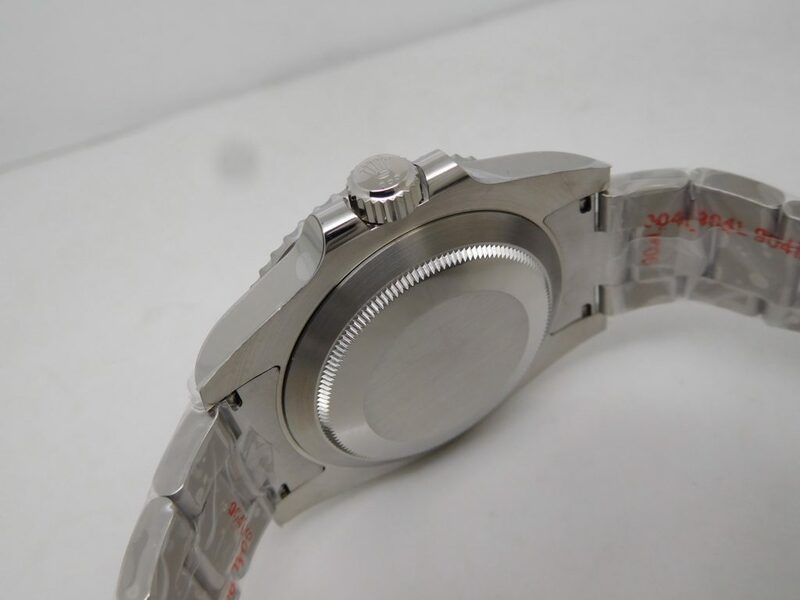 First, V6s has a better crystal, which is as flat as genuine. 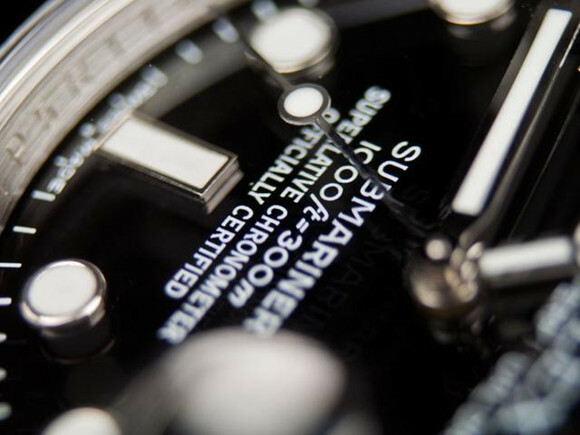 V5 is more convex. 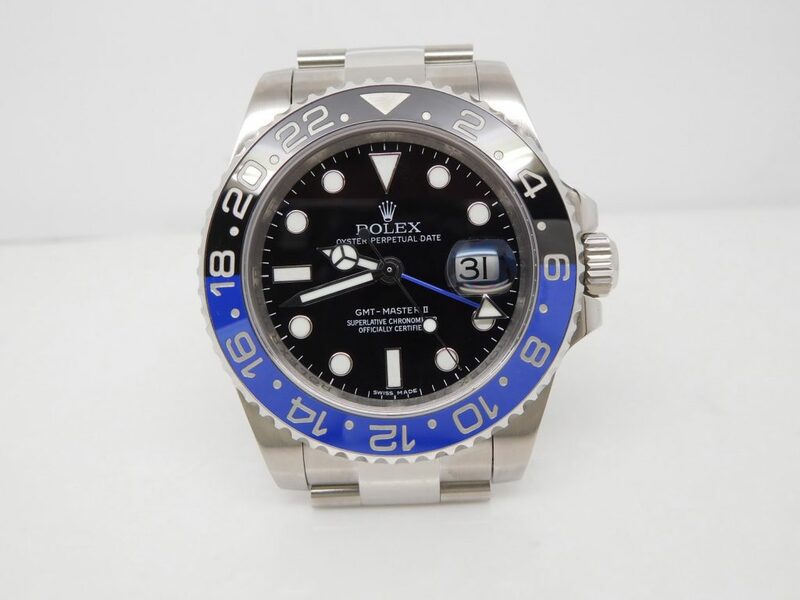 The markers on black ceramic bezel. 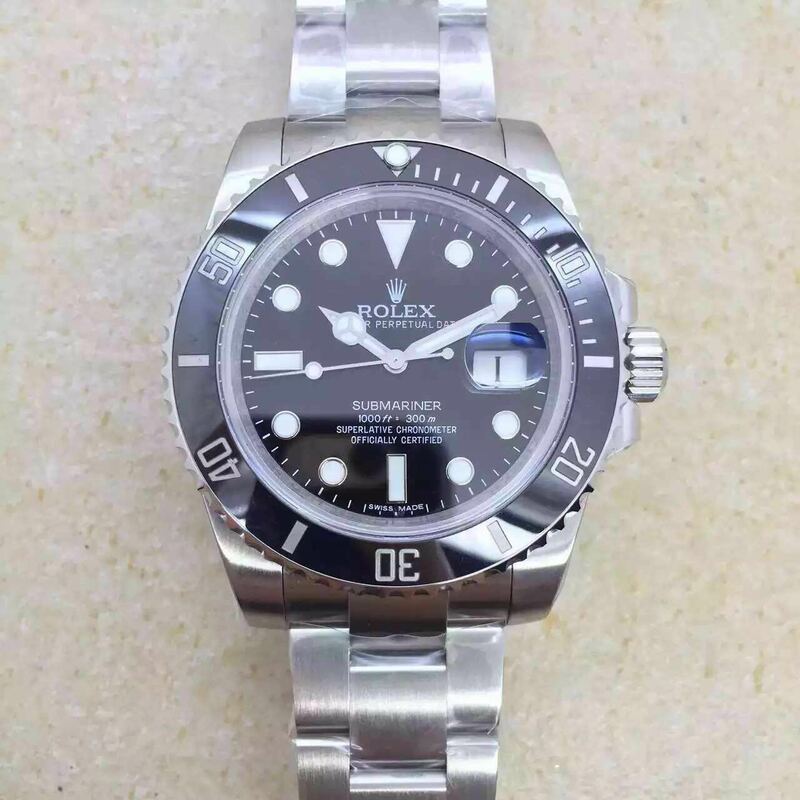 V6s is silver grey, so is the genuine. 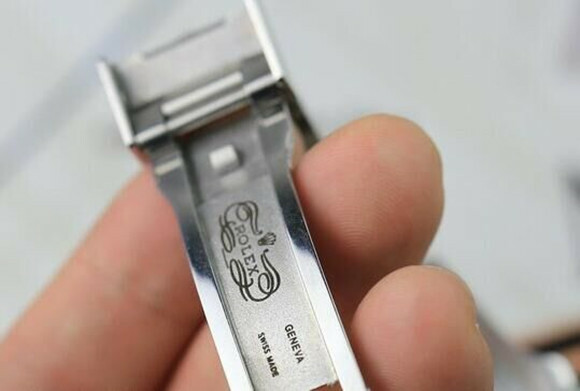 And the markers engraving is deeper and thicker. 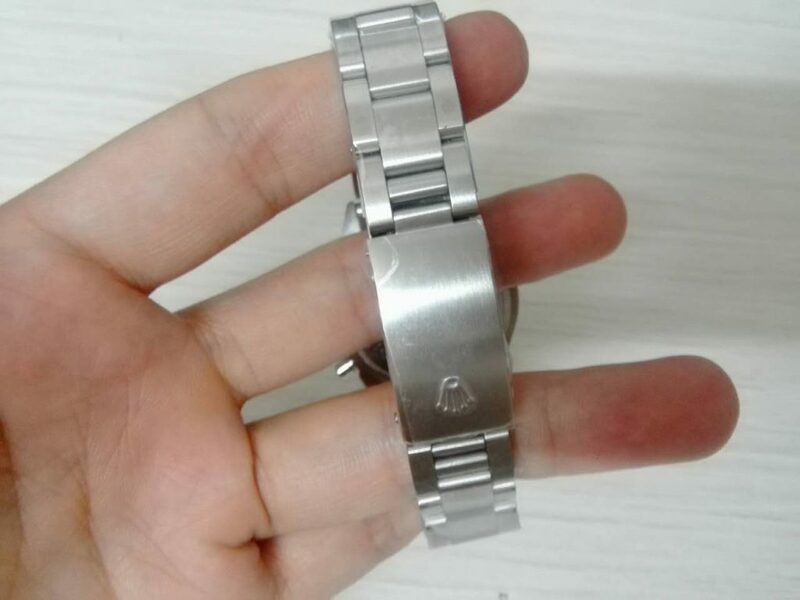 The axis of the second hand is more delicate and the same as genuine. 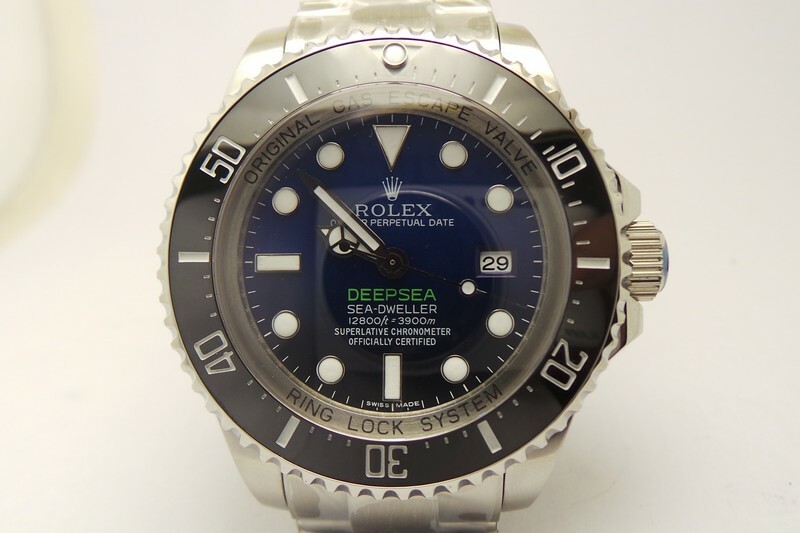 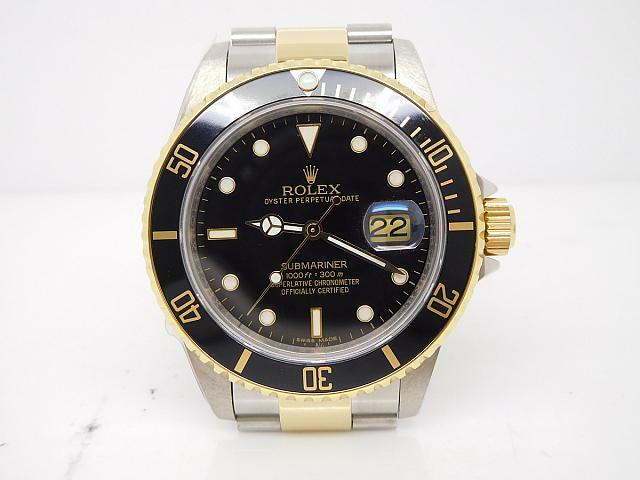 The dial is always one of the standards to tell fake Rolex, like the printing “1000ft=300” on this replica Submariner V6s, it also has a little difference with the genuine, but closer to genuine than other versions. 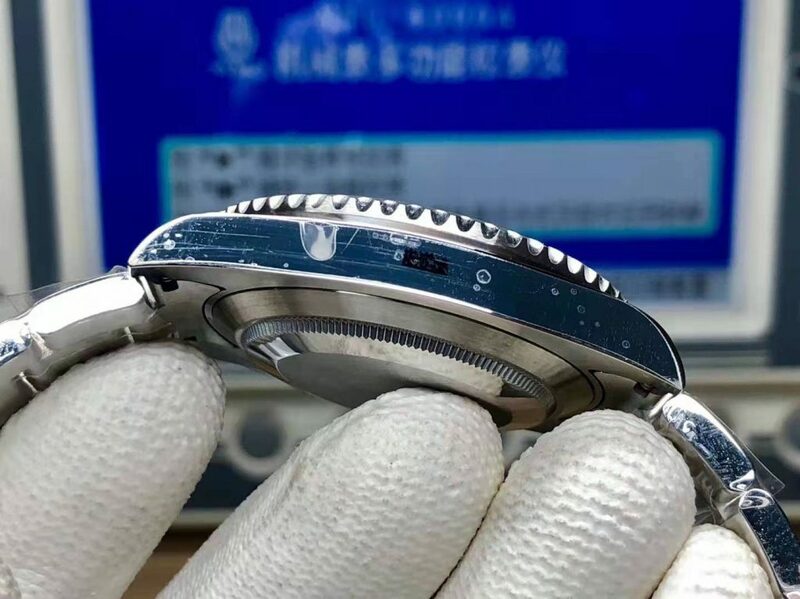 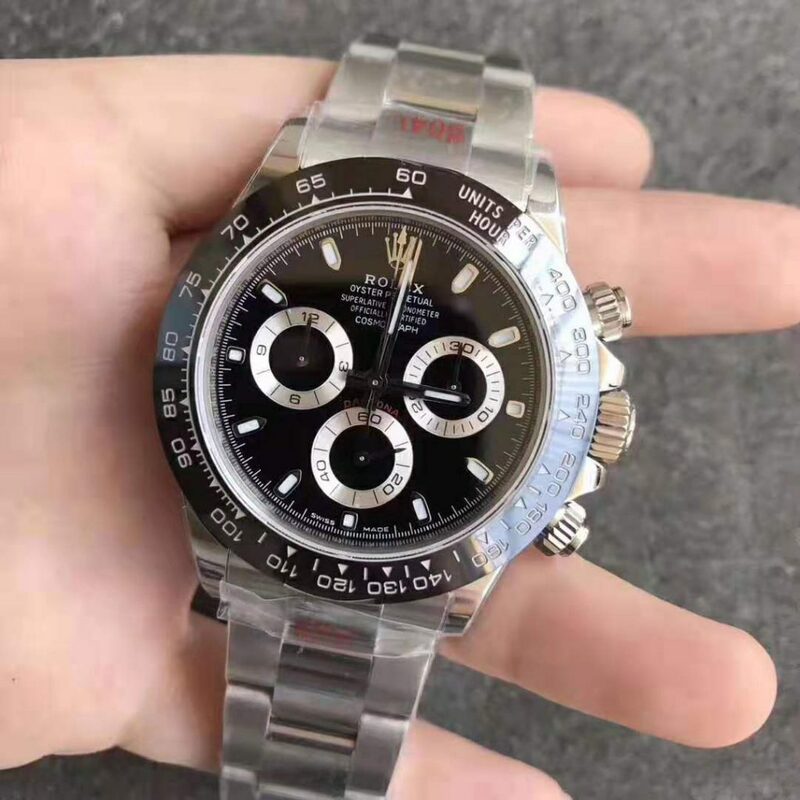 About the V6s Noob factory released, they are fitted two types of dial, each is equipped with Super 3135 or 2836 movement, each dial version is correct. 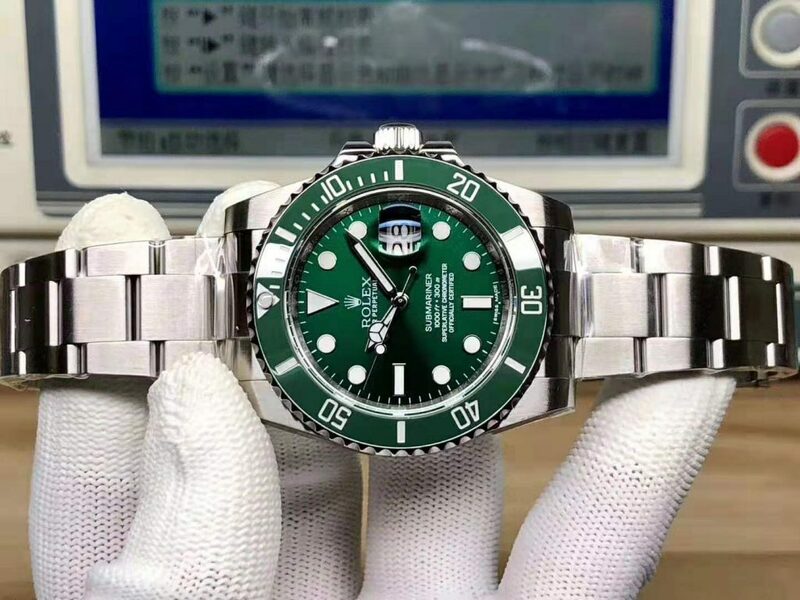 The letter M of word “SUBMARINER” is also improved. 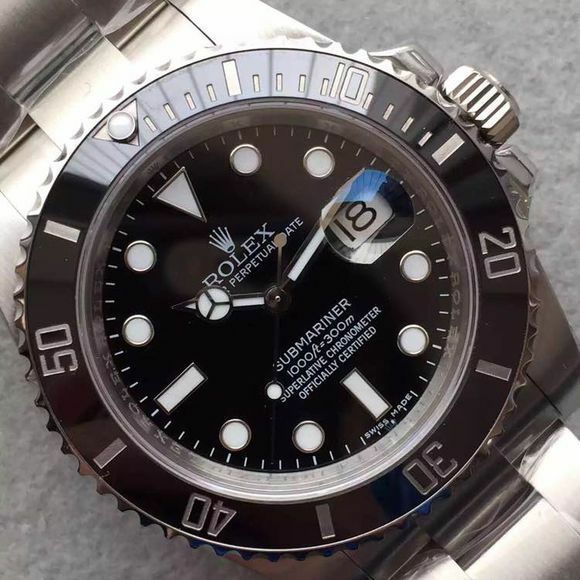 The digits “1000” and “300” have more round “0”, rather other the oval shape on V5. 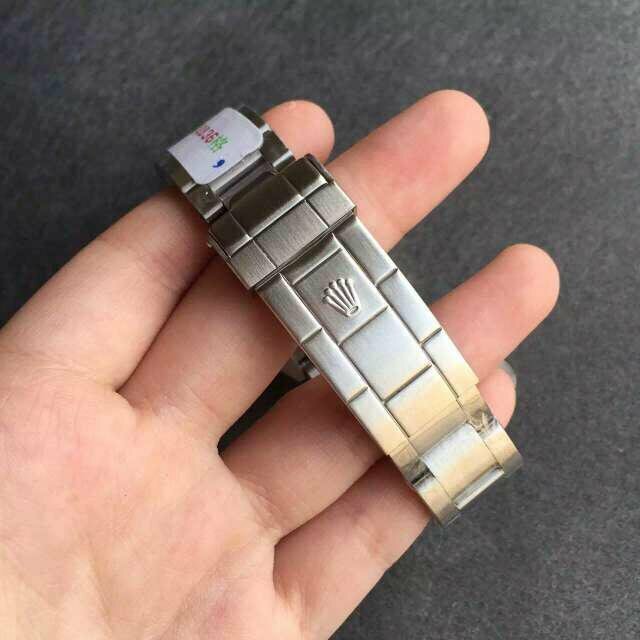 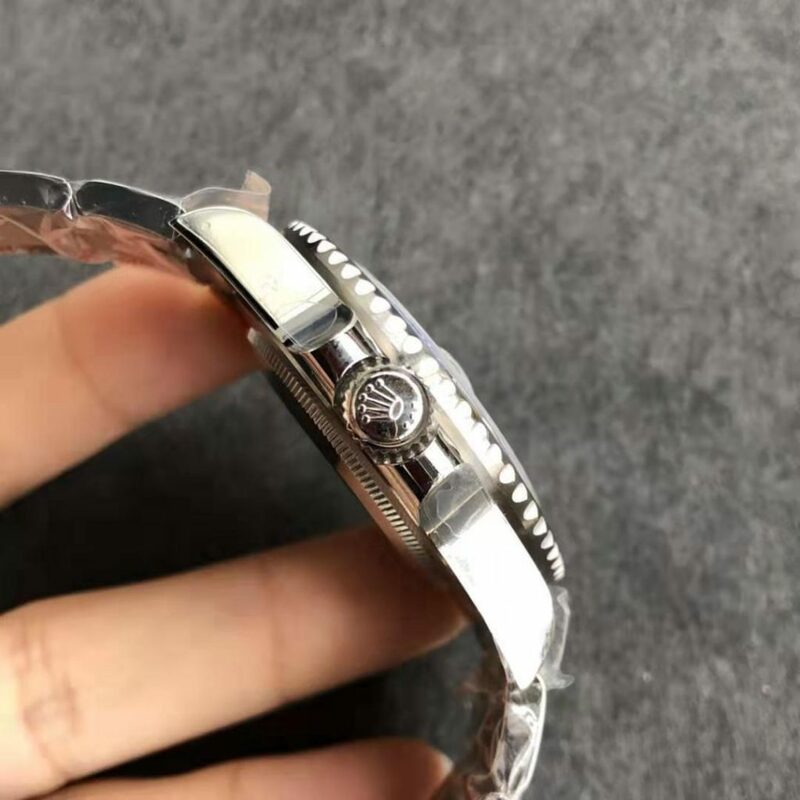 The Rolex Crown Logo on bracelet is more elegant. 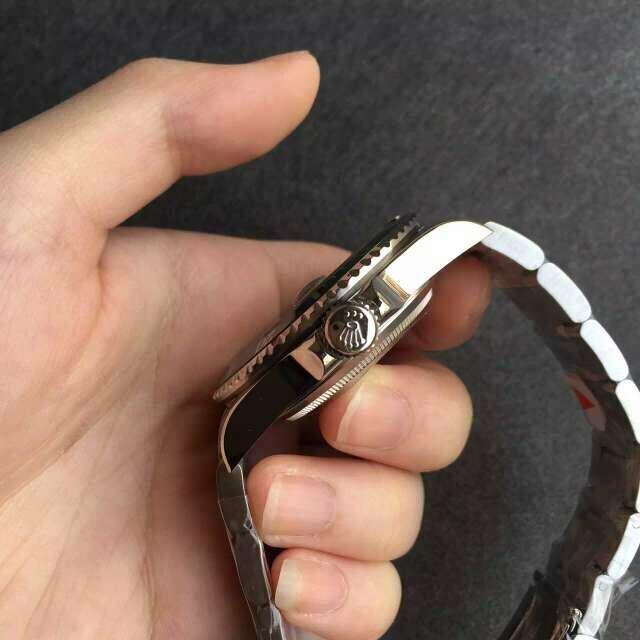 Because V6s uses the brand new moulds, its bezel tooth has a wider mouth and looks more rounded. 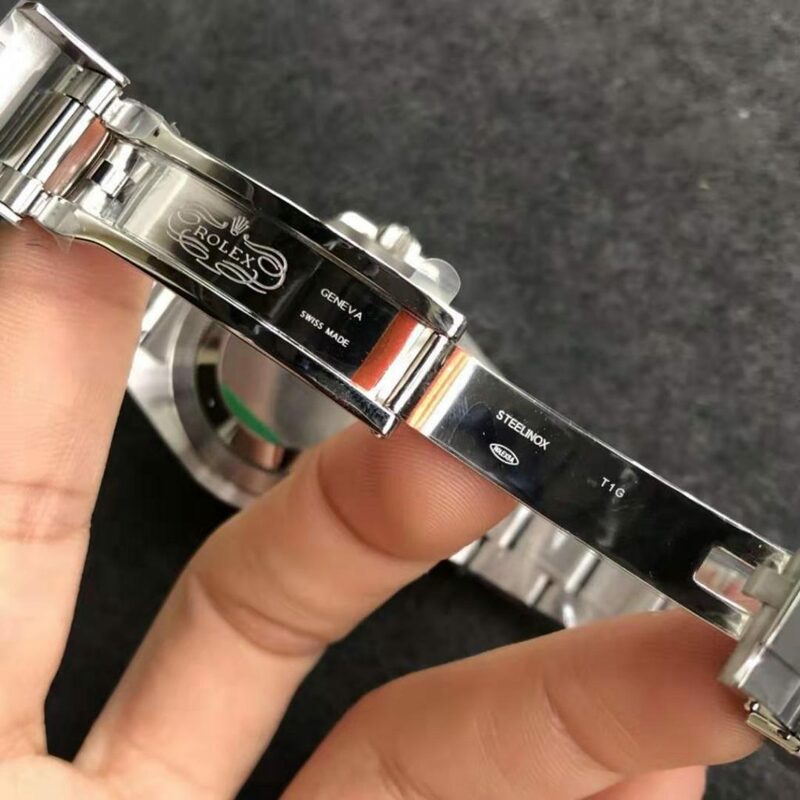 The case side has an anti-counterfeit label like the genuine, does it give you a genuine feeling? 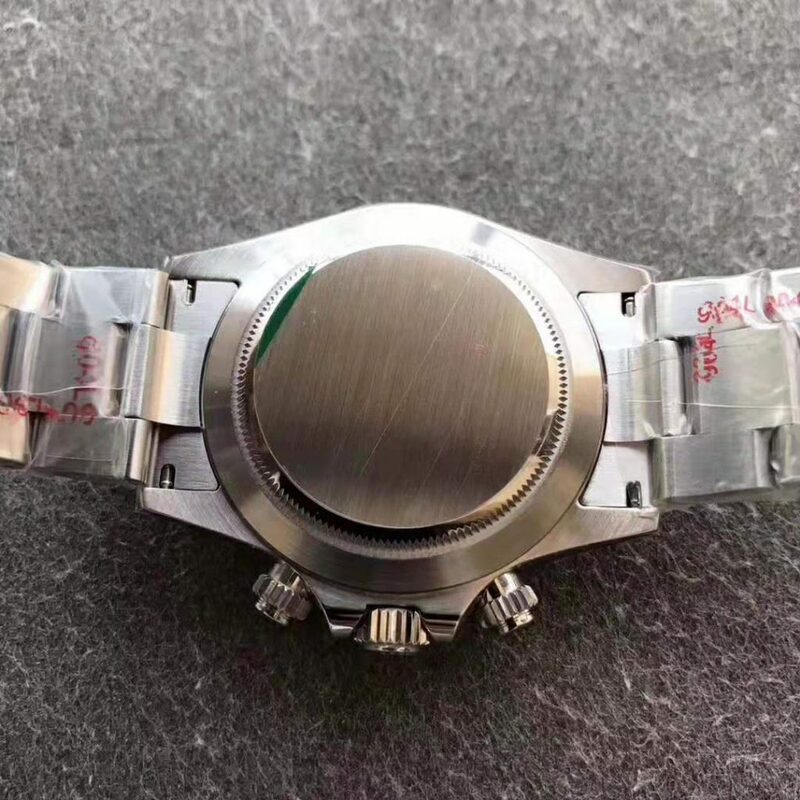 At last, see the movement on the replica V6s Submariner, it uses Super Clone 3135 movement, the shock absorber has been modified. 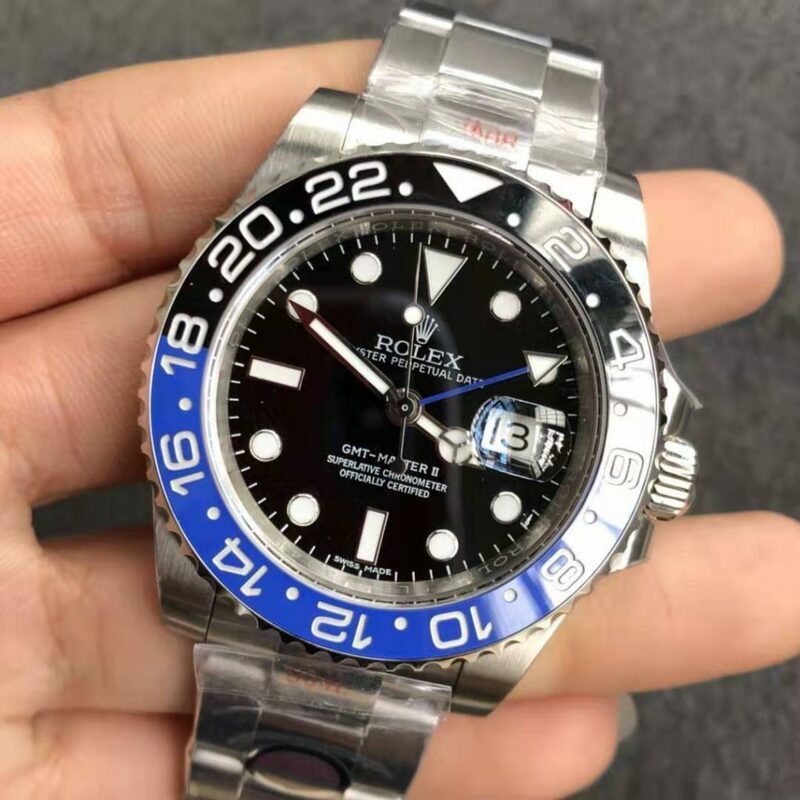 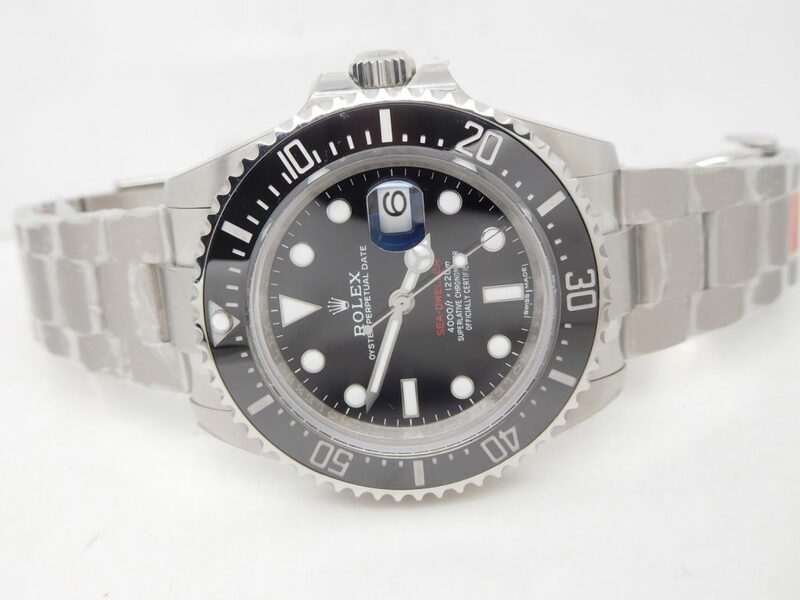 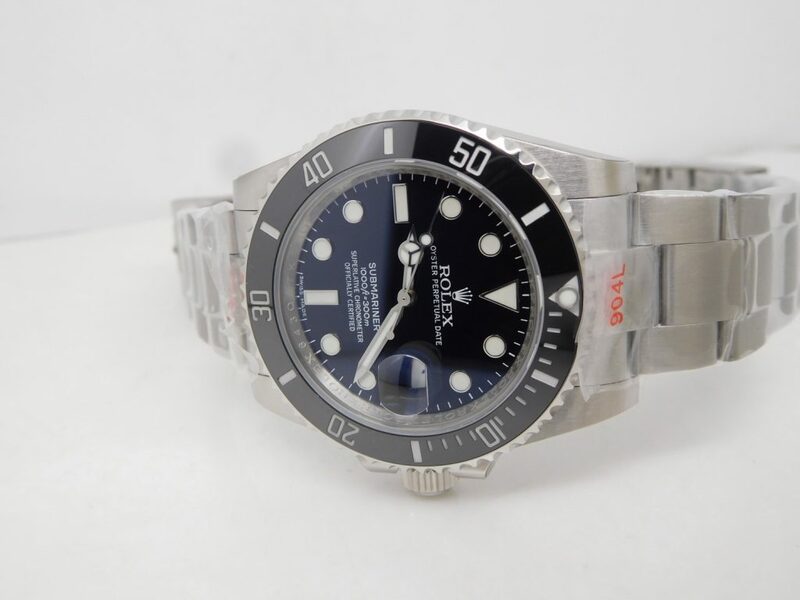 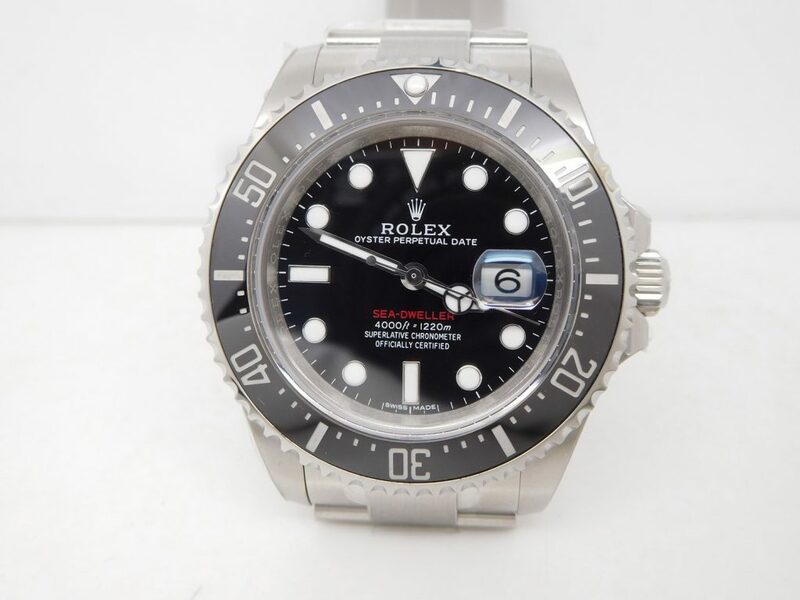 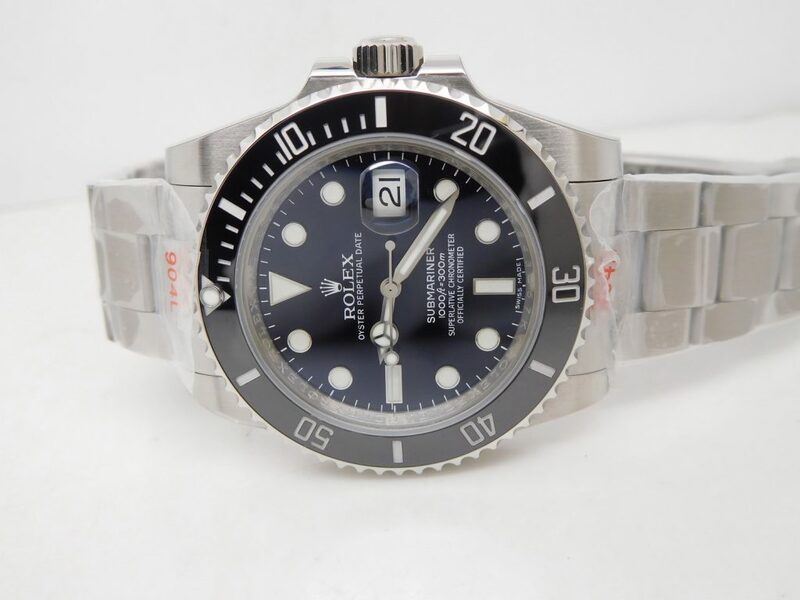 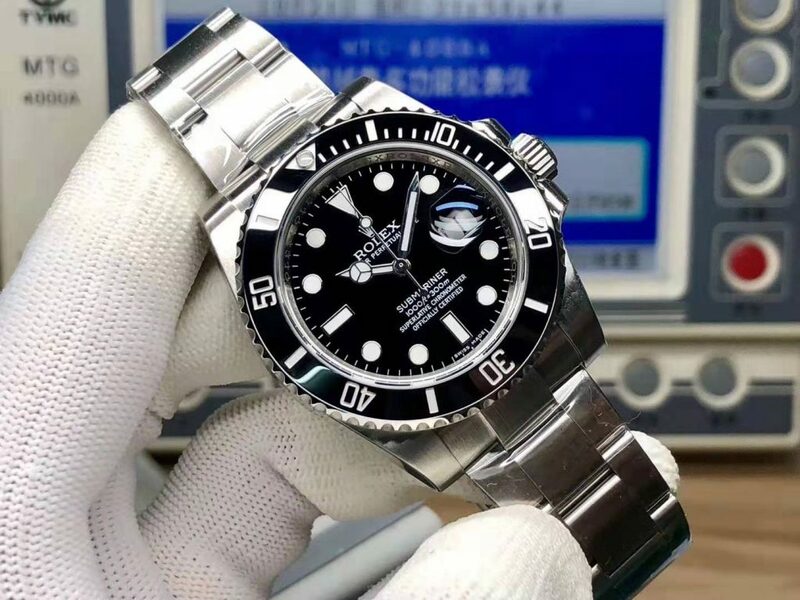 The modified Black Submariner V6s is perfect, it is a good choice for people who love Submariner. 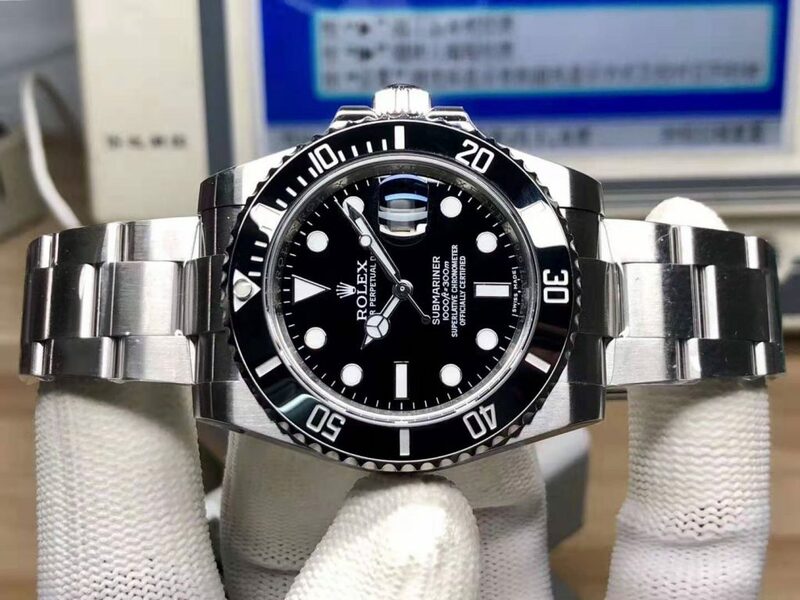 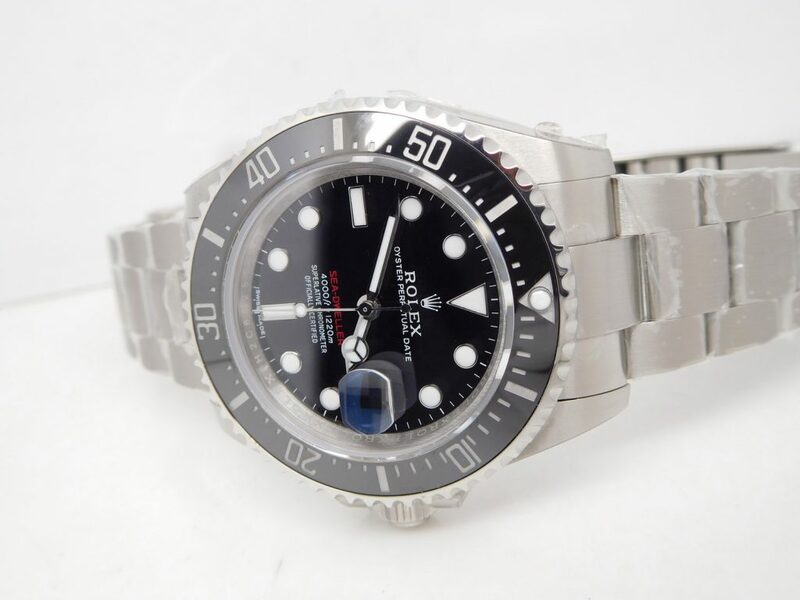 Although you could pick up some tiny difference with a magnifier, you can not deny this one is the best replica Submariner that is closest to genuine. 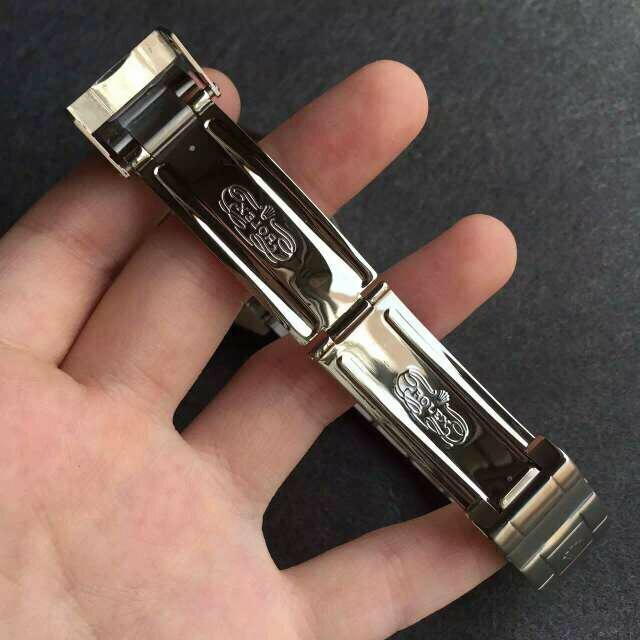 Because the first batch released by Noob factory is in limited quantity, so you guys who want to buy must be hurry.